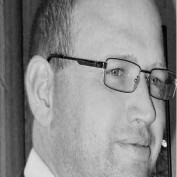 Colin Quartermain is a part-time writer from England. On Hubpages you are most likely to find him about Greek or Roman mythology, History or Sherlock Holmes. Ultimately Colin writes to learn. 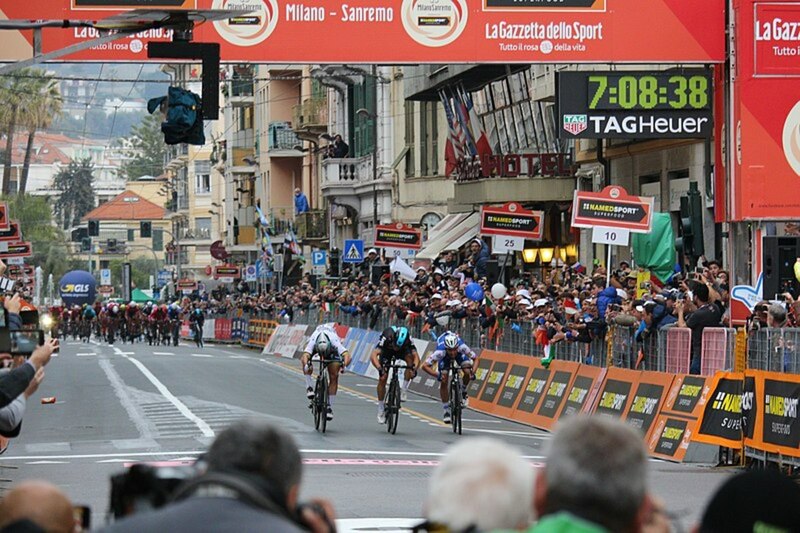 What Are Cycling's Monument Races? The Monuments is the collective name for five one-day races organised by the UCI. 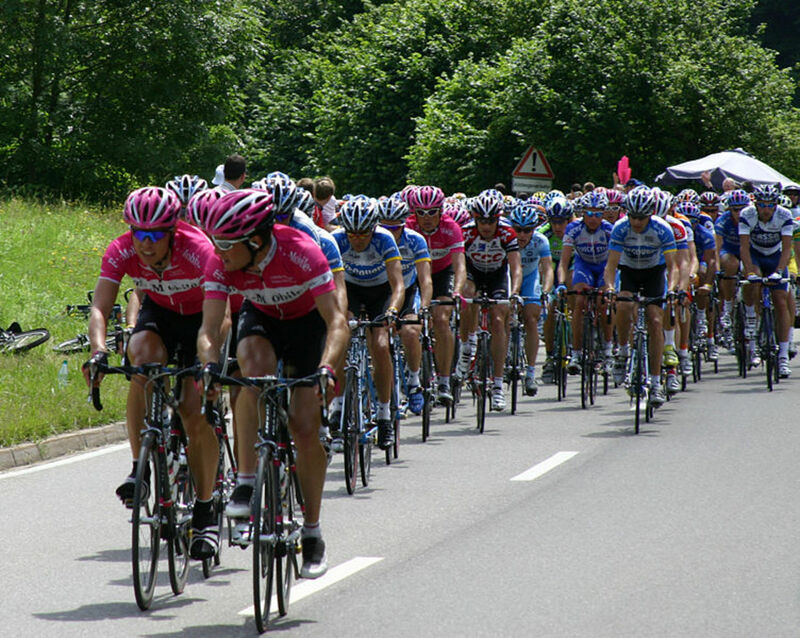 Cycling's Monuments are five Classic cycling races the Milan-San Remo classic, the Tour of Flanders, Paris-Roubaix, Liège-Bastogne-Liège, and the Giro di Lombardia. Professional cycling is now a truly international sport, but many terms used in the sport—and especially commentary upon it—are words from the French vocabulary, with words such as Peloton, Domestiques and Bidons commonly used. 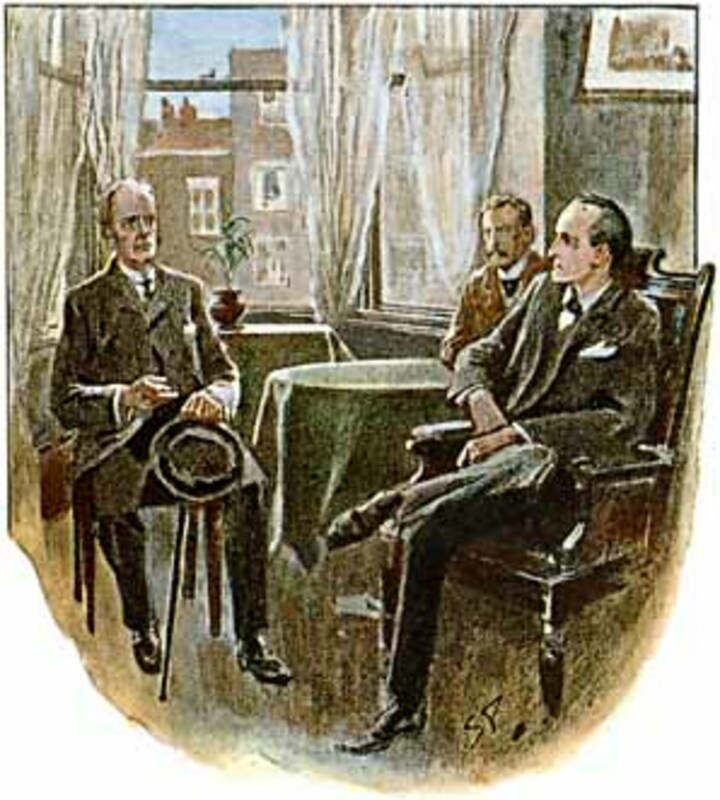 The Adventure of the Three Students is a short story written by Sir Arthur Conan Doyle which sees Sherlock Holmes in a university town dealing with a potential cheating student with an exam imminent. The Adventure of the Six Napoleons is a short Sherlock Holmes story dealing with what at seems as first a case of vandalism, but the destruction of busts of Napoleon soon leads to murder. 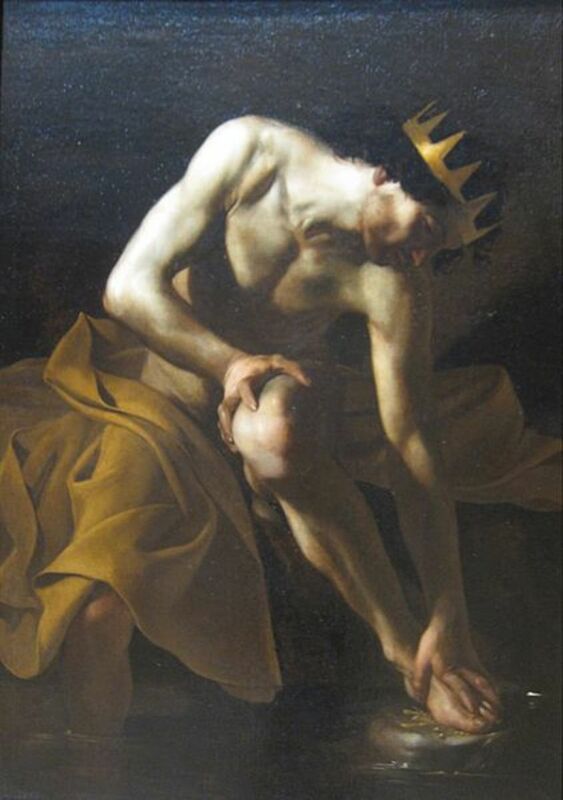 King Eurystheus was a king of Mycenae in Greek mythology, but more famously he was an antagonist of Heracles, and the man who set the Greek hero his Twelve Labours. 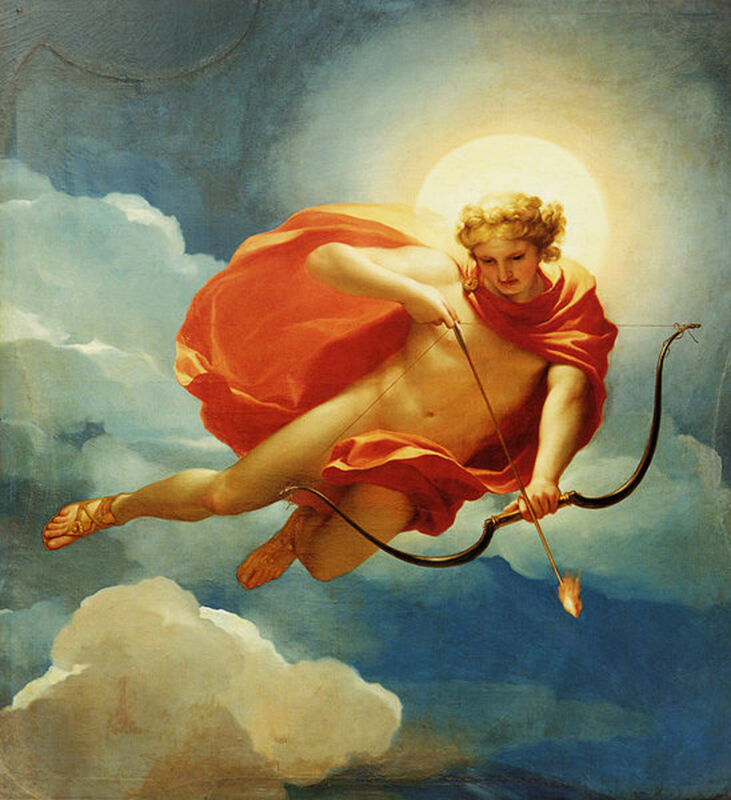 Helios was one of the gods of the Greek pantheon, and indeed Helios was the Greek god of the sun for it was Helios who travelled across the sky in his golden chariot. The Erinyes were goddess of retribution in Greek mythology. 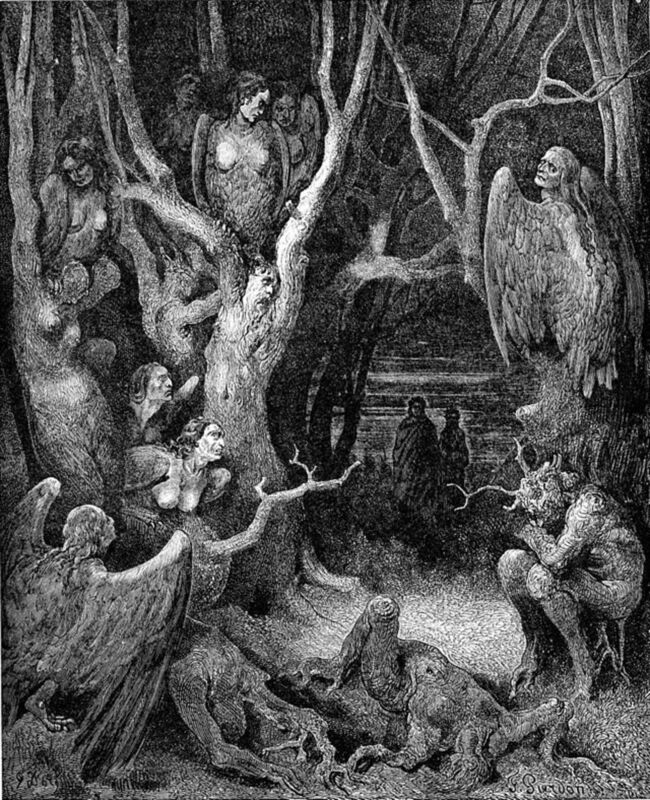 Also known as the Furies, the Erinyes would pursue those who had broken the law, especially murderers, torturing them and causing madness. 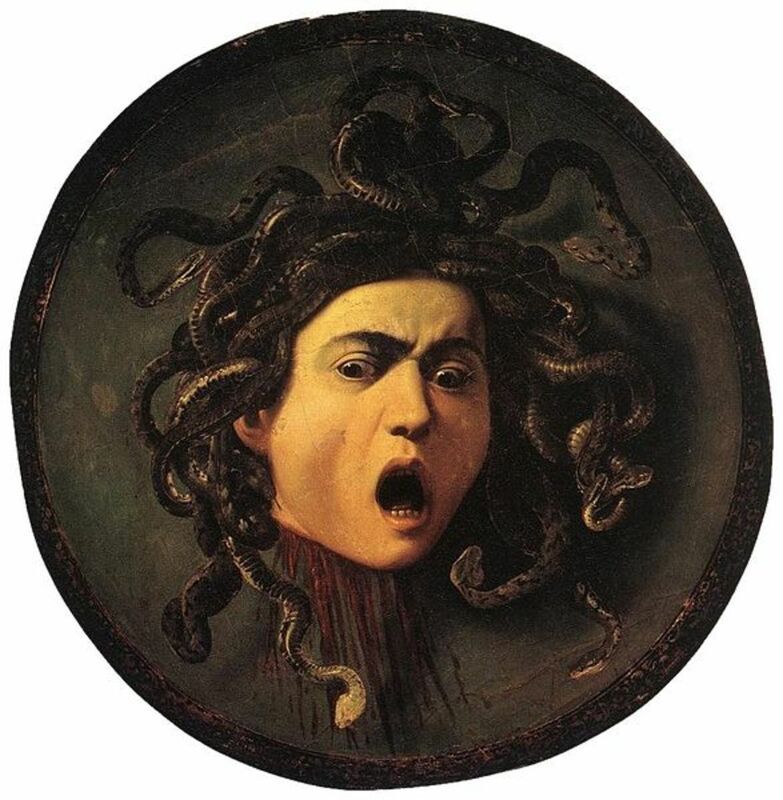 The Gorgons are some of the most famous monsters of Greek mythology, and of course the Gorgon Medusa is instantly recognisbale with hair of snakes and gaze that would turn man to stone. The Adventure of Charles Augustus Milverton is a short Sherlock Holmes story written by Sir Arthur Conan Doyle, and sees the detective dealing with the most notorious of all blackmailers. 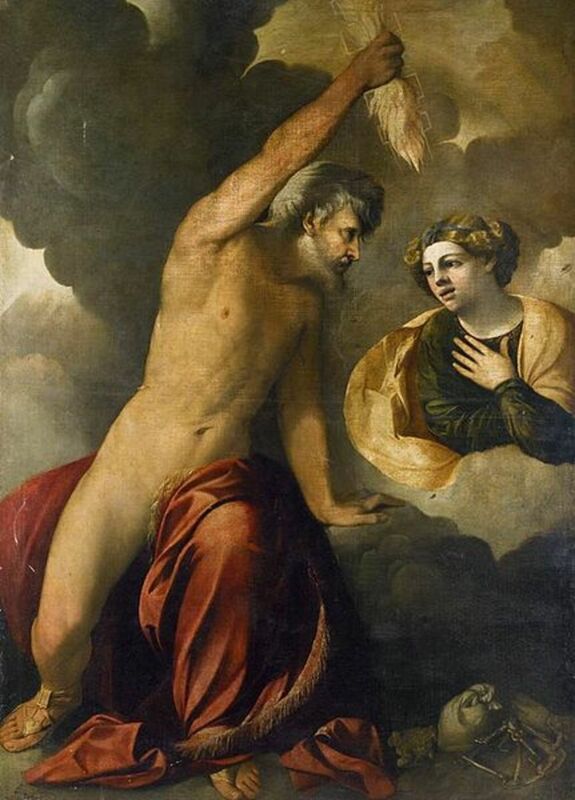 Oedipus is a famous name from greek mythology, famed for ridding Thebes of the dangerous Sphinx, but there was a darker side to the hero as well for he would kill his father and marry his mother. The gift of prophecy and seers played an important role in Greek mythology, and one of the most improtant was Calchas who was prominent during the Trojan War, and indeed was the seer of the Greeks. 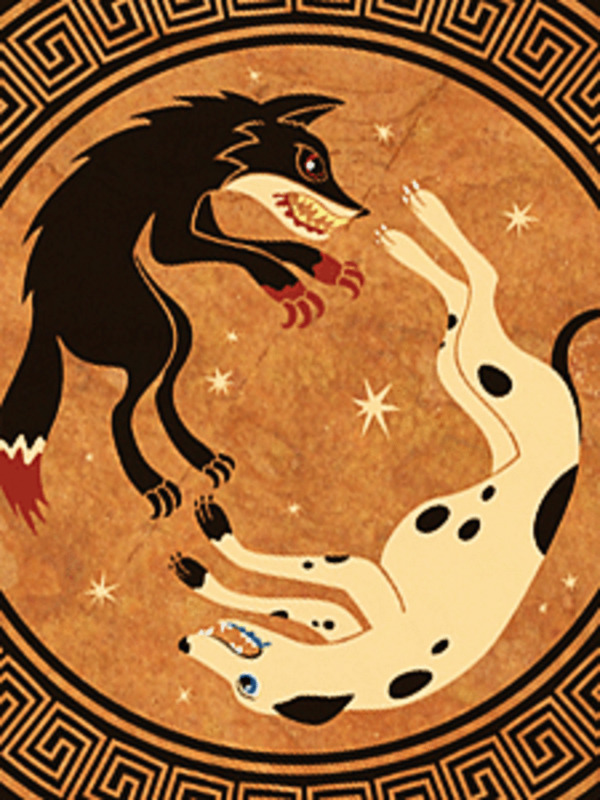 Laelaps and the Teumessian Fox were two of the mythological creatures of ancient Greece, Laelaps was a dog who always caught what he chased, and the Teumessian Fox would always evade capture. 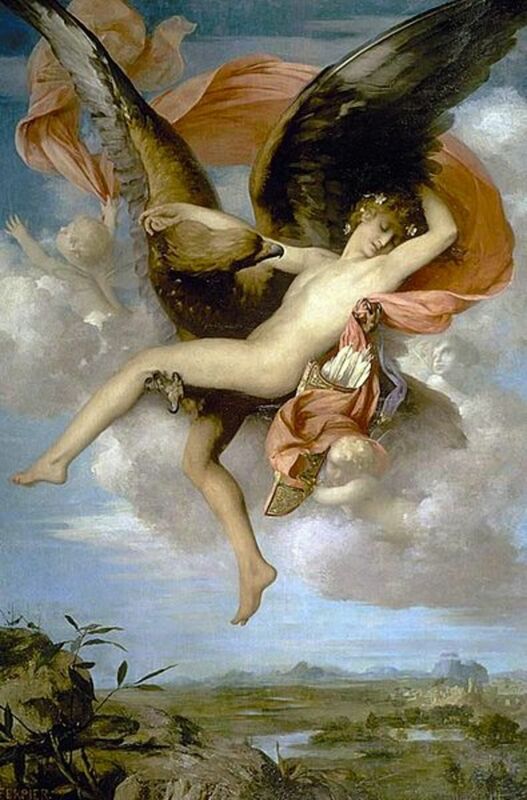 Rhea was an important goddess of the Greek pantheon, and yet she is often overlooked. 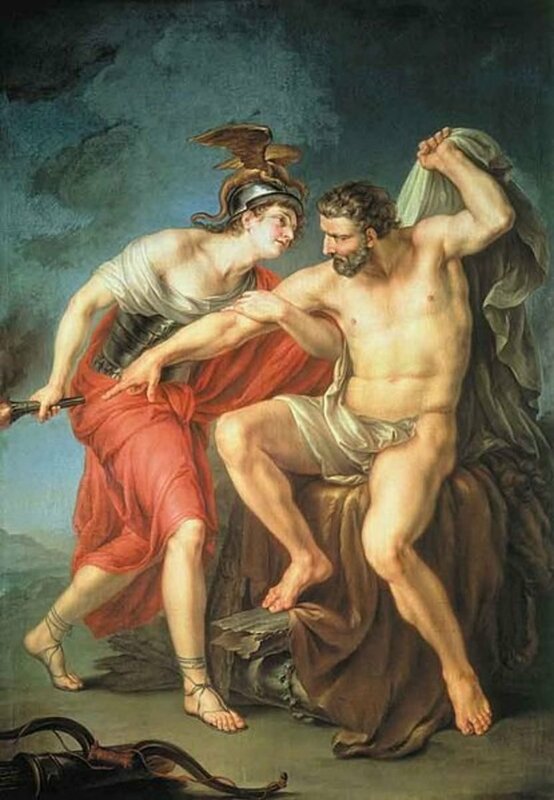 Rhea was a gooddess of the Golden Age, a Titan, and the wife of Cronus, importantly she was also mother of Zeus. King Midas is a figure from Greek mythology whose story is still used in modern day as cautionary tale about greed and getting what you wished for, for Midas was given the Golden Touch. 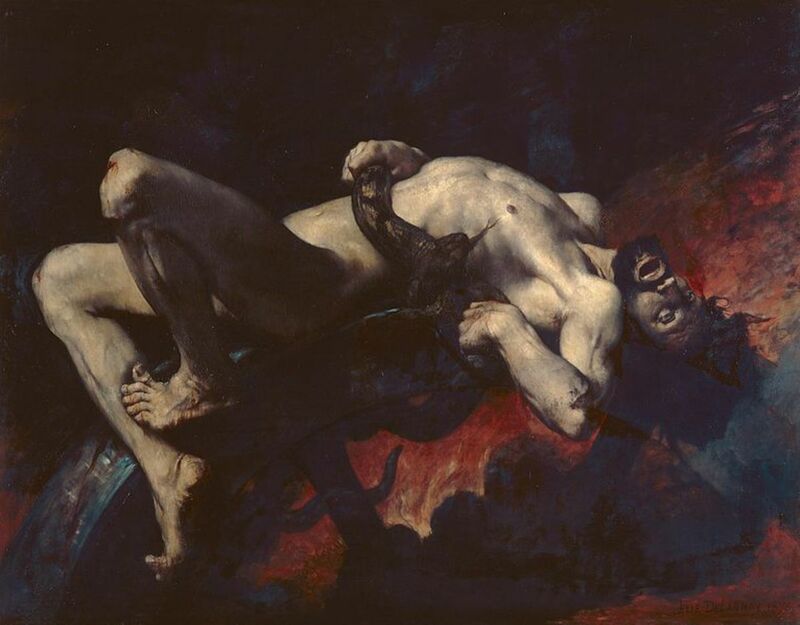 Ixion was a legendary king of the Lapiths in Grek mythology, from a seat of power is downfall was only completed when he faced eternal punishment in Tartarus. The Adventure of Black Peter is a Sherlock Holmes case that sees the detective investigate the murder of the former sea captain, a murder committed with the unusual weapon of a harpoon. 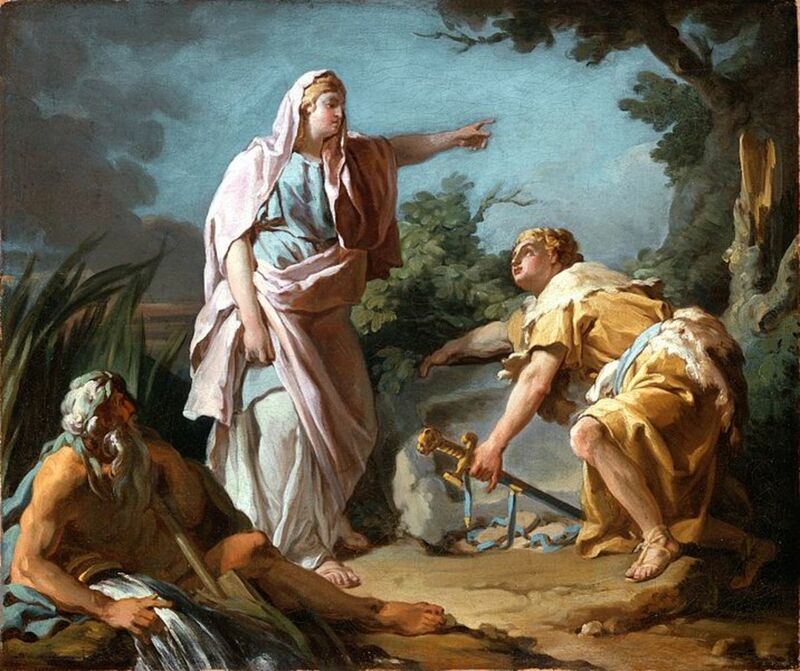 Iphigenia was the daughter of King Agamemnon in Greek mythology. 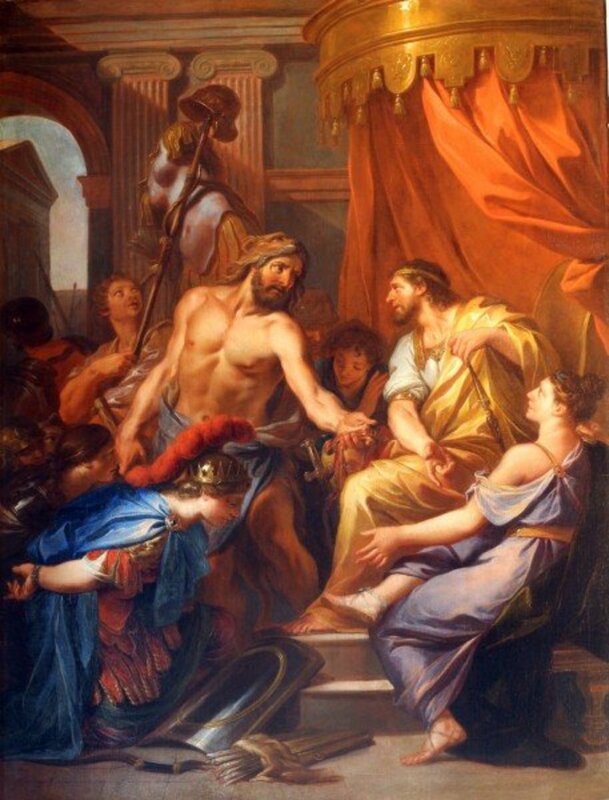 Agamemnon was famously the leader of the Greeks at Troy, but in order to get there, Iphigenia had to be sacrificed. The Danaids were the 50 daughters of Danaus, and were often depicted imprisoned in Tartarus. In Tartarus they would carry water in a futile attempt to fill a leaking bath. Pirithous was a hero from Greek mythology, a companion of Theseus and a contemporary of Peleus. 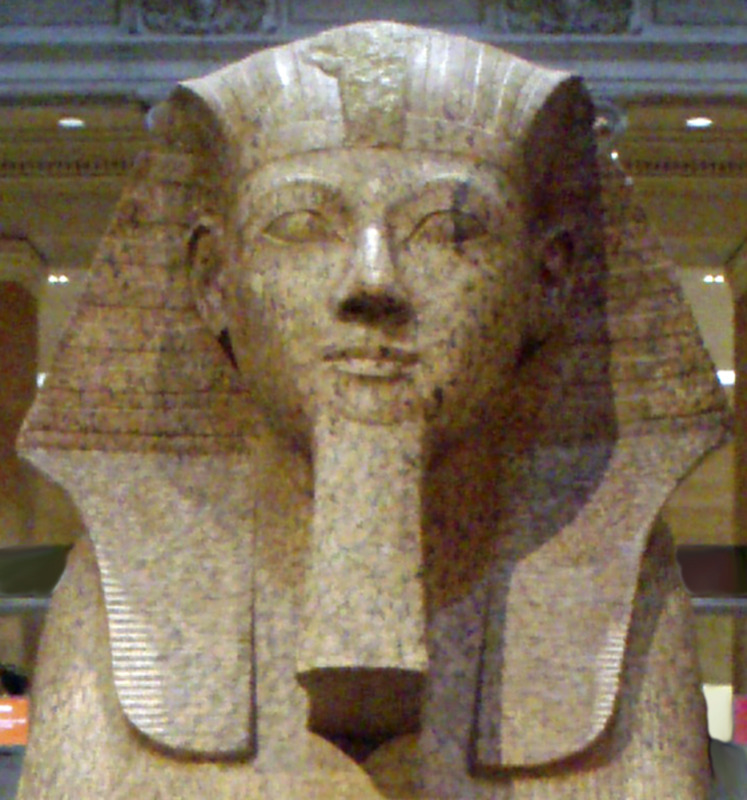 Pirithous was also King of the Lapiths. Minos was one of the most famous kings of Greek mythology. King Minos was the king of Crete, a son of Zeus, and husband of Pasiphae; famously though, he was also the king encountered by Theseus. Icarus is famed as the boy who flew too close to the sun, and this is story from Ancient Greece. 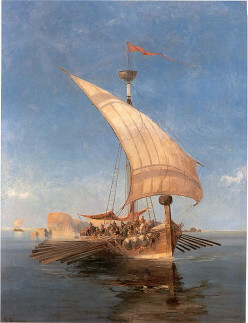 In Greek myths, Icarus was the son of the noted inventor Daedalus, and his story begins on Crete. The Argonauts was the colelctive name of the heroes who crewed the Argo on its journey to Colchis to gain possession of the Golden Fleece; amongst their number were many famous individuals. The Adventure of the Priory School is a Sherlock Holmes story that sees the detective investigating the disappearance of the young Lord Saltire, a disappearance that is soon linked to a murder. 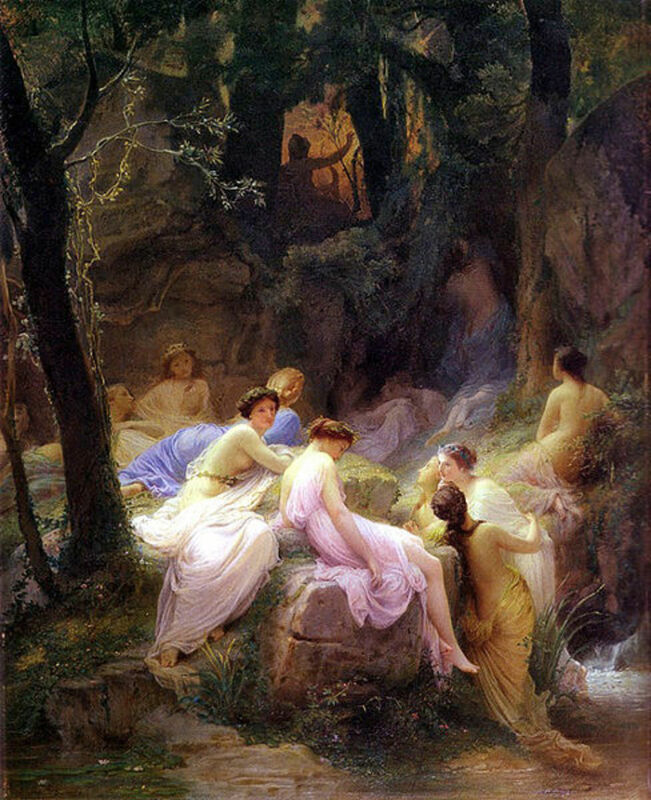 The Nymphs, or Nymphai, were the minor goddesses of Greek mythology. 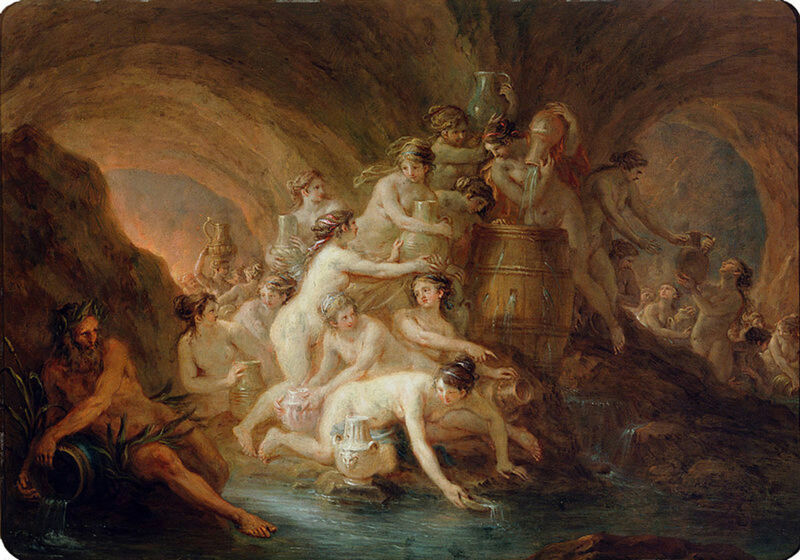 The nymphs were closely associated with elements of nature, ensuring the growth of plants and trees and the cleanliness of water. The capturing of one of the Mares of Diomedes was a task allotted to the Greek hero Athens. The Labours set by King Eurystheus would number 12, with the Mares of Diomedes being task being the eighth. 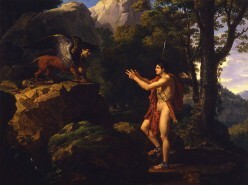 The Caucasian Eagle was a gigantic bird encountered by the Greek hero Heracles in his travels. The Caucasian Eagle was a tool of Zeus though, used by the supreme god in the punishment of Prometheus. 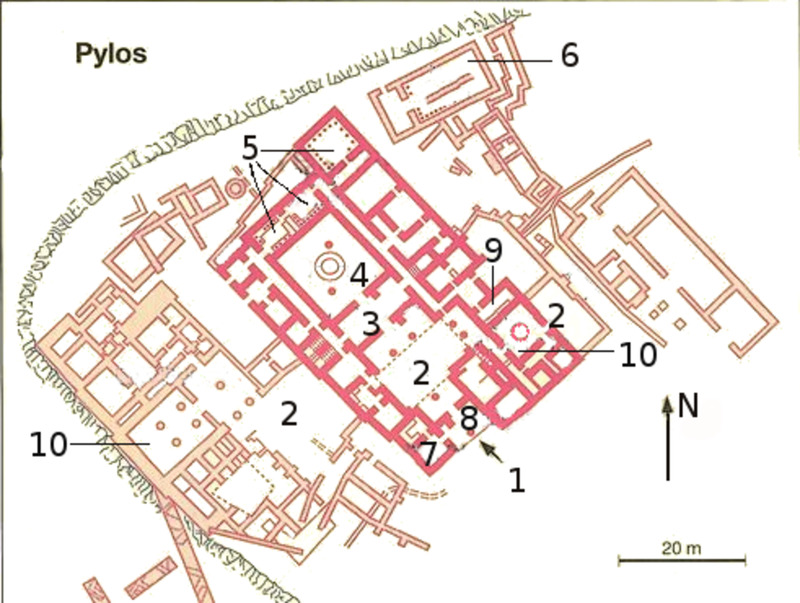 The Augean Stables were enormous cattle sheds owned by King Augeas. 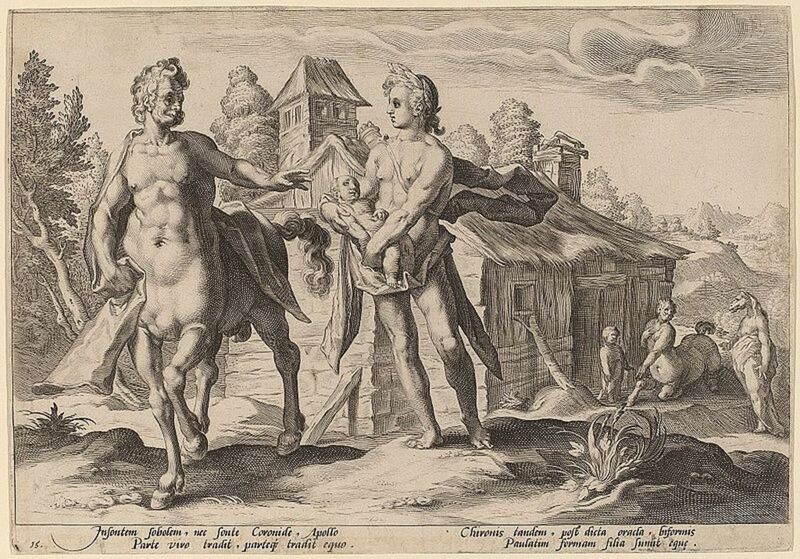 They would come to prominence in Greek mythology when Heracles was tasked with cleaning them in a single day. 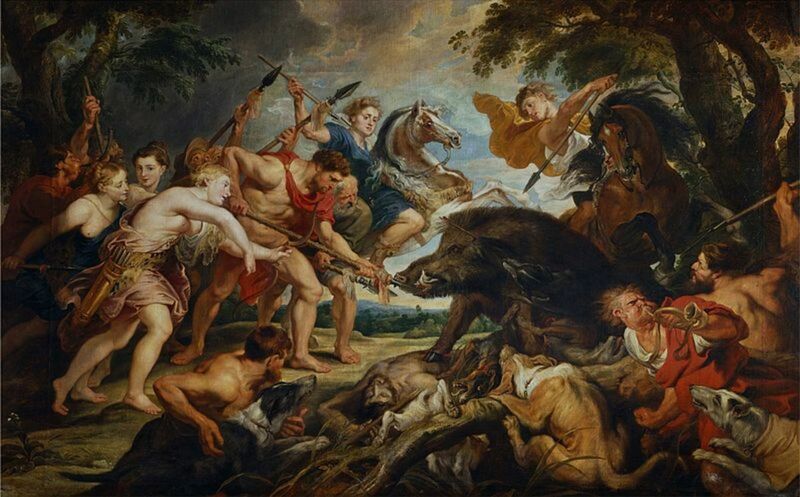 The Erymanthian Boar was a gigantic hog said to ravage the Greek countryside in Greek mythology. 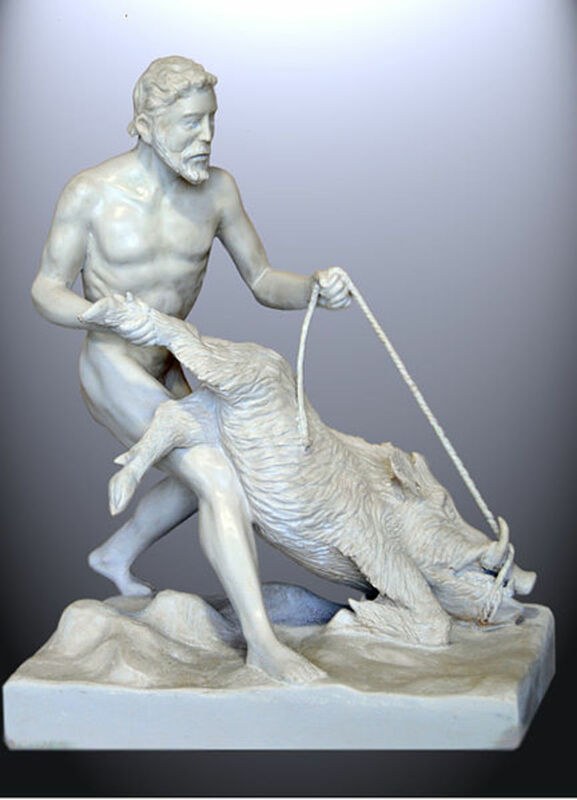 The Erymanthian Boar would eventually be encountered by Heracles as the hero undertook his Labours. The Ceryneian Hind was a deer from the tales of Greek mythology. Faster than a shot arrow, the hind was thought to be uncatachable, and so Heracles was tasked to bring it back to King Eurystheus. Epimetheus was a second generation Titan in Greek mythology, and a brother to the more famous Atlas and Prometheus. 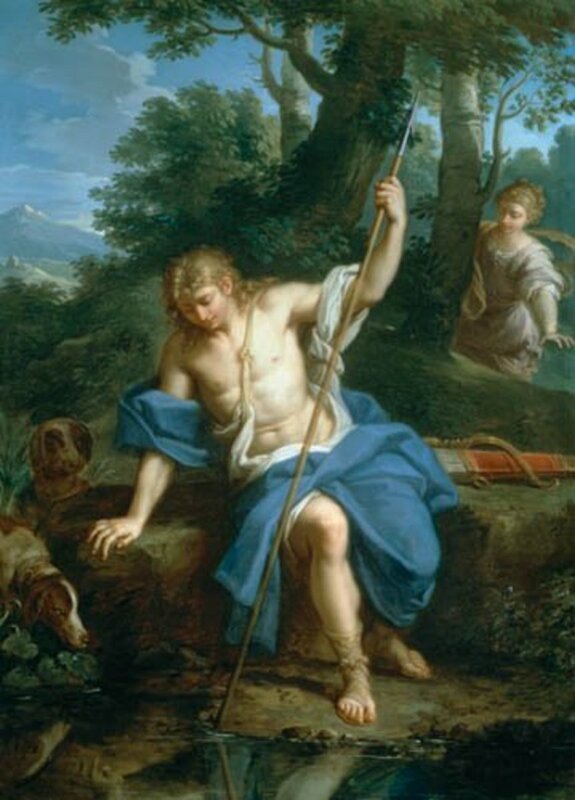 Epimetheus' name means Afterthought, and his story deals with the creation of man. Semele was a Theban princess, a daughter of Cadmus, but she would come to prominence when Zeus spied her. Zeus would take Semele as his lover, and from the relationship would come forth Dionysus. 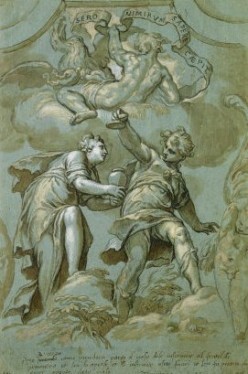 In Greek mythology Ambrosia and Nectar were the food and drink of the gods. 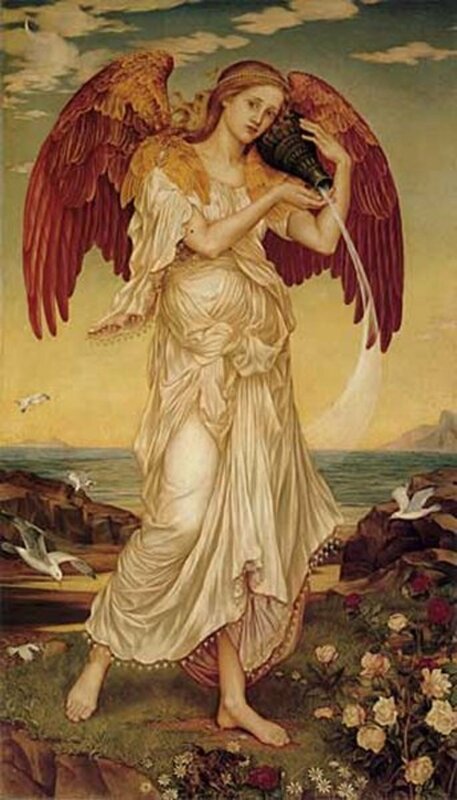 Ambrosia and Nectar were served by Ganymede as both a food substance and also as a restorative. 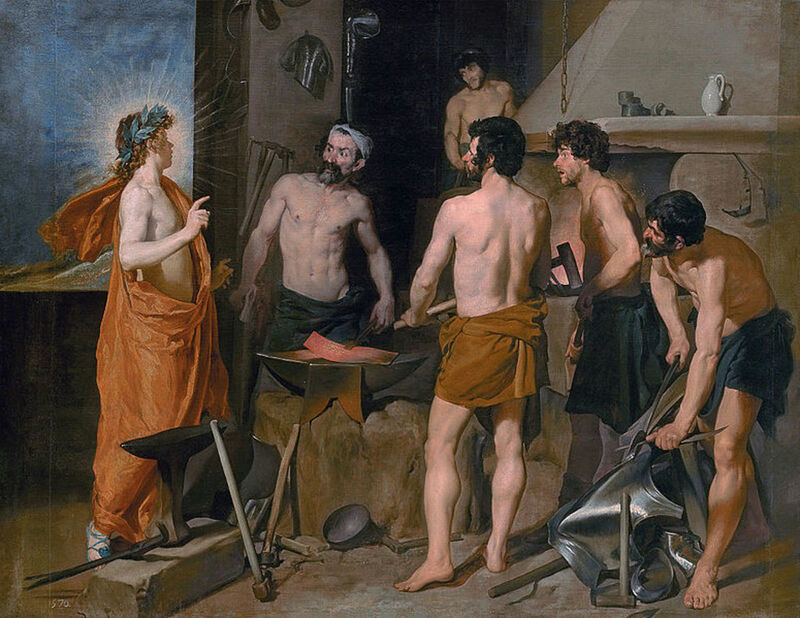 Hephaestus was the Greek god of Fire and Metalworking, and one normally equated with Vulcan from Roman Mythology. 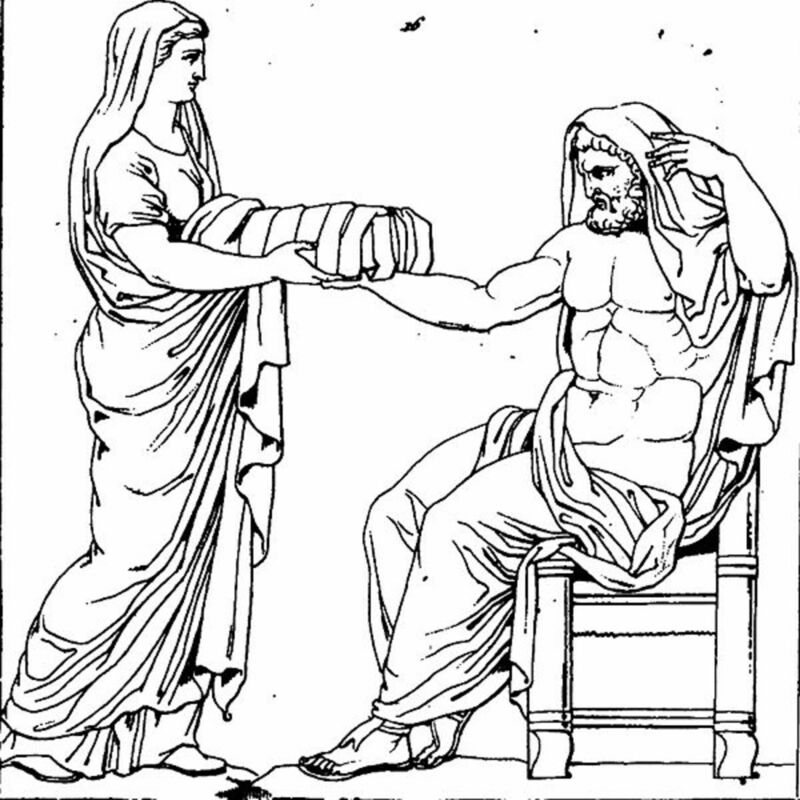 In Ancient Greece, Hephaestus was the son of Hera and the husband of Aphrodite. 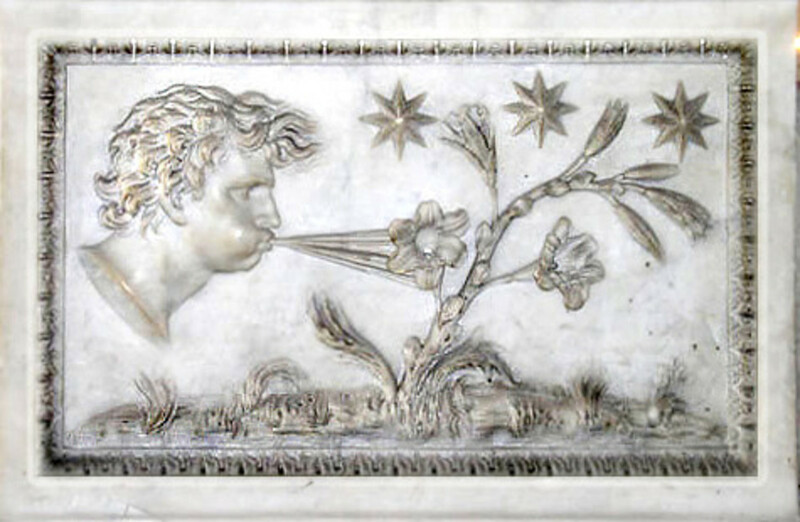 The Anemoi were the wind gods of Greek mythology. 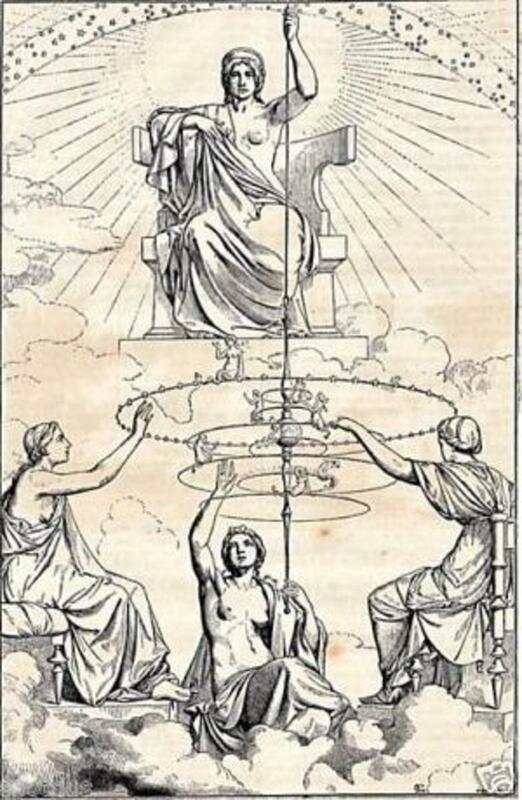 The main Anemoi were Boreas (north wind), Eurus (east wind), Notus (south wind), and Zephyrus (west wind)., but there were also gods of storm winds. 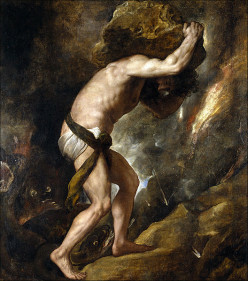 The Sisyphus myth is one of the most famous stories of Ancient Greece; or at least the ending is, for Sisyphus was the man forced to roll a boulder up hill for eternity. 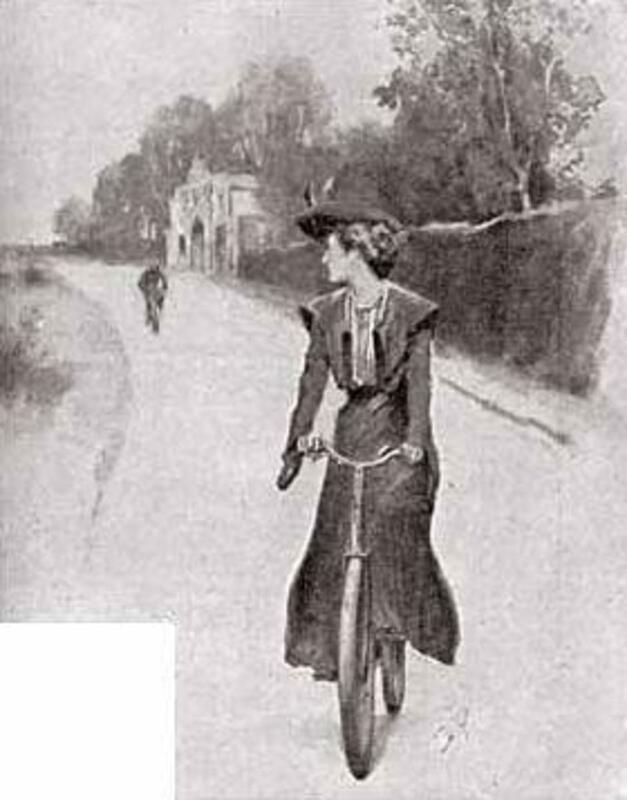 The Adventure of the Solitary Cyclist is a story that sees Sherlock Holmes investigate what appears to be a case of stalking by an unknown cyclist, but develops into a case of abduction. 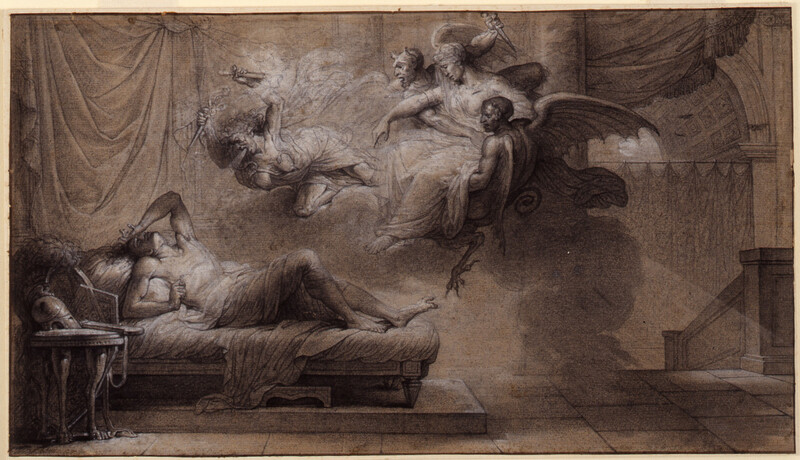 Hypnos was the god of sleep in Greek mythology. Hypnos today is more famous for giving English the word Hypnosis, although he was also a god who appeared in the stories of the Trojan War. 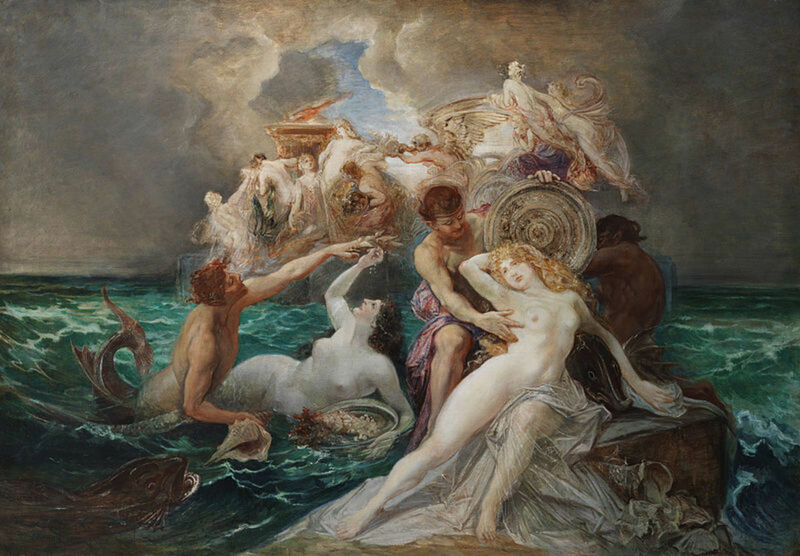 Amphitrite was a water nymph in Greek mythology, and although Oceanids and Nereids were revered, Amphitrite became important as the nymph became the wife of the sea god Poseidon. 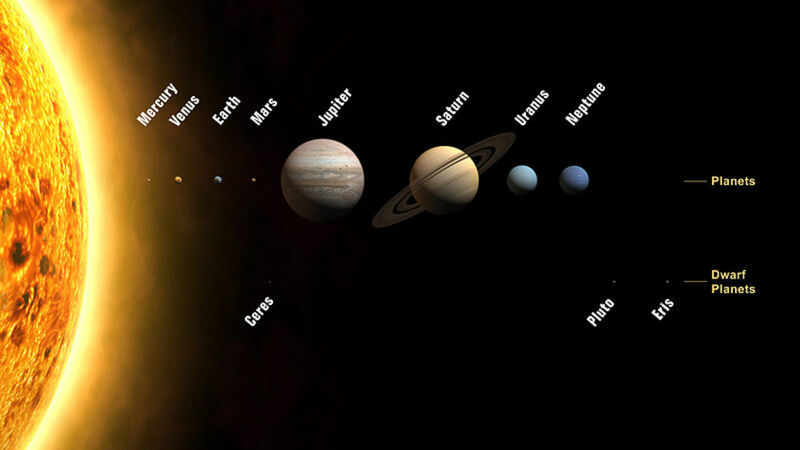 In the main, the most important objects found in our solar system are named after figures found in Greek and Roman mythology. This is true of 7 of the 8 planets, as they are named after Roman deities. 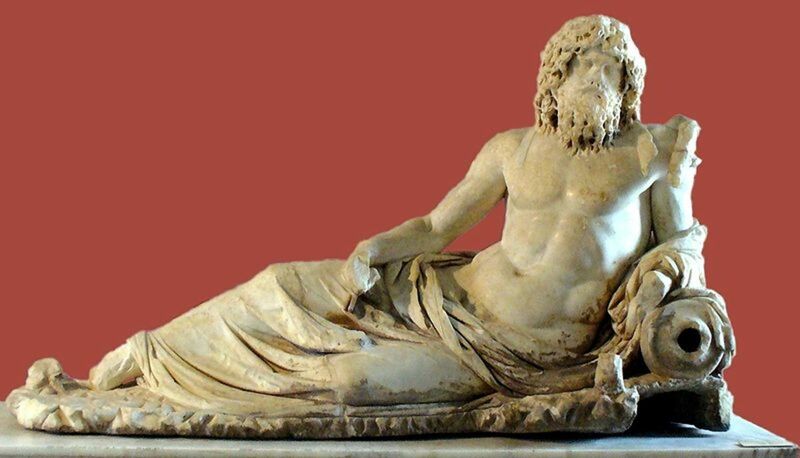 Heracles was the greatest of all heroes in Greek mythology. Later in life he would be known for completing the Labours of Heracles, but there is even a mythological story about the birth of the hero. 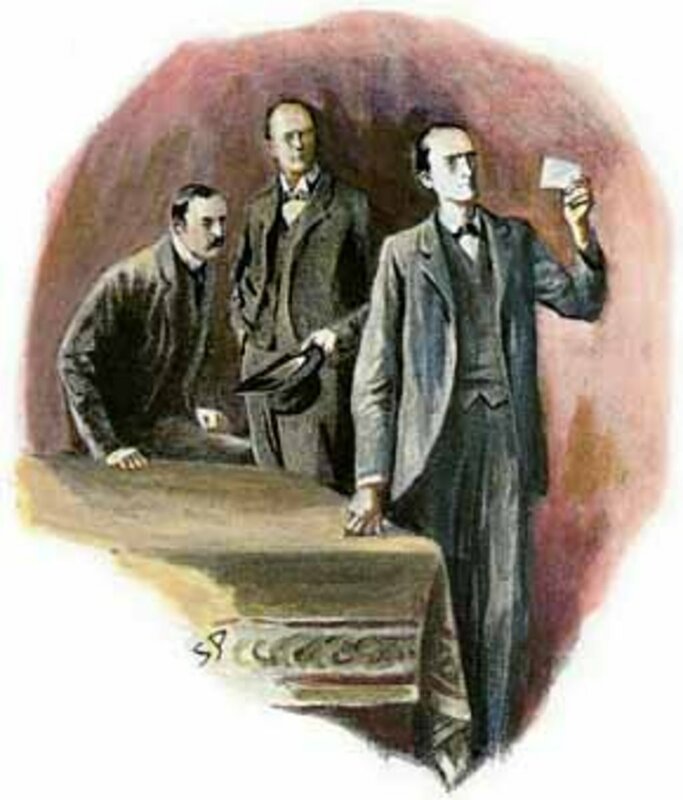 The Adventure of the Dancing Men is a famous short Sherlock Holmes story from Sir Arthur Conan Doyle that sees the consulting detective having to decipher a code that looks like a child's drawing. 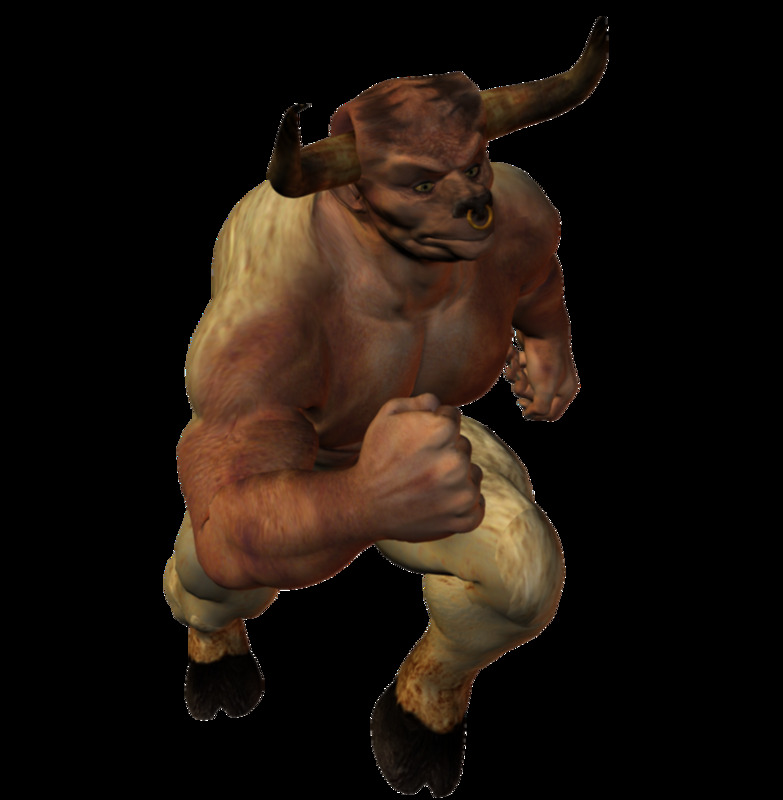 The Minotaur is one of the most recognisable monsters from Greek mythology. 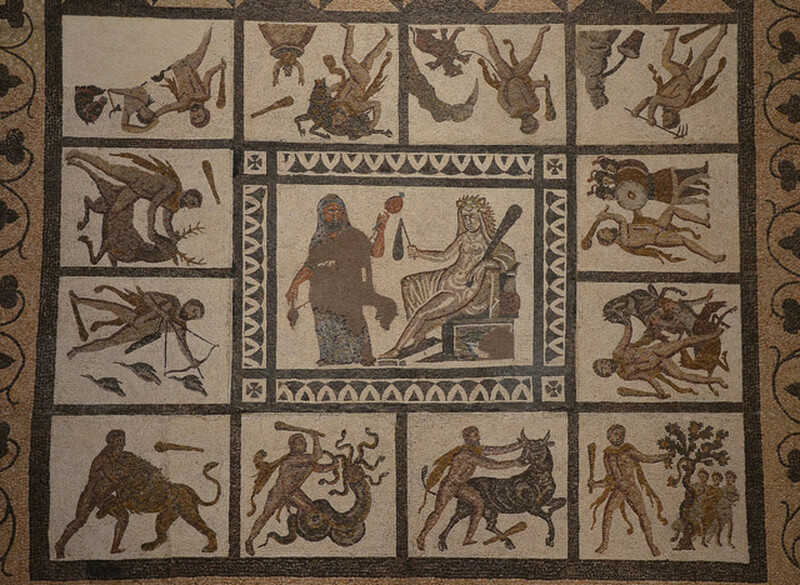 The half-man, half-bull creature is most famously found in the story of Theseus and the Minotaur. Heracles if arguably the most famous of all Greek heroes. As well as heroic deeds, Heracles was also well known for his many offspring, some of whom would be central to the Heracles myth. The Adventure of the Norwood Builder is a short Sherlock Holmes story that sees the detective attempt to exonerate his client when John Hector McFarlane is accused of the murder of Jonas Oldacre. Bellerophon is one of the less well known Greek heroes. 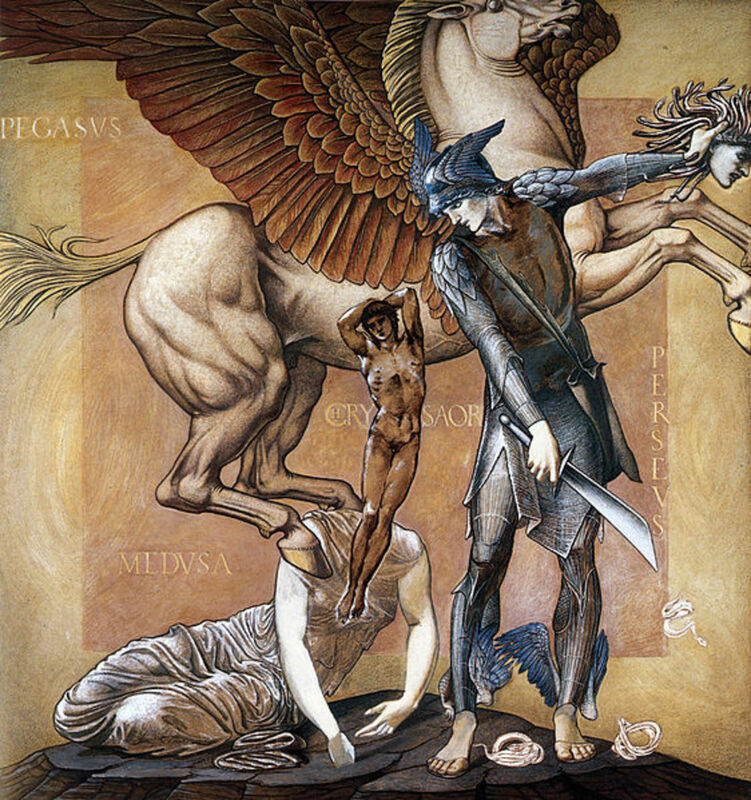 Bellerophon was a prince of Corinth, but his deed was to fight the monstrous Chimera from the back of Pegasus. 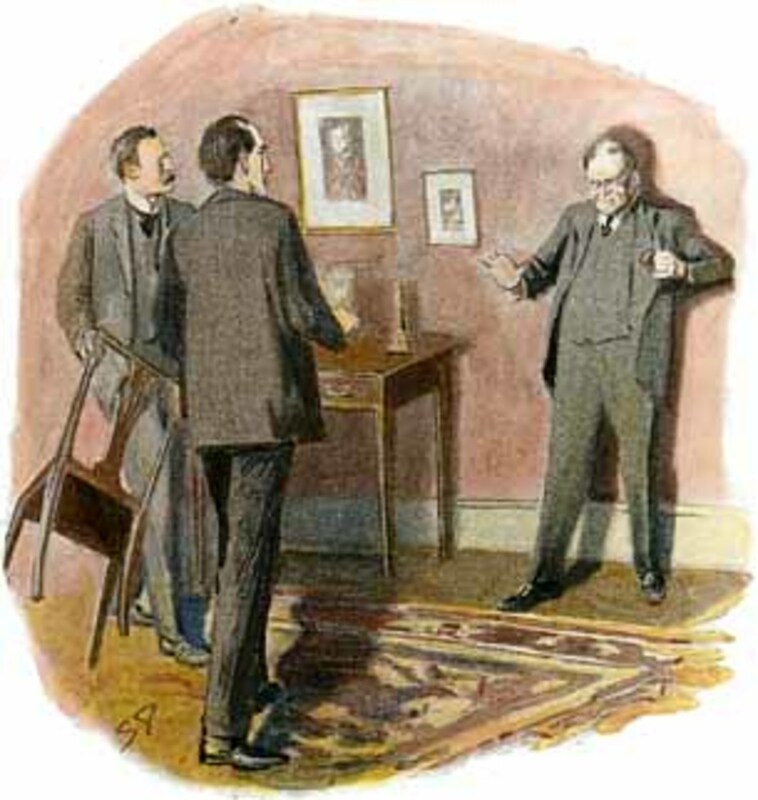 The Adventure of the Empty House was effectively the return of Sherlock Holmes. 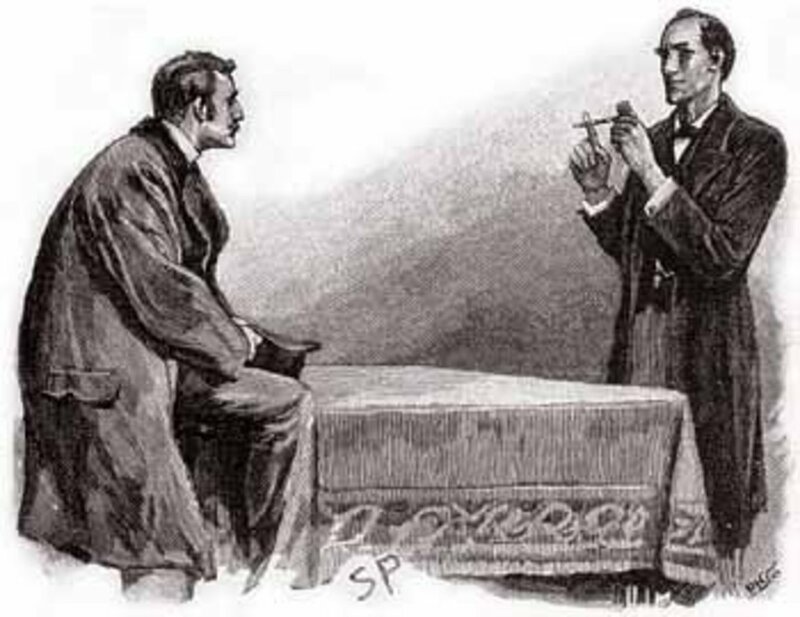 Ten years after the Final Problem, Sir Arthur Conan Doyle would resurrect Holmes, enabling the solving of more cases. 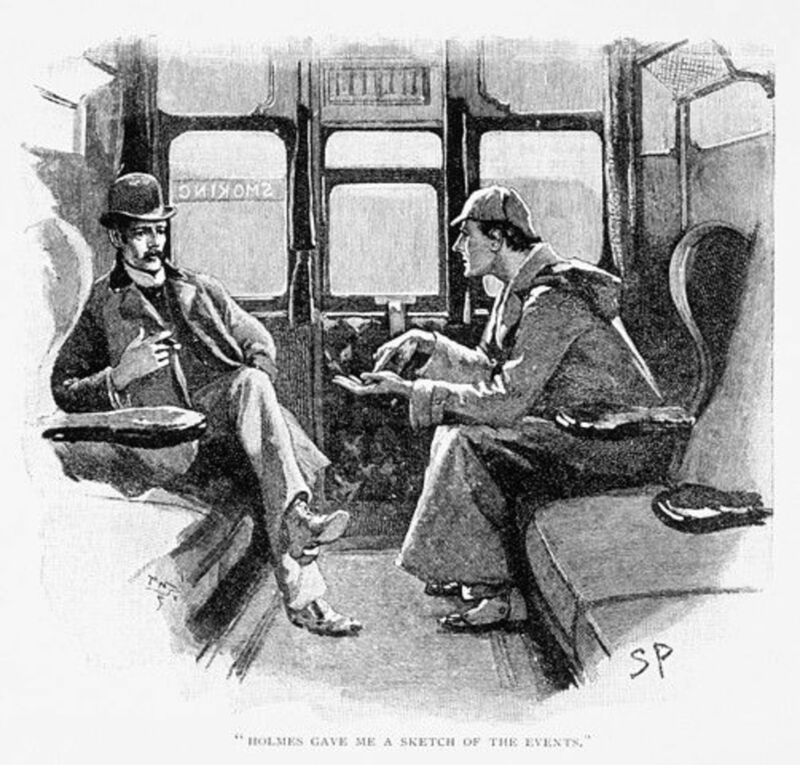 The Adventure of the Final Problem was penned by Sir Arthur Conan Doyle to the the final problem faced by Sherlock Holmes. Taking down the gang of Professor Moriarty could have some deadly results. Amalthea was one of the foster others of Zeus in Greek mythology. 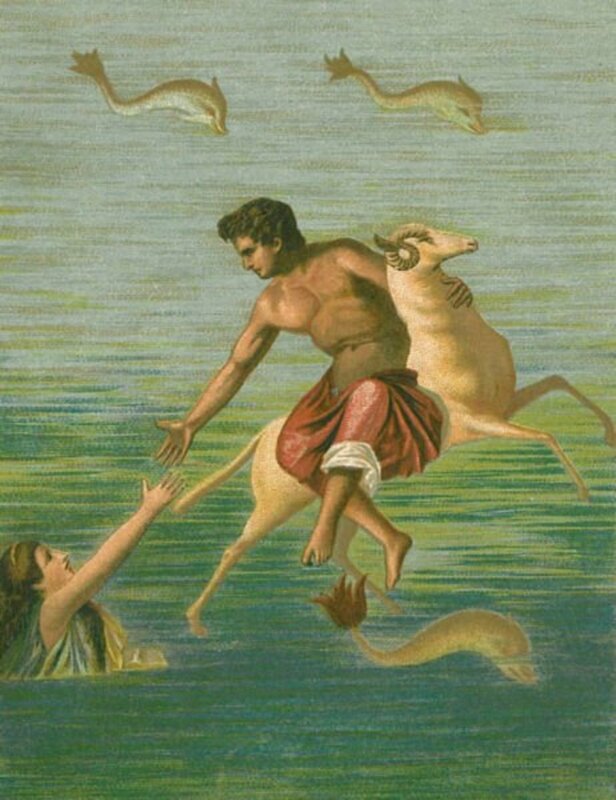 Rhea would pass over the baby Zeus to a group of nymphs; it is not quite clear whether Amalthea was one of these nymphs or a she-goat. 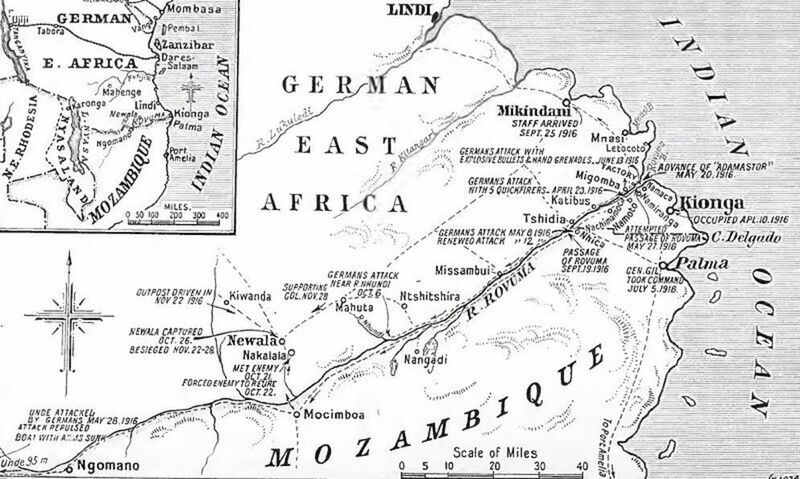 The Adventure of the Naval Treaty is a short Sherlock Holmes story from Sir Arthur Conan Doyle. 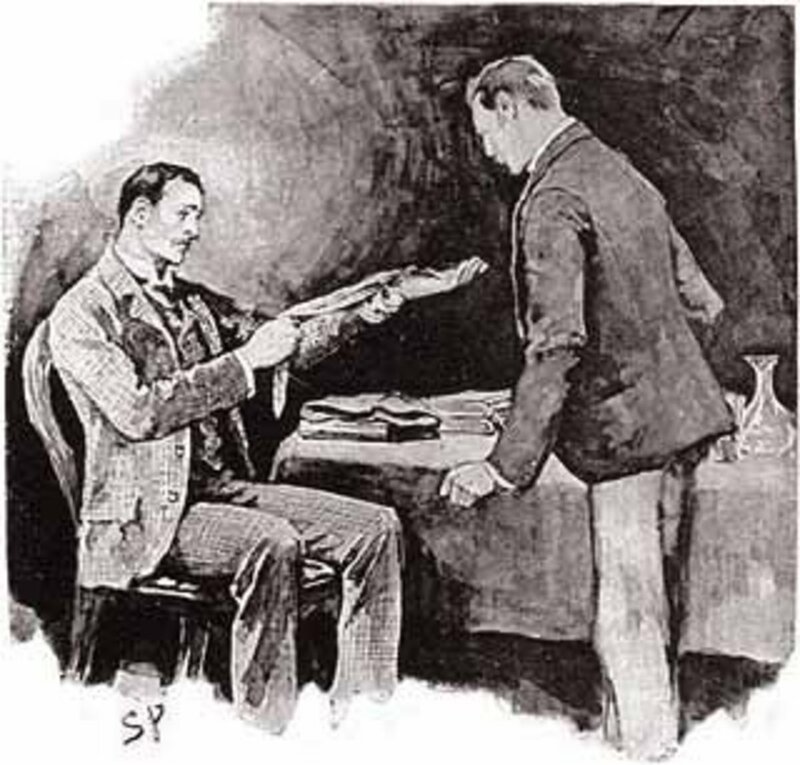 Watson brings a case to Holmes for a friend's reputation is being tarnished by the theft of a treaty. 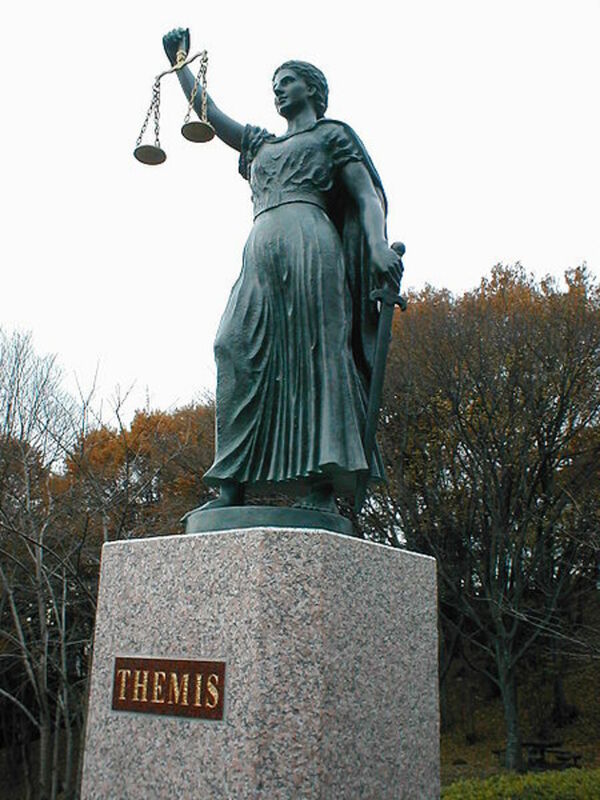 Themis was the Greek Goddess of Justice. 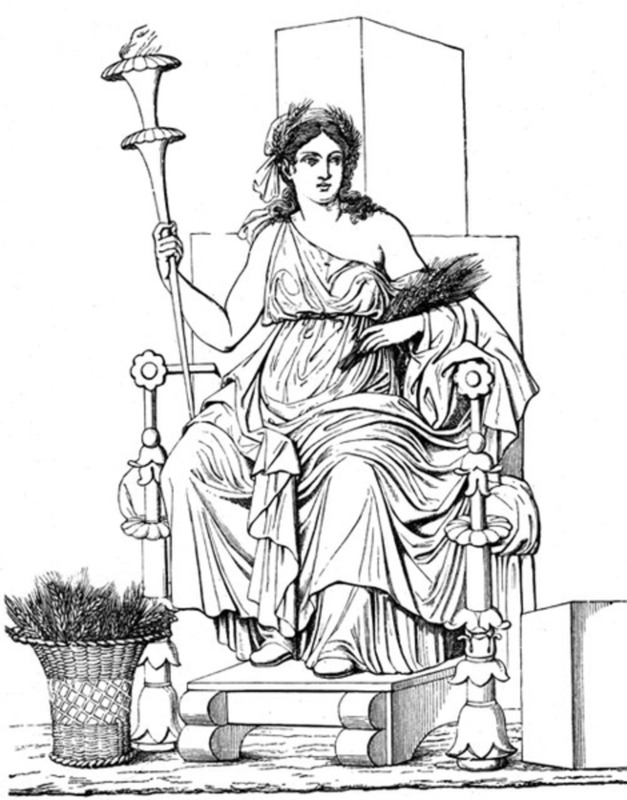 In Greek mythology Themis was the deity responsible for divine justice, and law and order. In this role Themis would work closely with the supreme god Zeus. Eos in Greek mythology was the dawn goddess, tasked with bring the first light to the day. This dawn goddess was a daughter of Hyperion, and also brother to the Greek sun god Helios. 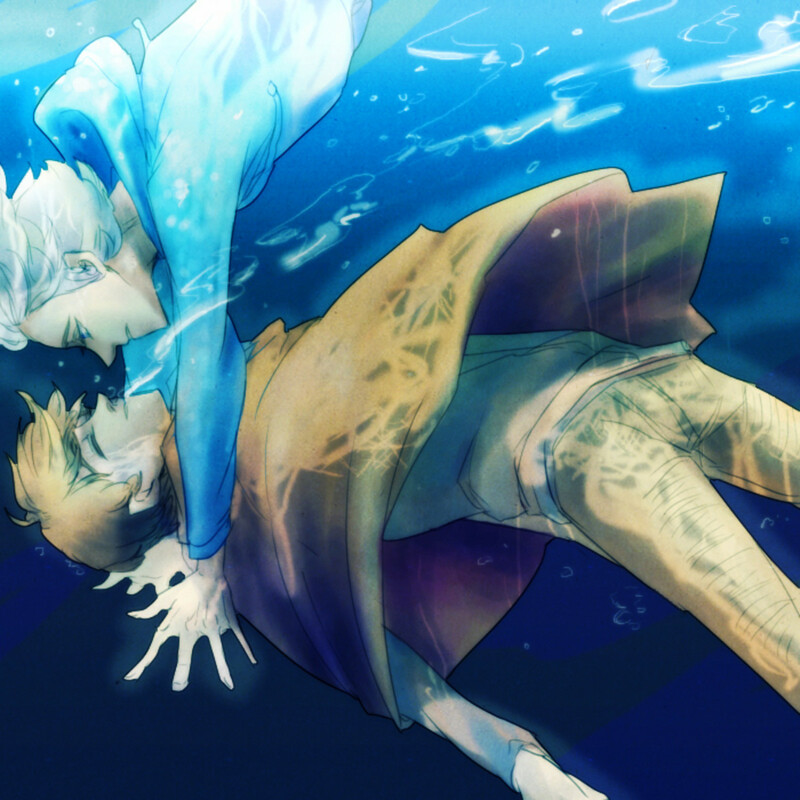 In Greek mythology Narcissus was a beautiful mortal who spurned all that turned their attention towards him. 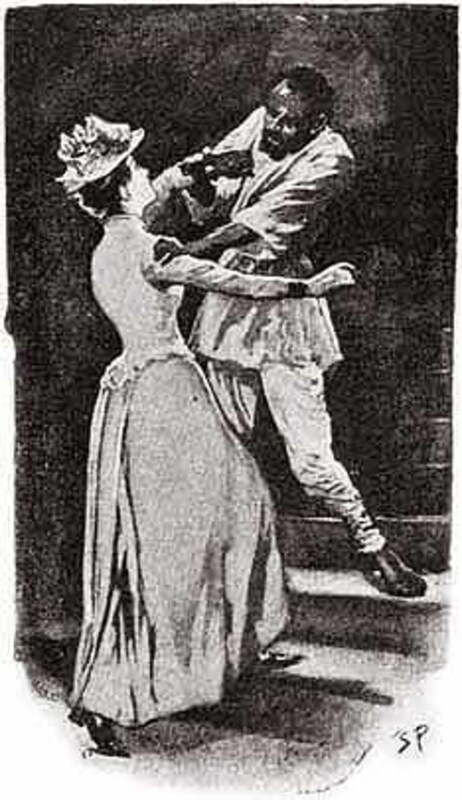 One such spurned lover was the nymph Echo who wasted away until her voice remained. 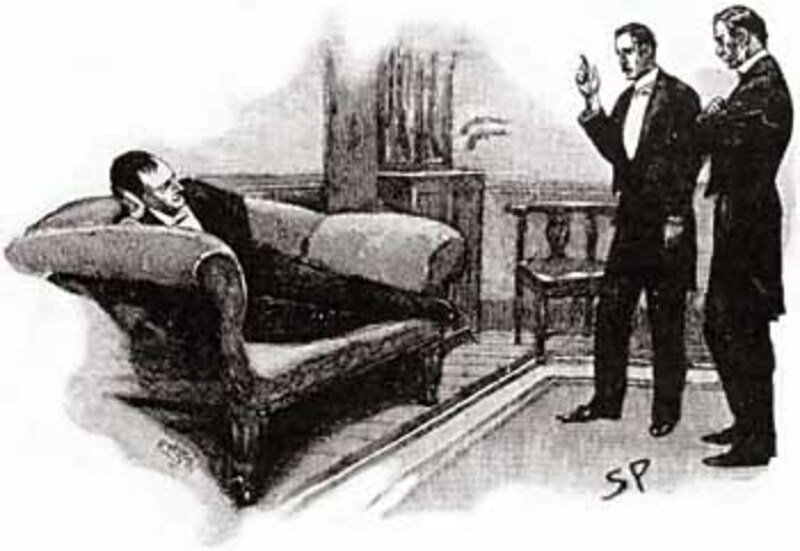 The Adventure of the Greek Interpreter is a short Sherlock Holmes story written by Sir Arthur Conan Doyle. 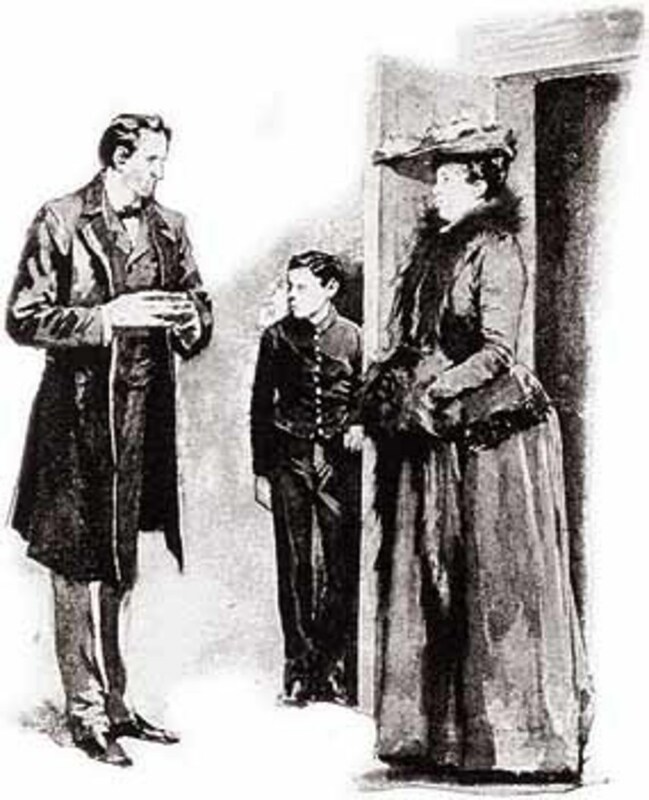 In this adventure the Sherlock Holmes reader is introduced to Mycroft, Sherlock's brother. 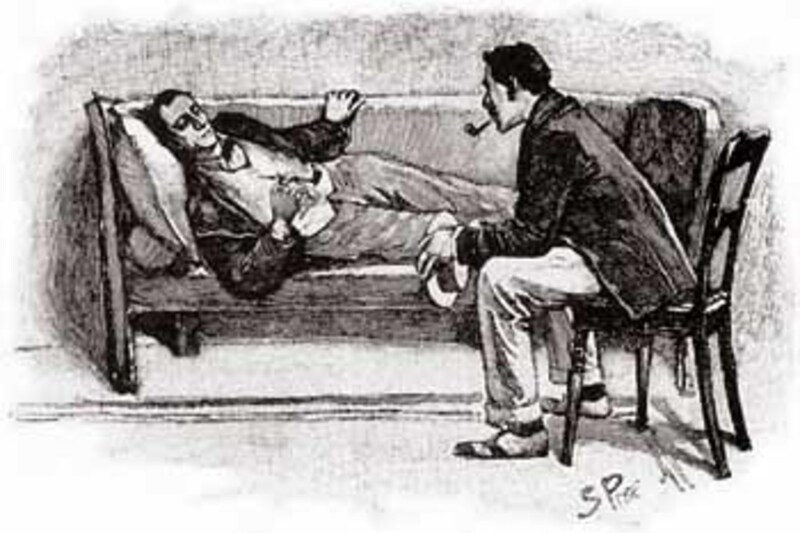 The Adventure of the Resident Patient is a Sherlock Holmes story that sees the detective deal with an extremely nervous patient; a patient who it turns out doesn't want Holmes' help. 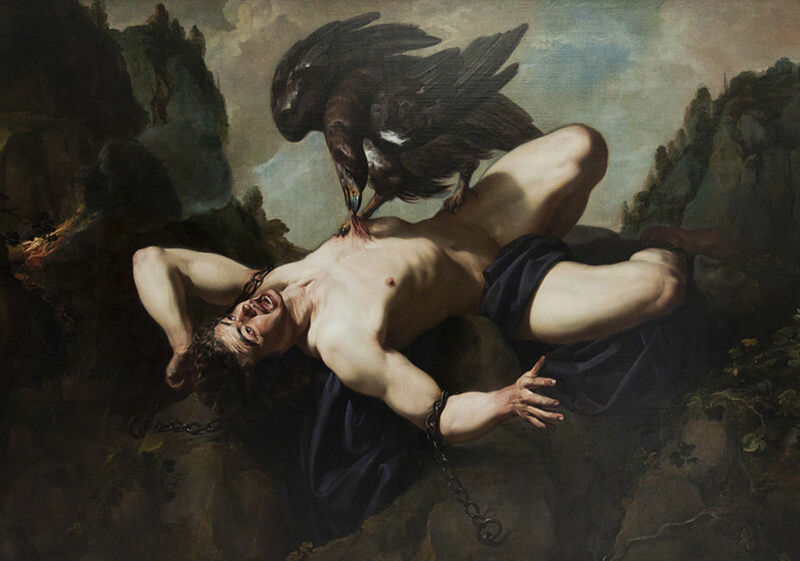 Prometheus was a Titan in Greek mythology. 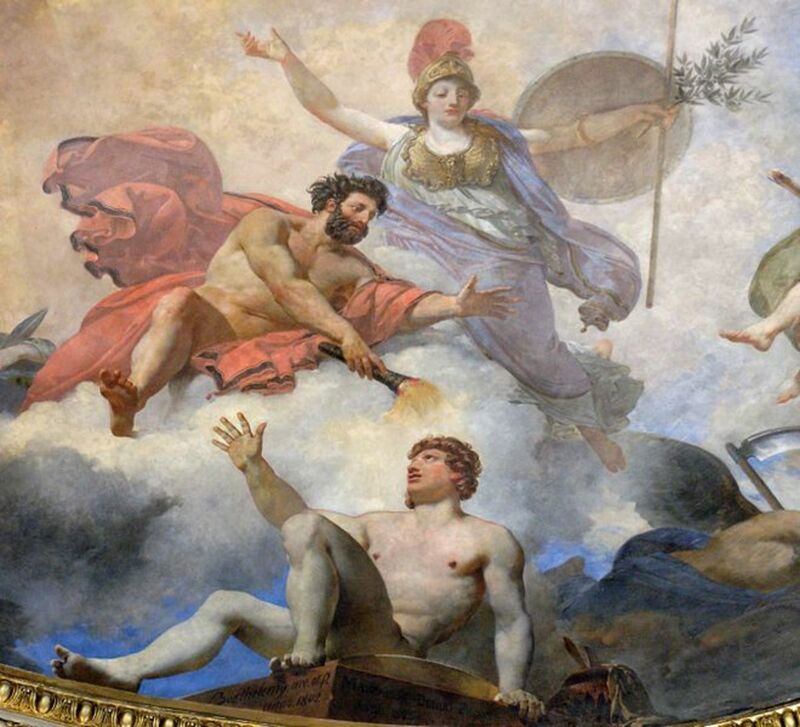 An antagonist of Zeus, Prometheus would be regarded as the benefactor of man, bringing forth life and fire for mankind, but would be punished for the latter. 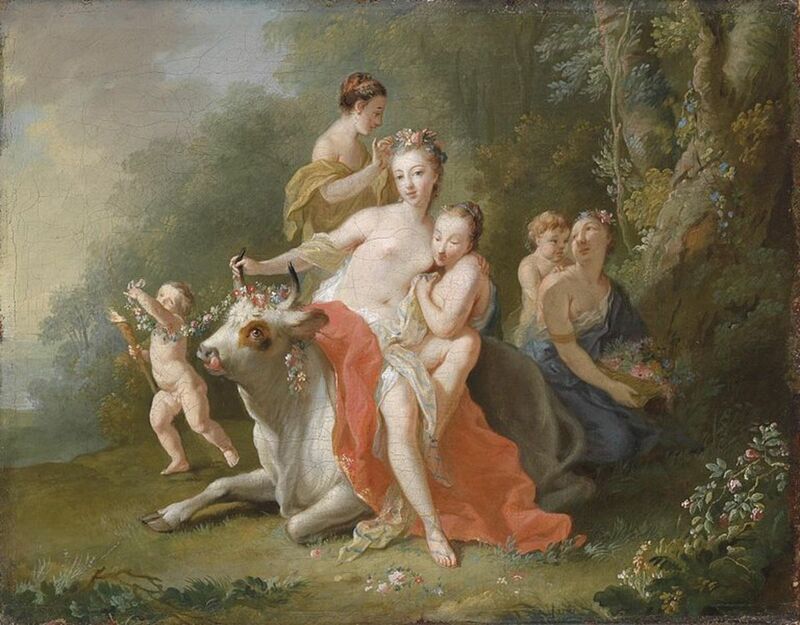 Pasiphae in Greek mythology was the wife of King Minos as well as being a daughter of Helios. 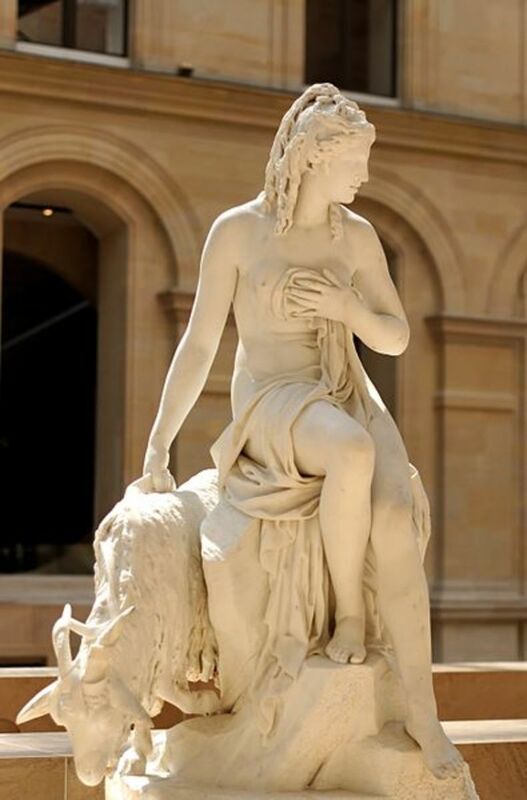 A sorceress in her own right, Pasiphae was also cursed, and the story of Pasiphae and the bull is famous. The Adventure of the Crooked Man is a short Sherlock Holmes story written by Sir Arthur Conan Doyle. 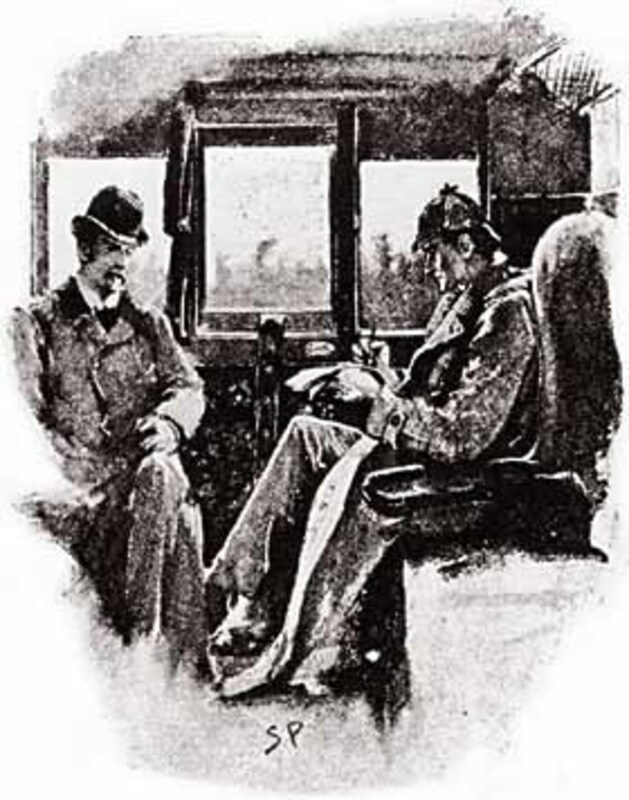 In the Adventure of the Crooked Man, Holmes departs from Baker St to Aldershot taking Watson along. Bram Stoker's Dracula is by far and away the most famous vampire novel ever written. 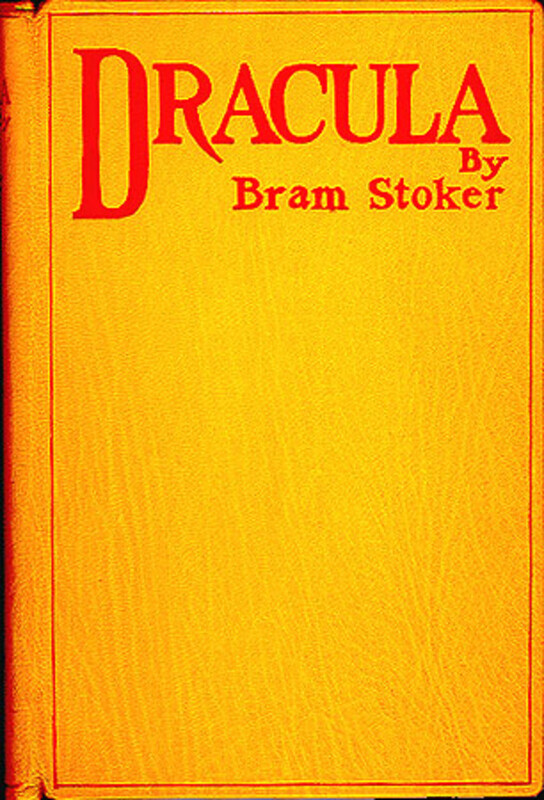 It wasn't the first of the genre, but Bram Stoker's Dracula is the story against which all others are judged. 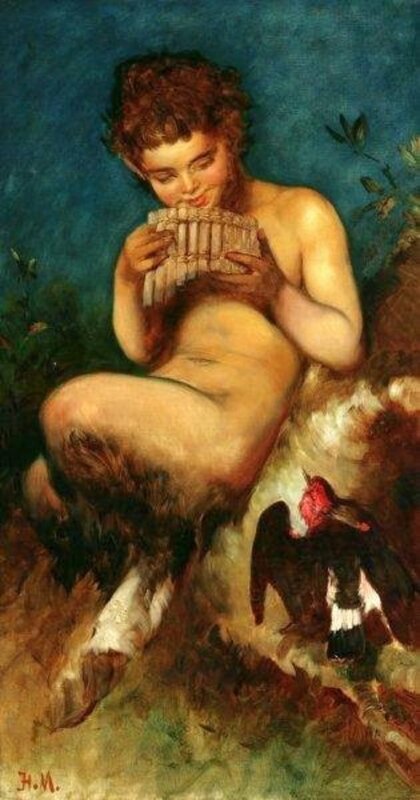 Satyrs were some of the mythical beings from the world of Greek mythology. 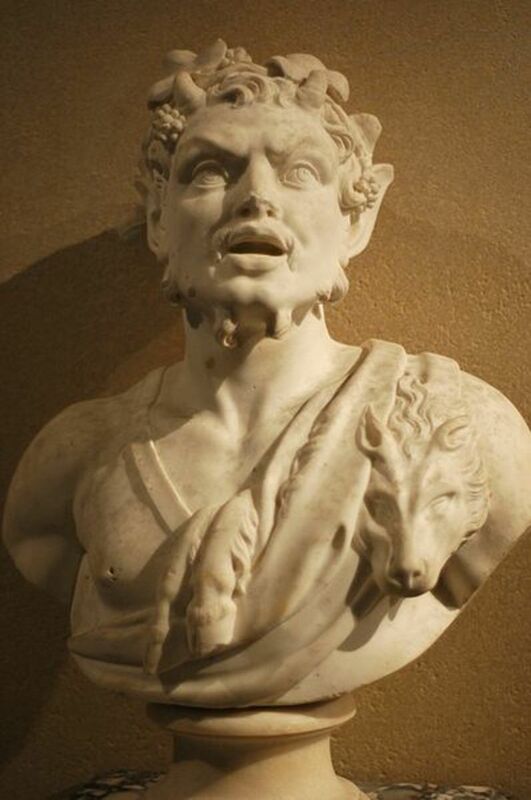 Now generally confused with Fauns, Satyrs were originally guardians of woodlands and companions of Dionysus. 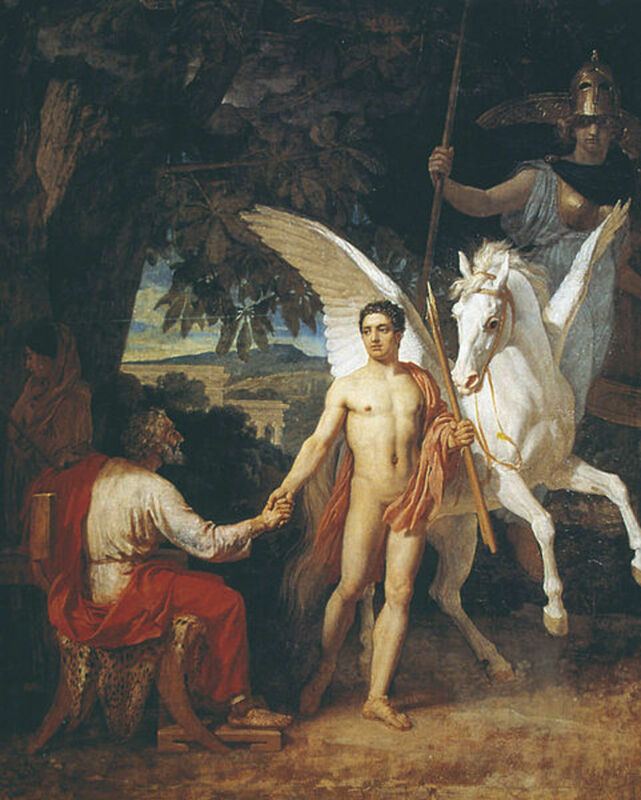 The Perseus myth is one of the most famous stories of Ancient Greek. Perseus in Greek mythology would do battle with the Gorgon Medusa, and also end up rescuing the princess Andromeda. Hades was the god of the underworld in Greek mythology and the brother of Zeus. The Greek god Hades would become synonymous with his domain, his realm would be known as Hades in Greek mythology. The Adventure of the Reigate Squire is a short Sherlock Holmes story that sees the detective recuperating in Surrey. Soon though Holmes is investigating a burglary and a murder. Saturn was one of the Roman gods and goddesses worshipped two millennia ago. 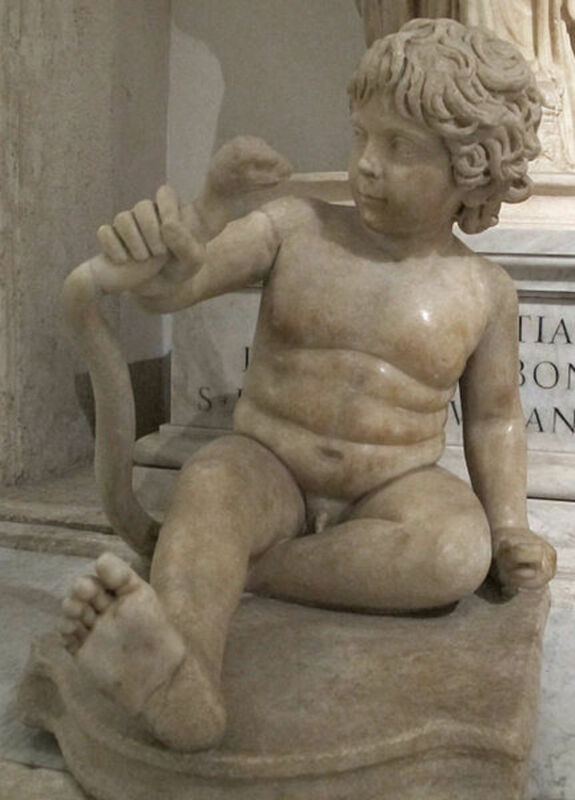 The Roman god Saturn was an agricultural god, and one most commonly linked with the god Cronus of the Greek pantheon. 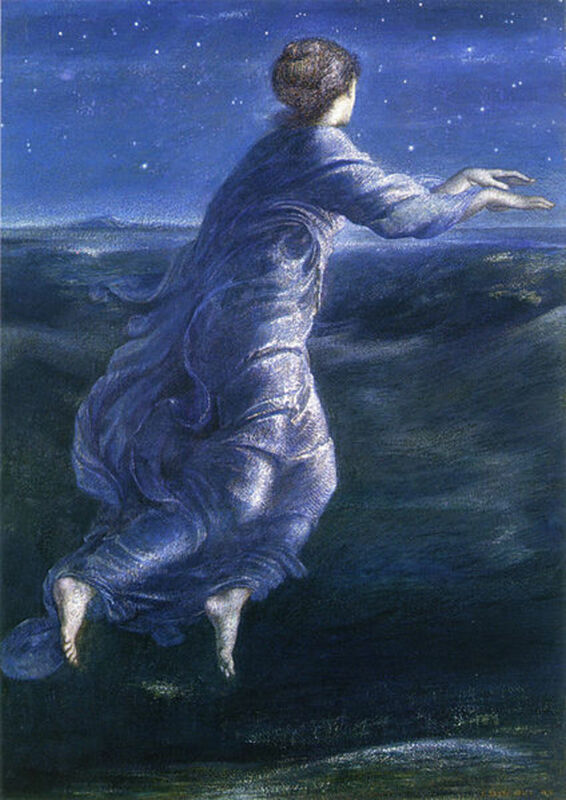 Nyx was the Greek goddess of the night. 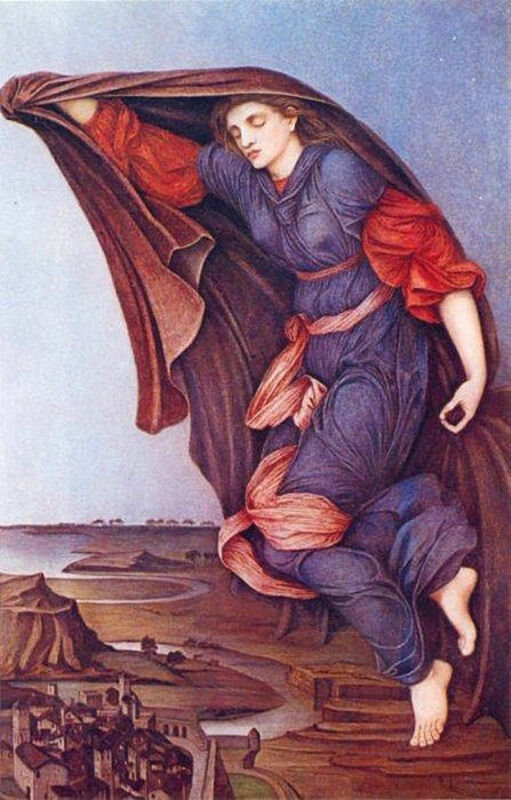 Nyx in Greek mythology was one of the Protogenoi, born in a time before the gods of Mount Olympus, and Nyx, as the goddess of the night would work with Erebus. Athens in Greece is of course named for the goddess Athena, but in Greek mythology there is a story of a contest between Poseidon and Athena to decide which of them would become patron of the city. 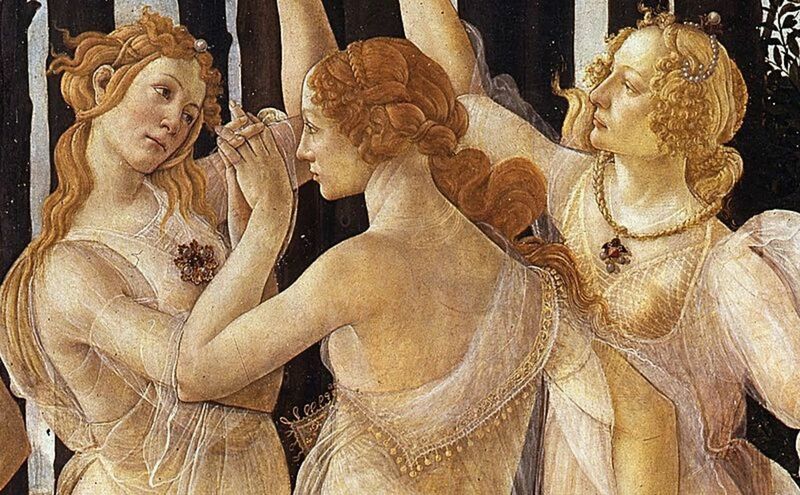 The names of many Gods and Goddesses of Greek mythology have survived into the modern day, but of course some of the Greek goddesses are more famous than others. Theseus in Greek Mythology is today most famous for the story of Theseus and the Minotaur, the Greek hero though had a life full of adventure, and a life full of ups and downs. 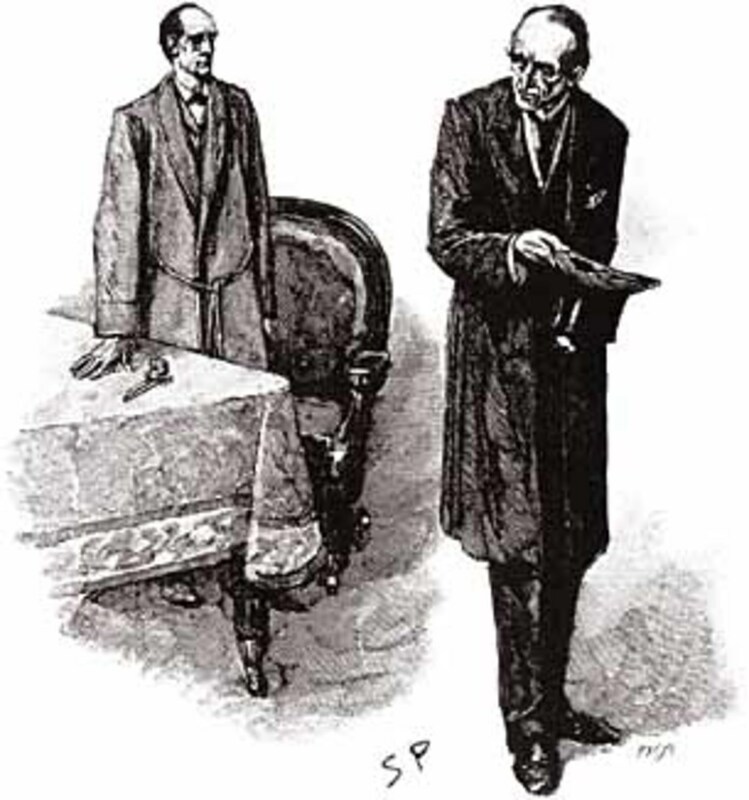 The Adventure of the Musgrave Ritual is one of the most famous Sherlock Holmes stories. The short Sherlock Holmes story deals with missing servants but develops into a treasure hunt. 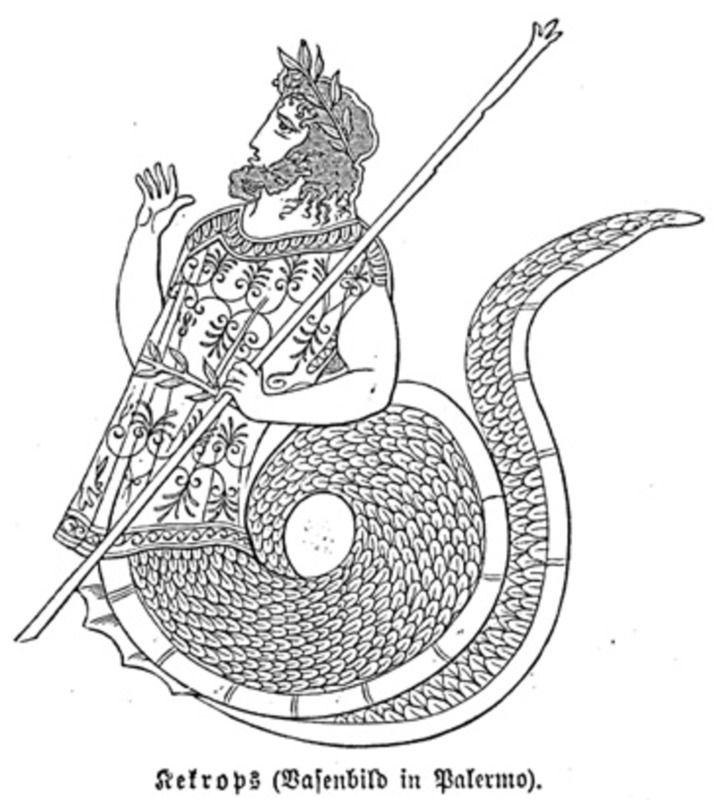 The Potamoi were the 3000 river gods of Greek mythology. Each river of Ancient Greece would have its own individual Potamoi, with the power of the river gods reflective of the size of the river. 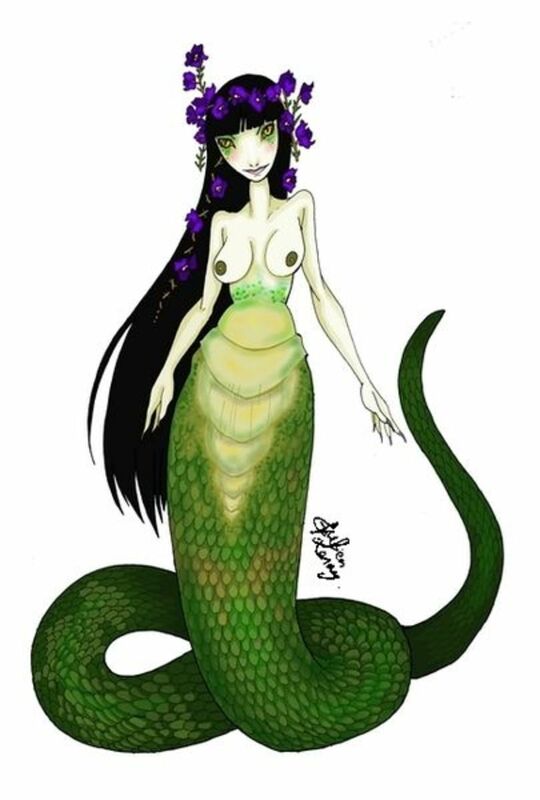 A Nereid was one of the water nymphs of Greek mythology. 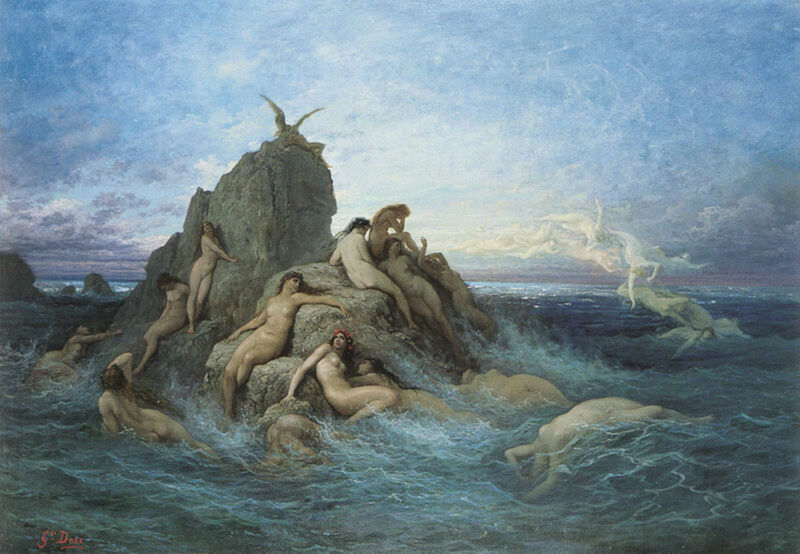 Nereids were the daughters of Nereus and were to be found in the retinue of Poseidon. A few individual Nereids were also famous by themselves. 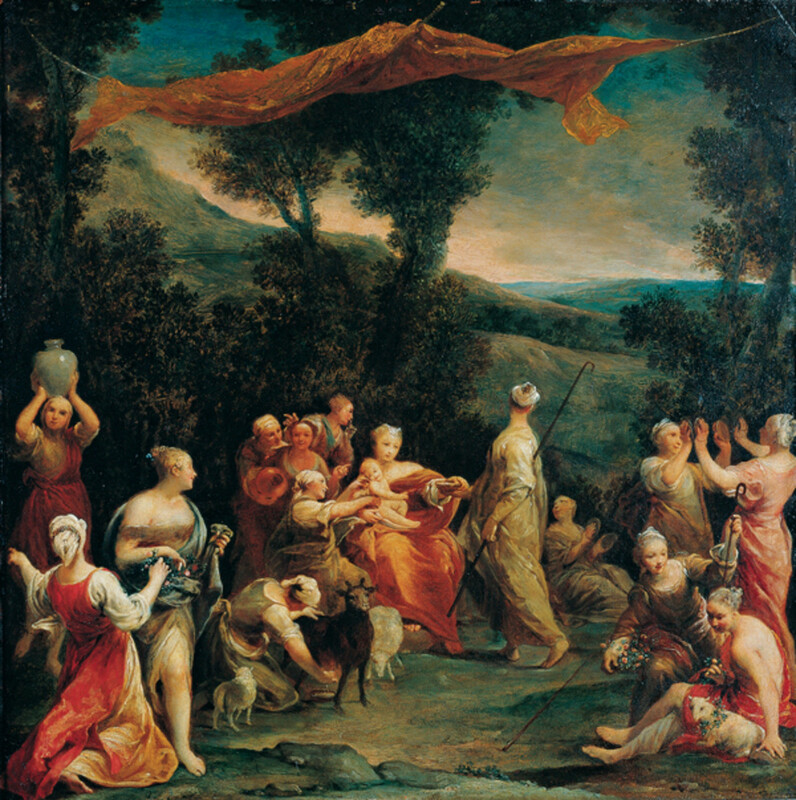 The Hesperides were a group of nymphs from Greek mythology, who resided in the Garden of the Hesperides. 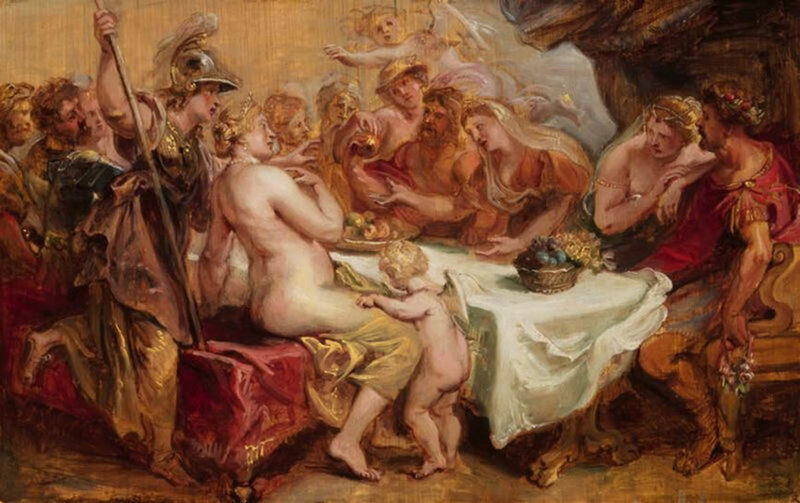 In the garden of the Hesperides the nymphs would guard and tend the famous Golden Apples. The Greek god Thanatos was the personification of Death. An elderly, winged man, his arrival meant only one thing, and soon the spirit of the deceased was being transported to the underworld. 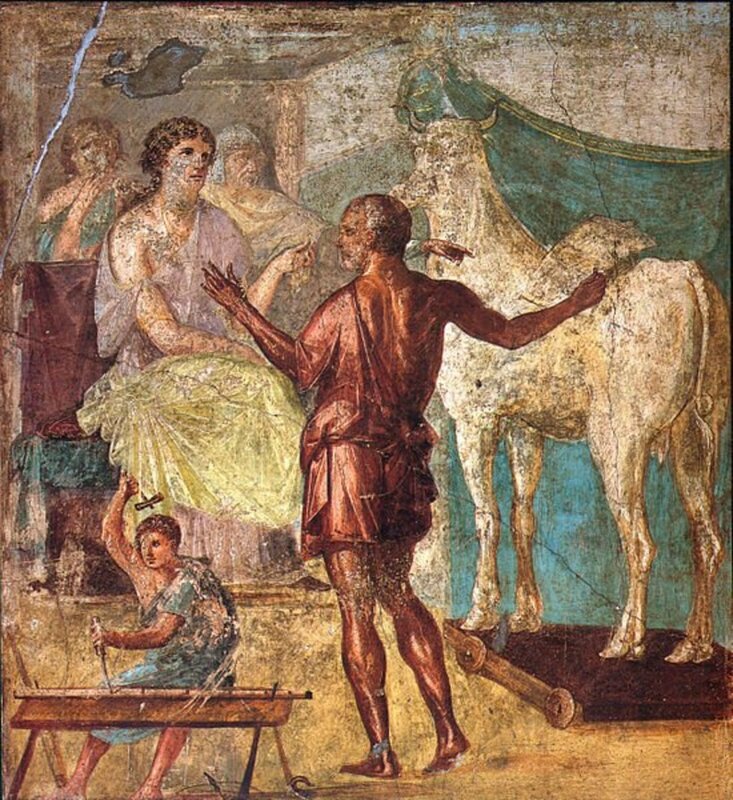 In Ancient Greece Peleus was one of the greatest of heroes. The fame of Peleus though has been overshadowed by that of his son, Achilles, and now he is best remembered for his marriage to Thetis. 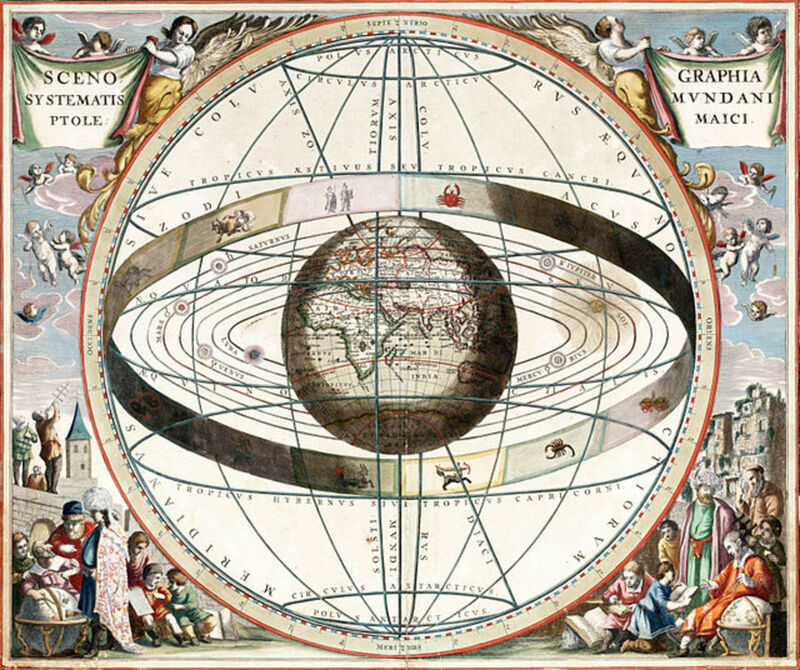 Few people will perhaps realise that western astrology signs can be linked to Greek mythology, as each sign of the zodiac has a story from Ancient Greece associated with it. 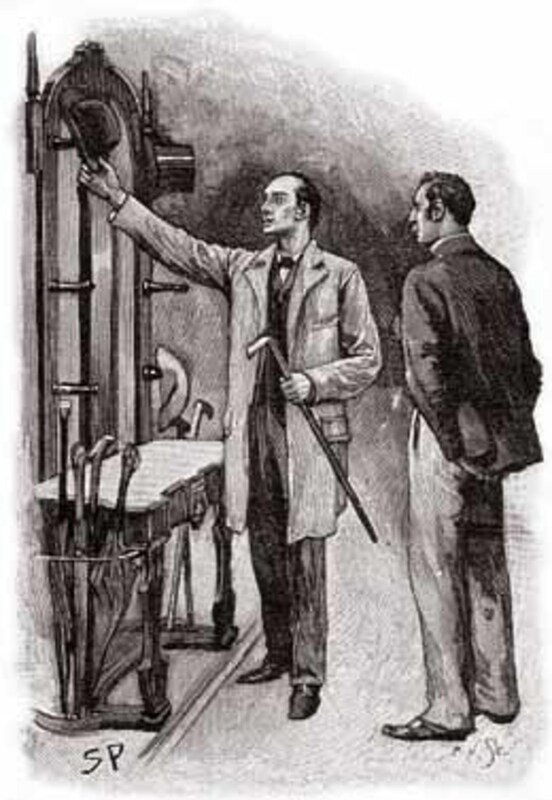 The Adventure of the Stockbroker's Clerk is a short Sherlock Holmes story from Sir Arthur Conan Doyle. 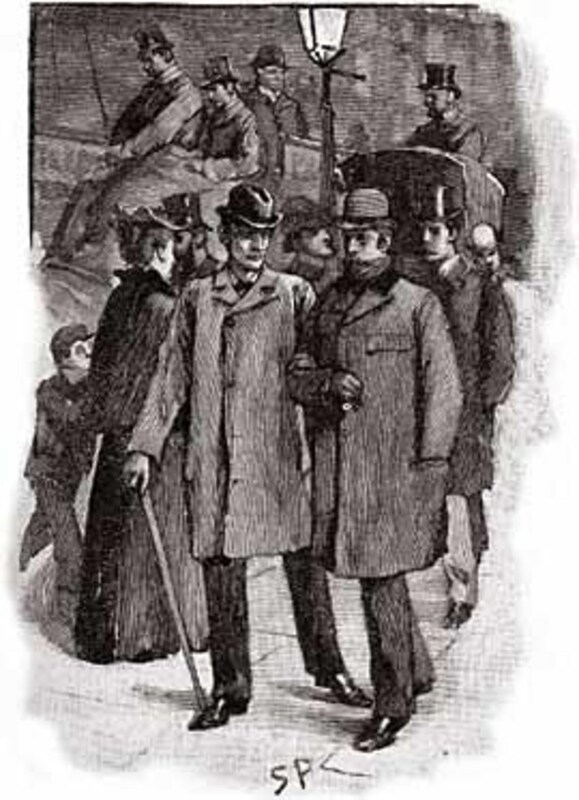 The case sees Holmes out of his normal London surroundings and in Birmingham instead. 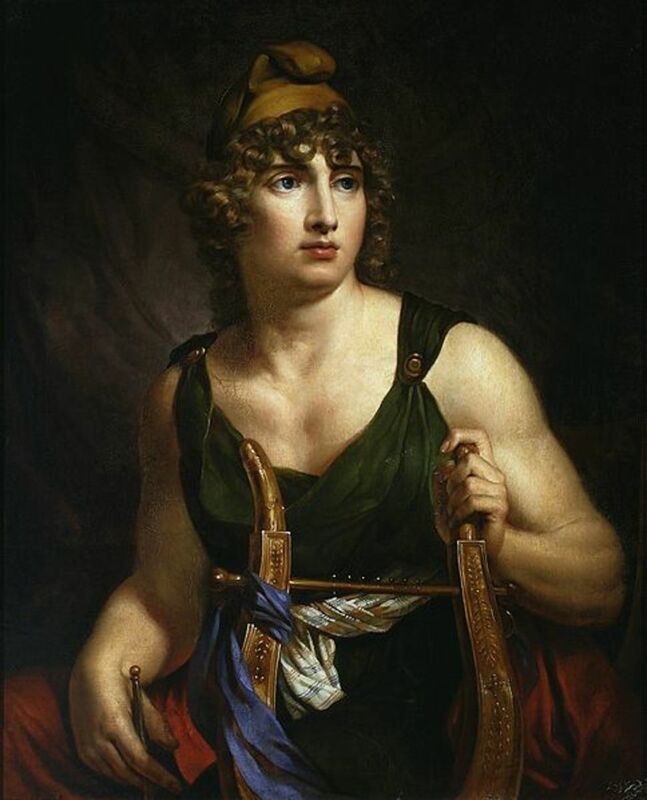 Leto was a goddess from the Ancient Greek pantheon. 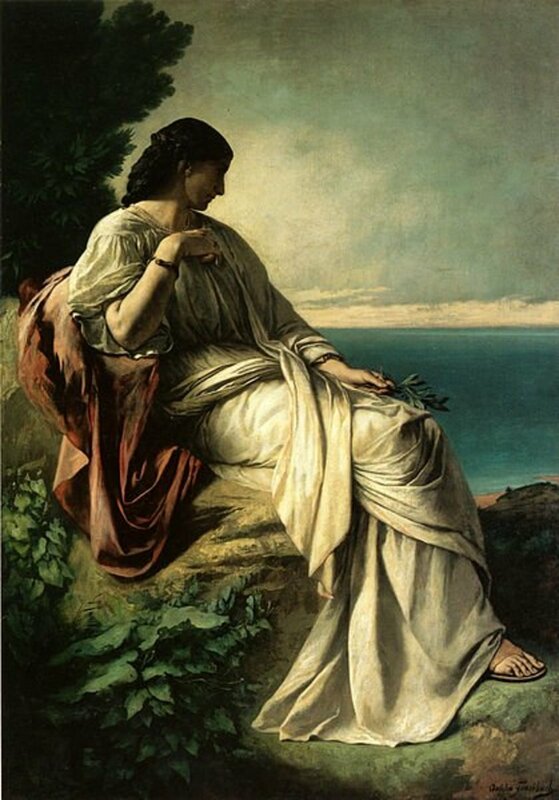 A daughter of the Ttians Coeus and Phoebe, Leto would become even more famous as the mother of Apollo and Artemis, gods of Mount Olympus. 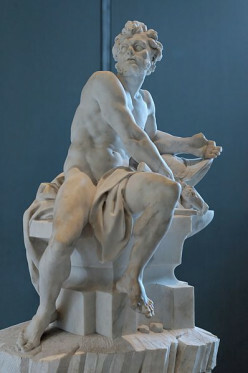 Metis was one of the deities of the Ancient Greek pantheon. A second generation Titan, Metis would become famous as the first wife of Zeus; a prophecy though would prove to be her downfall. 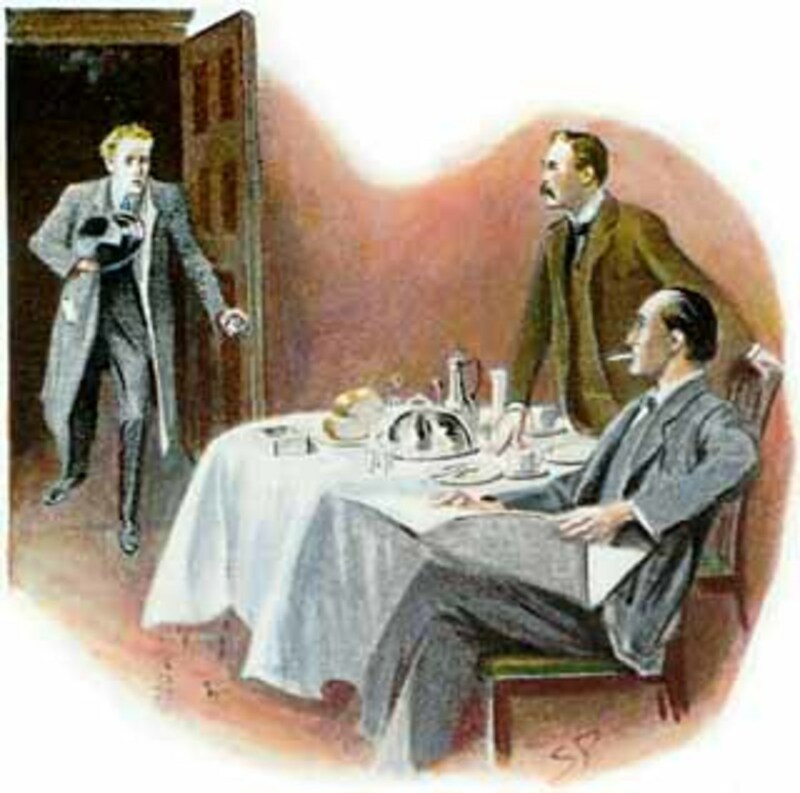 The Adventure of the Yellow Face is a case for Sherlock Holmes in short story form. 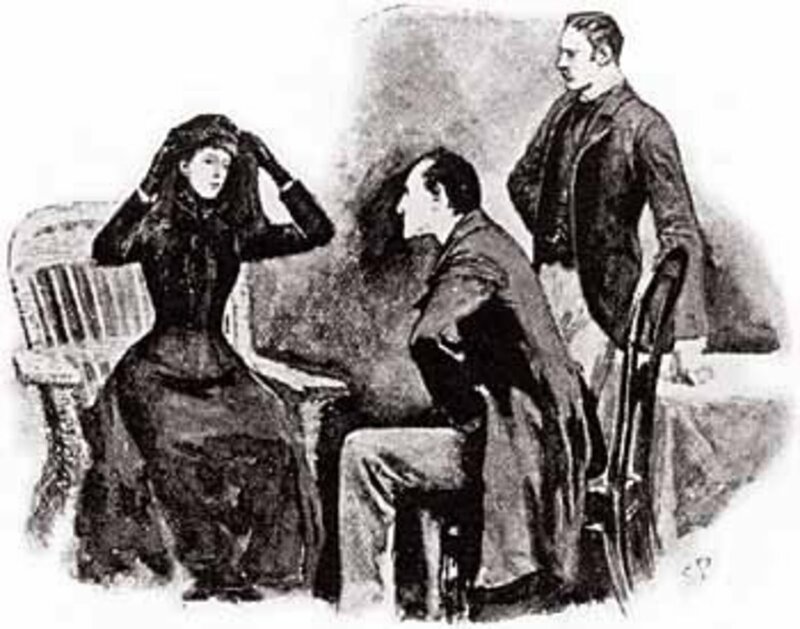 The story is memorable as it displays the fallibility of Sir Arthur Conan Doyle's creation. The Oracle at Delphi was one of the most important people in Ancient Greece. 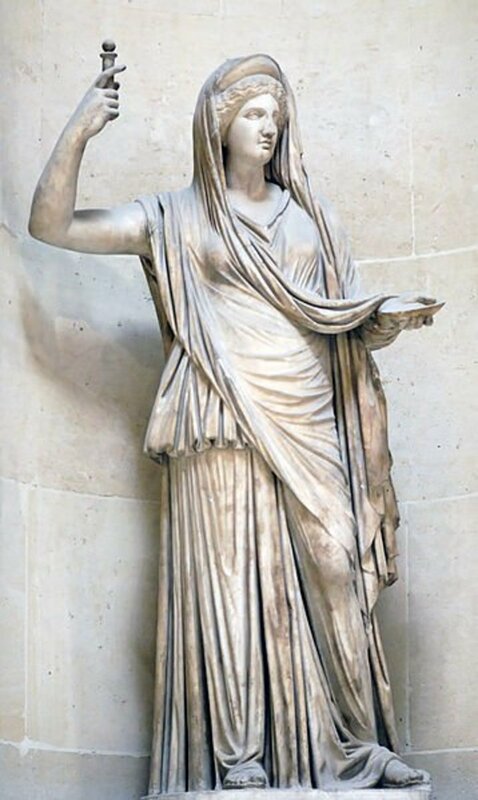 The priestess known as the Pythia, would answer questions of those who visited the Oracle of Delphi for guidance. The Adventure of the Cardboard Box is a short story penned by Sir Arthur Conan Doyle featuring Sherlock Holmes. A tale of murder, the story in its day was one of the most controversial. 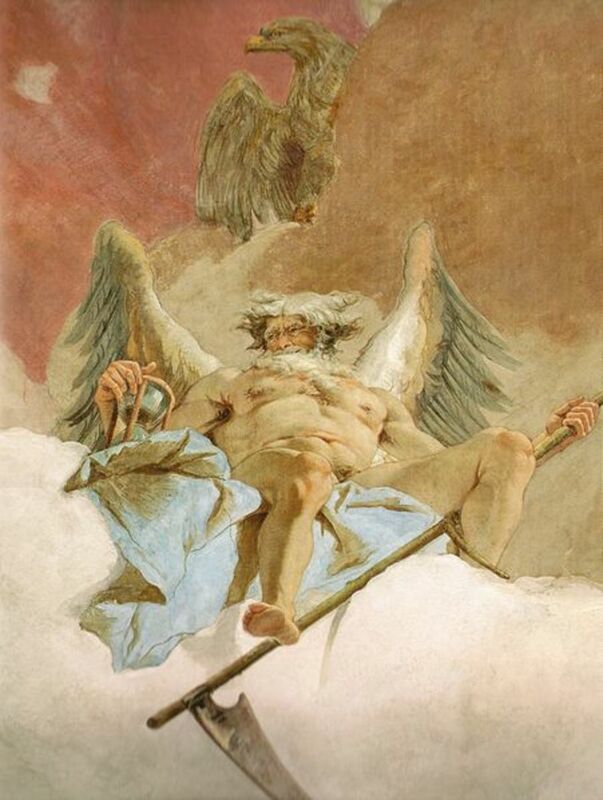 At one time the Greek god Cronus was the supreme deity of the Greek pantheon, he was though, usurped by his own son Zeus, and relegated to the periphery of religion in Ancient Greece. 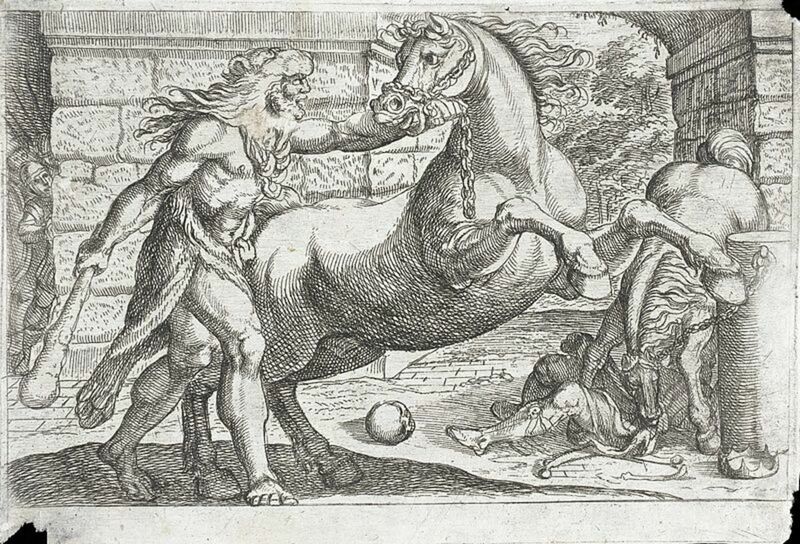 Chiron is a famous figure from Greek mythology, for Chiron was a centaur. 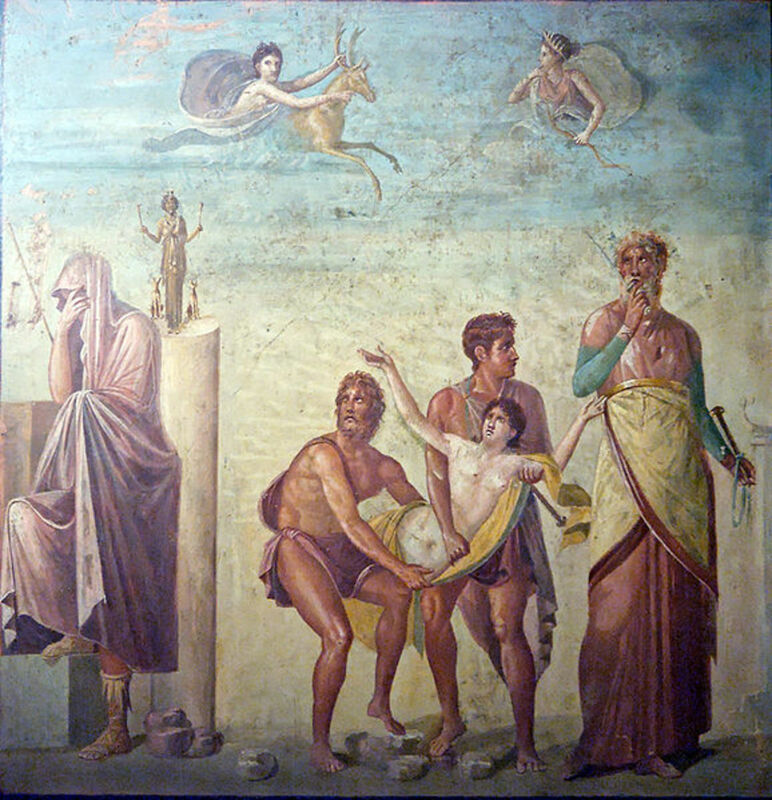 Chiron was famous for being trainer and tutor to many notable figures, including Jason and Achilles. 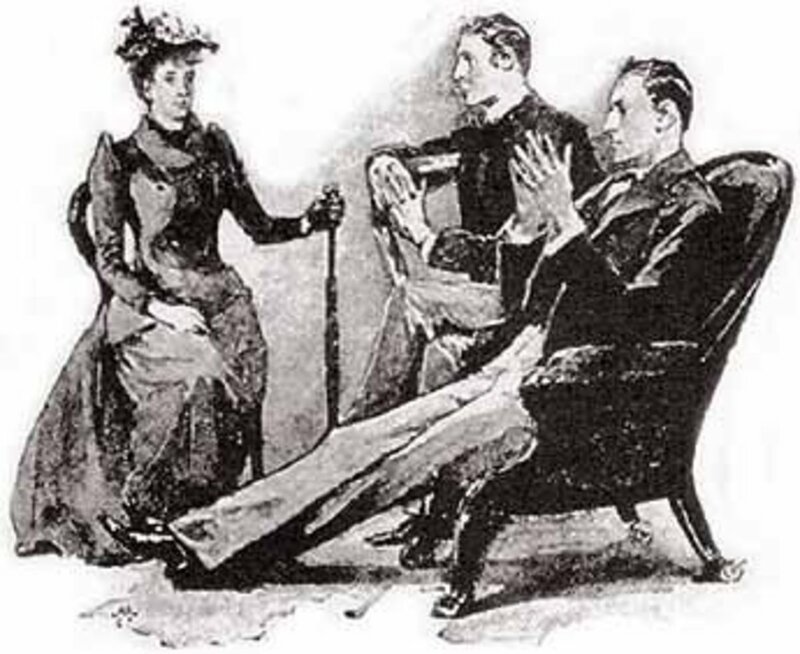 Sherlock Holmes stories have entertained the general public for over 100 years. Silver Blaze is a short Sherlock Holmes stories that deals with murder and a missing racehorse. 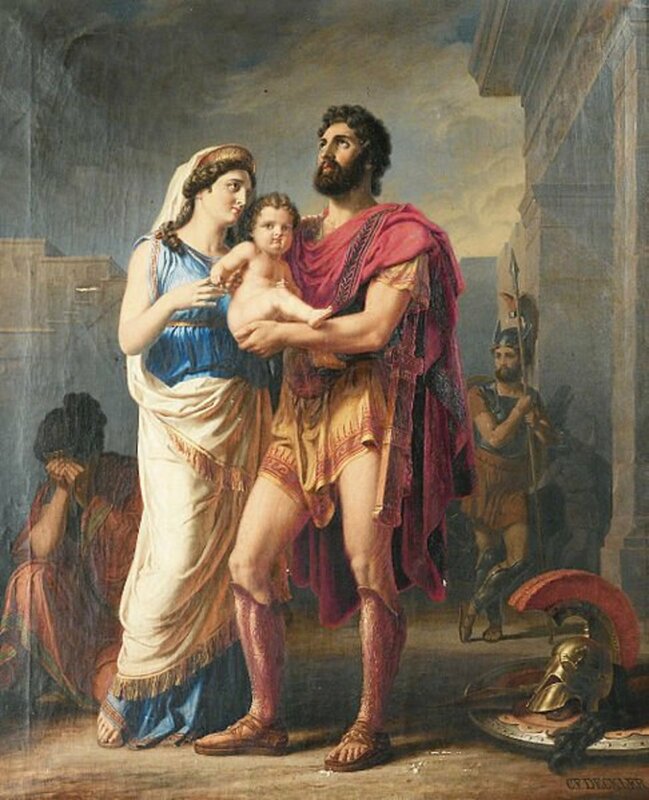 Andromache was the wife of Hector, son of Priam, and was on the way to becoming the future Queen of Troy. 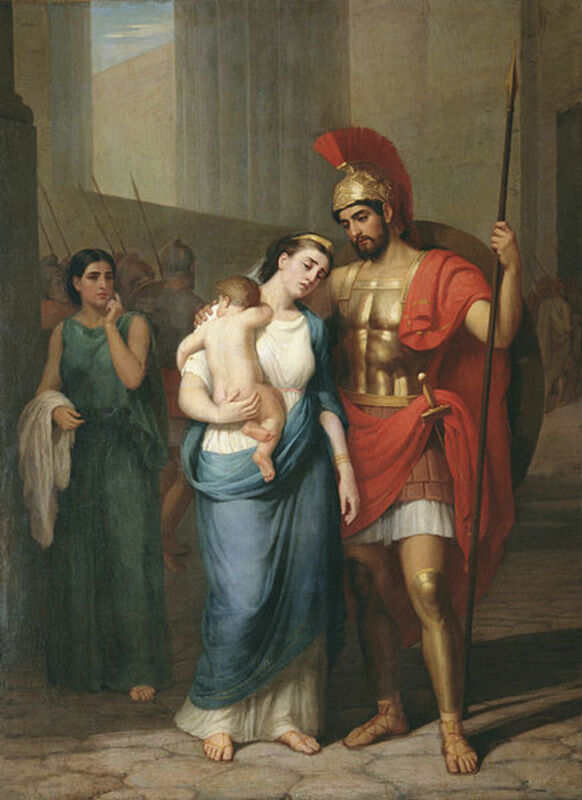 The story of Andromache would be made famous by Euripides, and was a tale of highs and lows. The Adventure of the Copper Beeches is a Sherlock Holmes story written by Sir Arthur Conan Doyle. The story deals with a client taking up a new job at a house called the Copper Beeches. 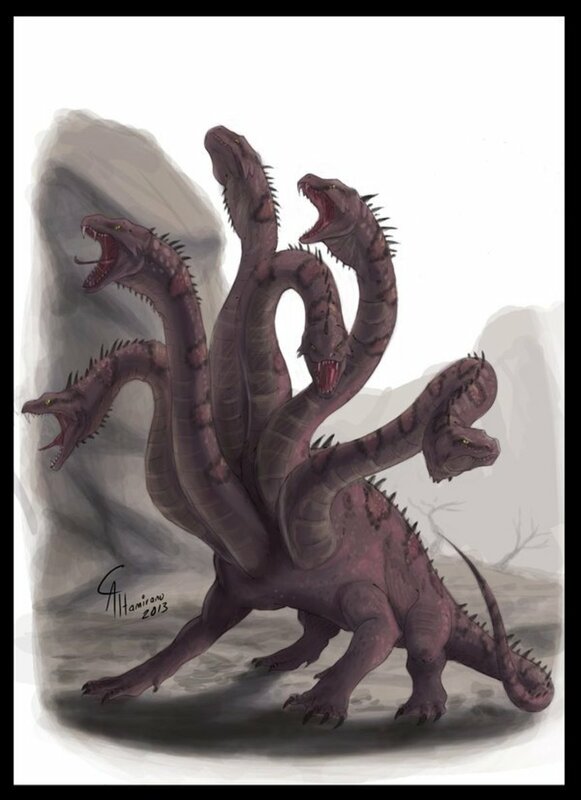 The Hecatonchires were three gigantic brothers from Greek mythology. Known for their 100 hands and 50 heads, these giants were siblings to the Cyclopes, and allies to Zeus and the Olympian gods. Io was a naiad, a water nymph, in Greek mythology. 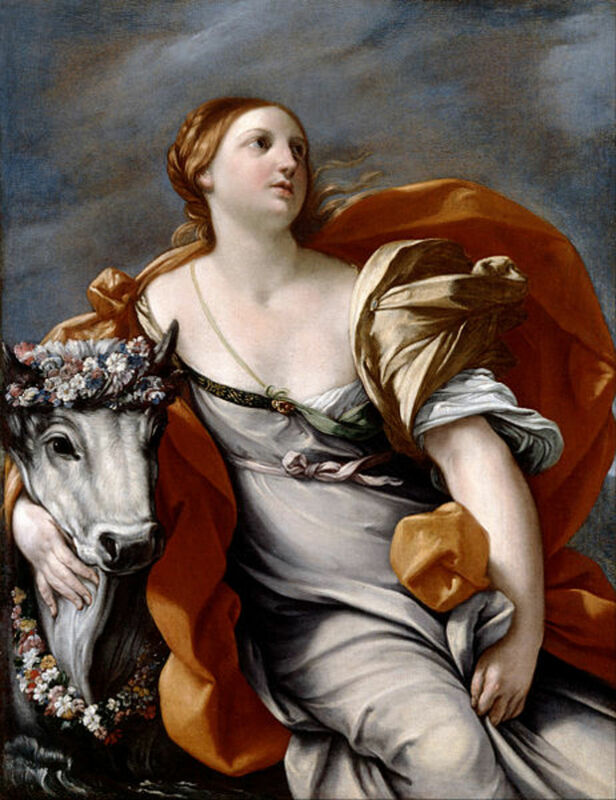 She is famous though for being a lover of Zeus; a lover who was persecuted by Hera, resulting in Io wandering the earth in the form of a cow. 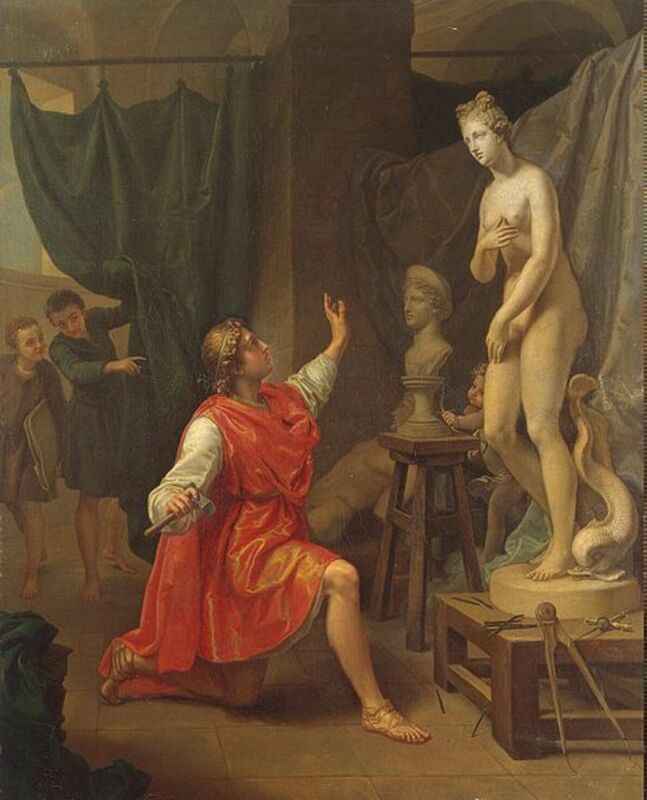 In Greek mythology Pygmalion was a Cypriot sculptor whose creation came to life; although of course today the name is more closely associated with a play by George Bernard Shaw. In Greek mythology, Hera was the wife of Zeus, and was one of the most powerful deities of Mount Olympus. 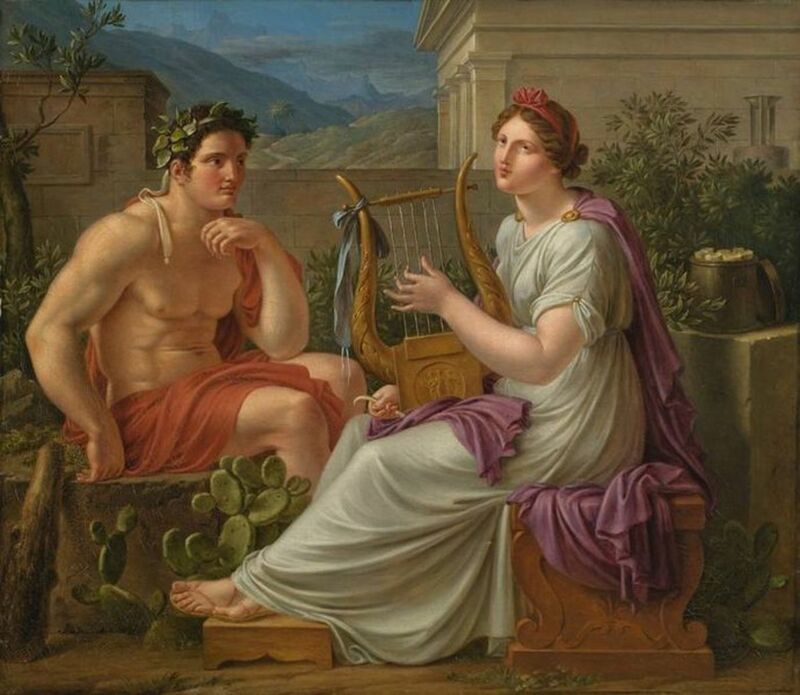 Many of the stories of Hera saw her dealing with the lovers of her husband. 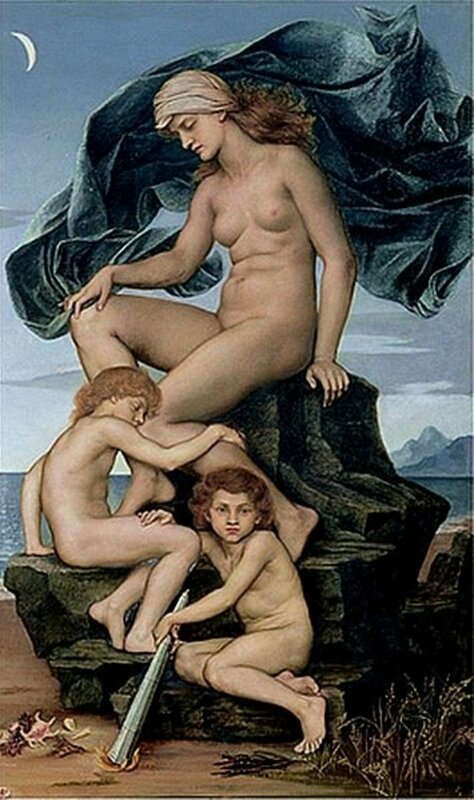 The Graeae were the three Grey Sisters of Greek mythology. 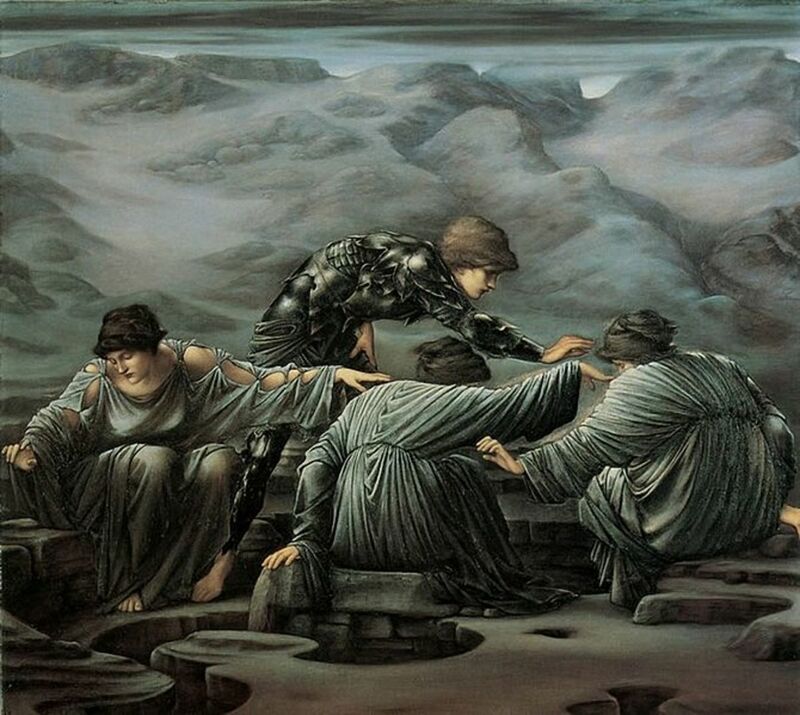 Famous for being the sisters of the Gorgons, the three Graeae were encountered by the hero Perseus in his quest for Medusa's head. The Protogenoi were the primordial gods of Greek mythology, coming into existence in a time before that of Zeus and the other Olympian gods. 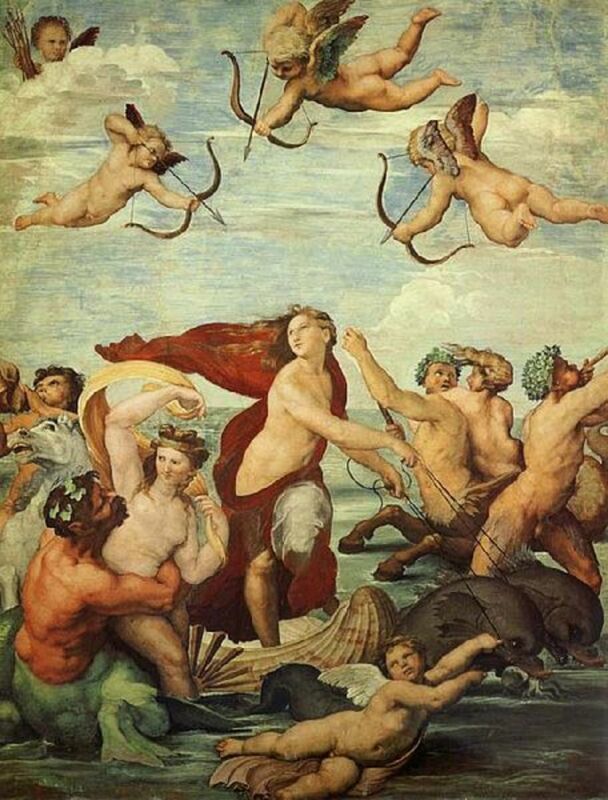 The first gods included the likes of Chaos, Gaia, and Eros. 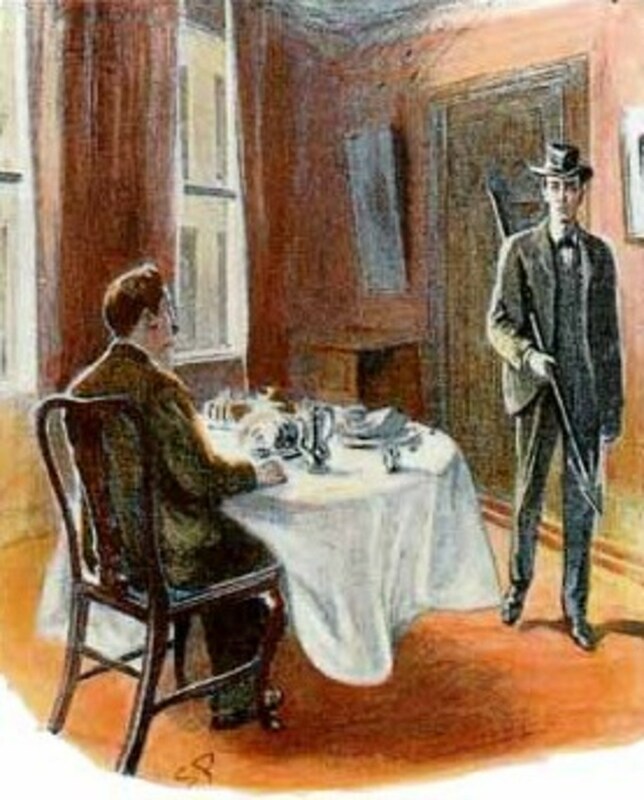 The Adventure of the Noble Bachelor is a short Sherlock Holmes story from Sir Arthur Conan Doyle. 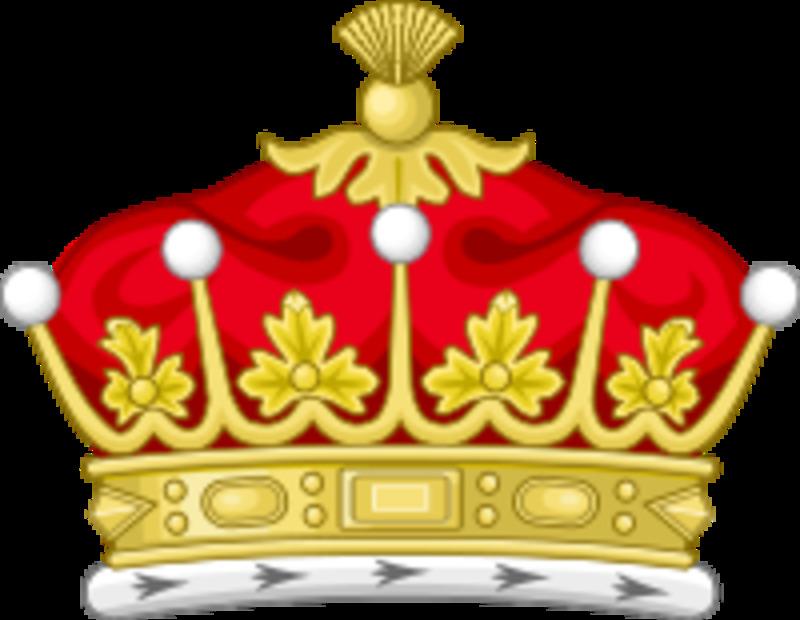 The case deals with the missing bride of Lord St Simon, one of England's most prominent nobles. 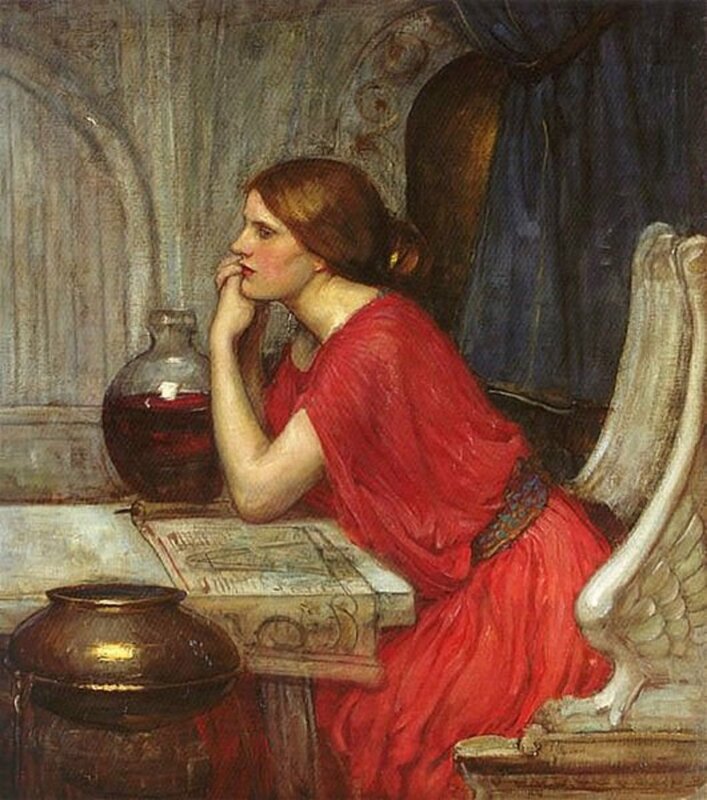 Medea was a princess of Colchis, a daughter of Aeetes and a sorceress. 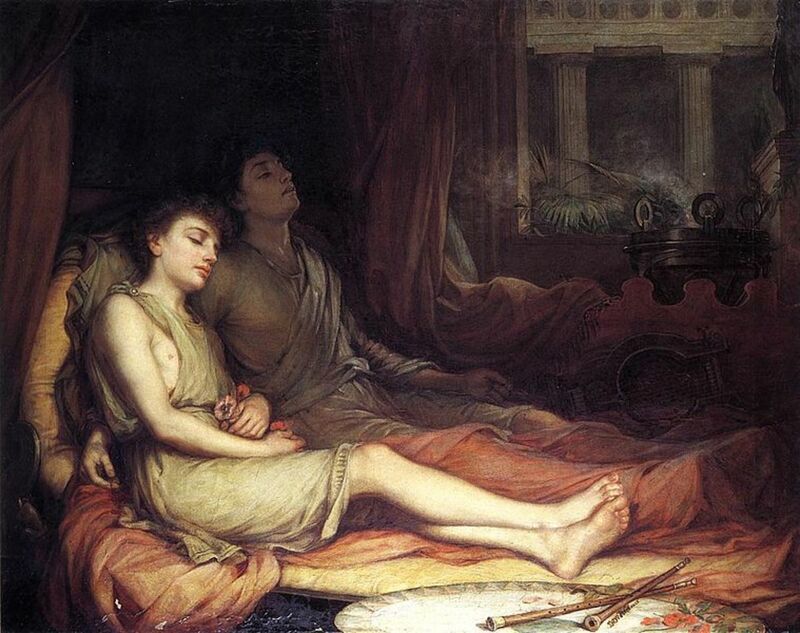 Famous for aiding Jason in his quest for the Golden Fleece, the life of Medea was one of highs and lows. Maia was a nymph from Greek mythology, and today is famous for having the month of May named after her. 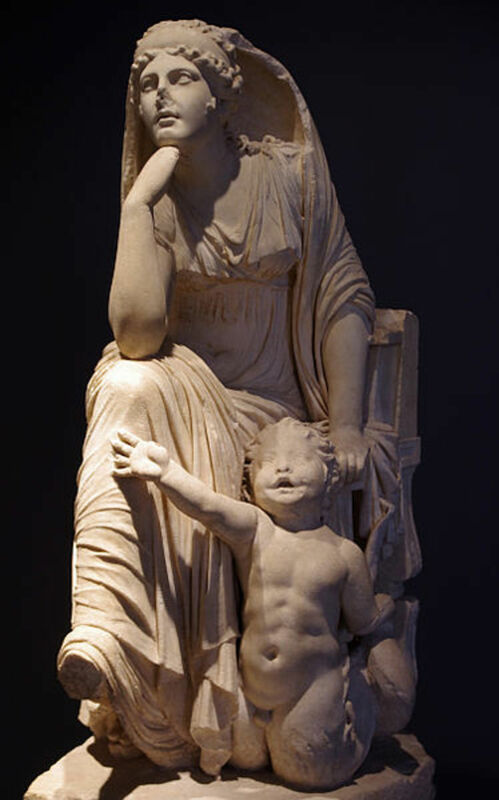 In Ancient Greece though, she was also famous for being the mother of Hermes. In Greek mythology Nemesis was a goddess of retribution, a bringer of law and order. Aligned with Zeus, she would create balance in the life of mortals, as well as ensuring that wrongs were righted. The Cretan Bull was a beast that ravaged Crete in Greek mythology; it was a beast that was first encountered by the hero Heracles, and then later by Theseus. Gaia was one of the earliest deities of the Greek pantheon, and was the personification of the Earth. Gaia was referred to as the Mother Goddess, with a large number of other gods descended from her. 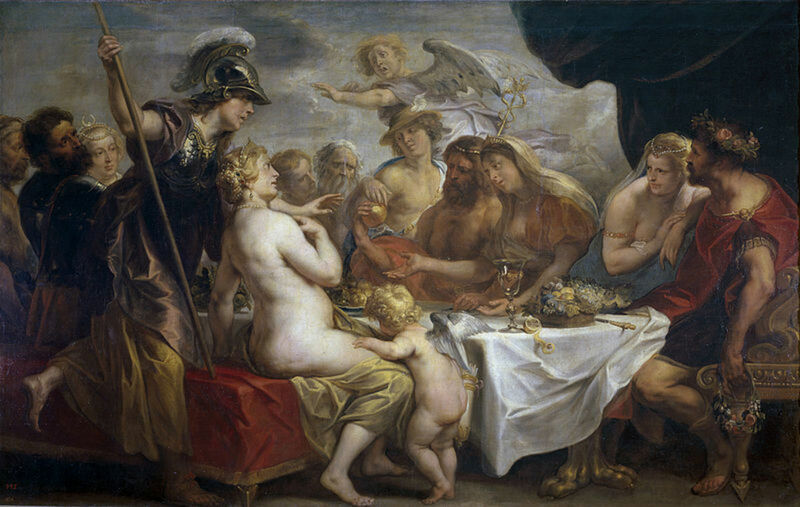 The Judgement of Paris was a decision given by the Trojan Prince, Paris, in Greek Mythology. The decision was the answer to the question who was the most beautiful of all the goddesses. Typhon was a monster from Greek mythology. 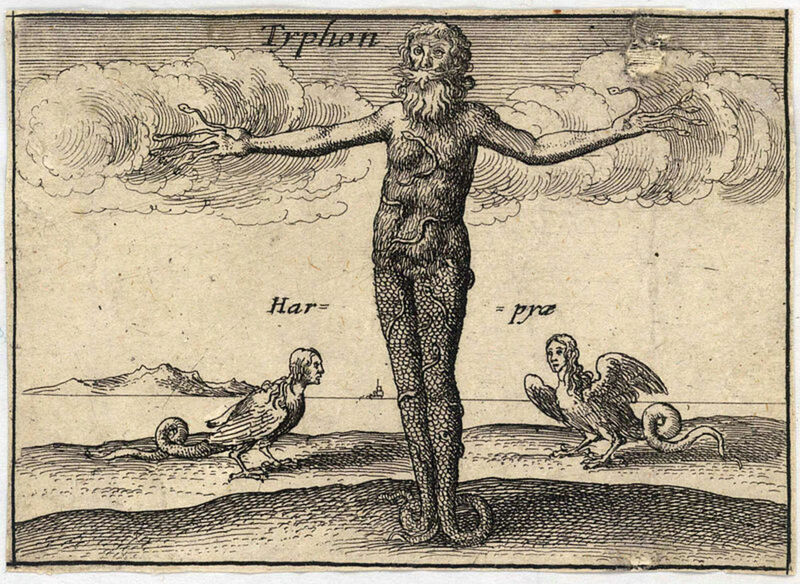 Whilst not the most famous of monsters, Typhon was the most monstrous, and the father of many other famous creatures. 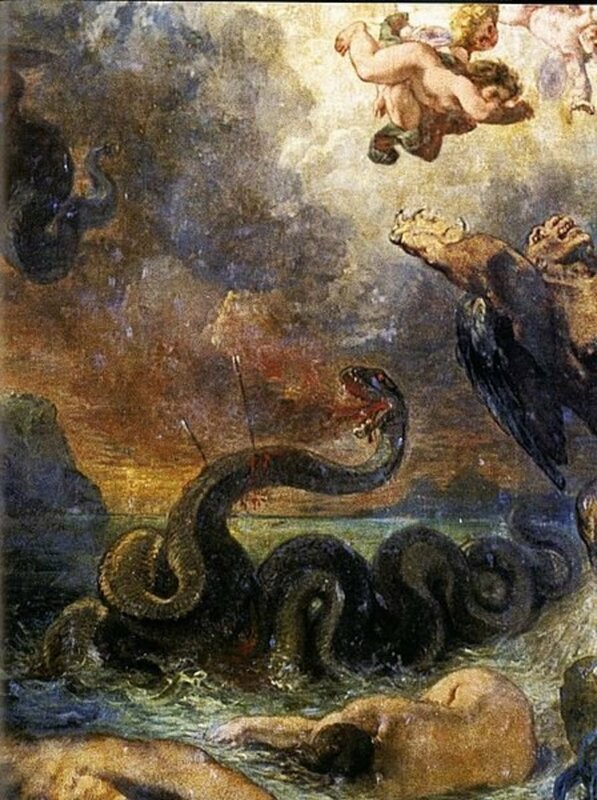 The Python was the name given to a monstrous serpent in Greek mythology. The Python was the child of Gaia, and the one time tool of Hera, and would ultimately be a foe of Apollo. 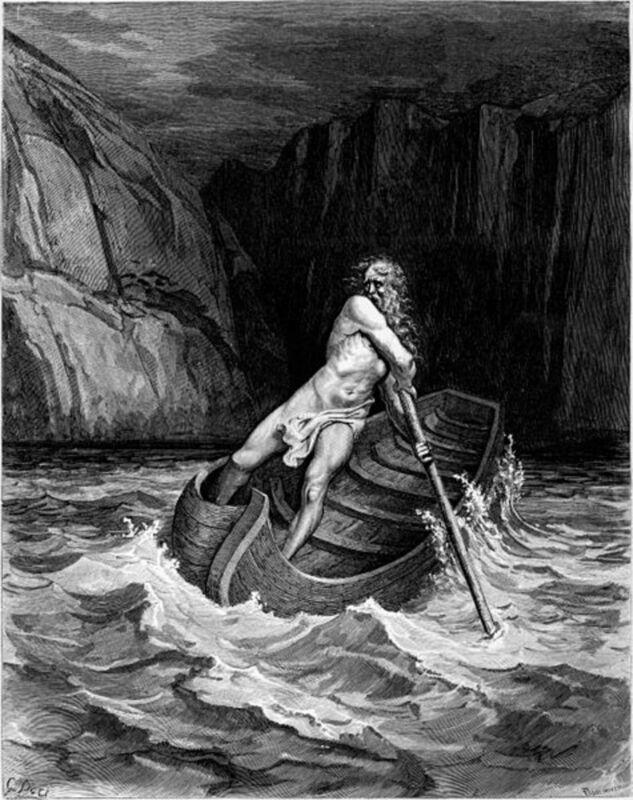 Charon was a minor god, or daemon, of the ancient Greek pantheon. 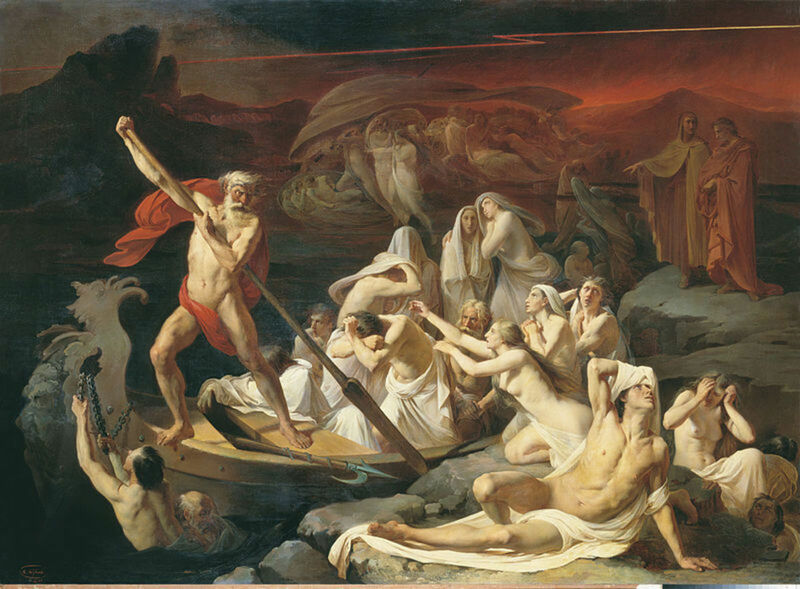 In Greek mythology Charon was famed as the ferryman of the deceased, transporting the souls of those buried with funeral rites, across the River Acheron. The Adventure of the Engineer's Thumb is a short Sherlock Holmes story that sees the detective dealing with a client who has had his thumb cut off during a strange evening adventure. 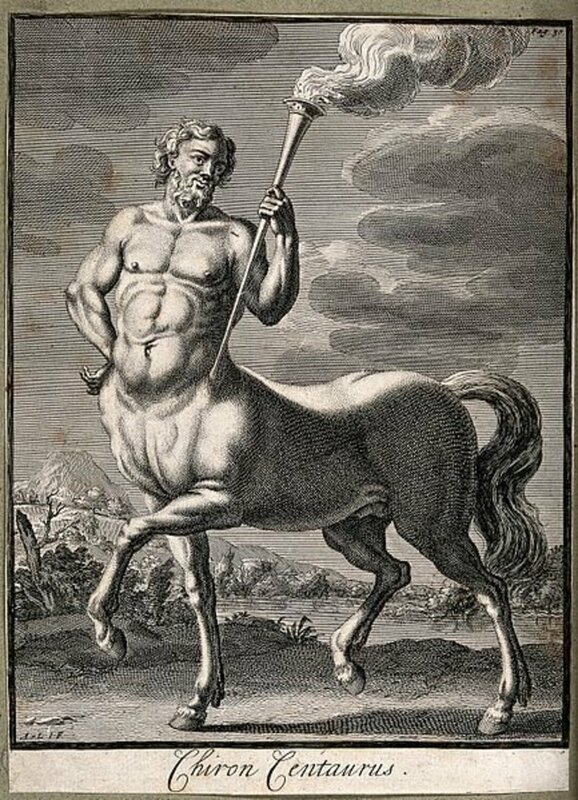 Centaurs are some of the most recognisable creatures from Greek mythology; and the half horse, half male creatures would feature in numerous stories. 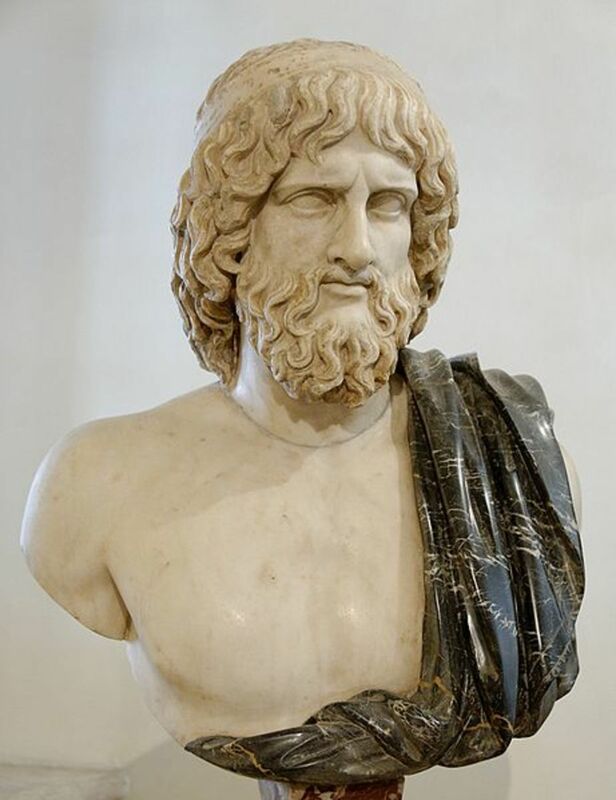 Zeus is the most famous of all Greek deities, and is regarded as the supreme god of the Greek pantheon. Zeus came to power by dethroning his father, Kronos, and would subsequently cement his position. 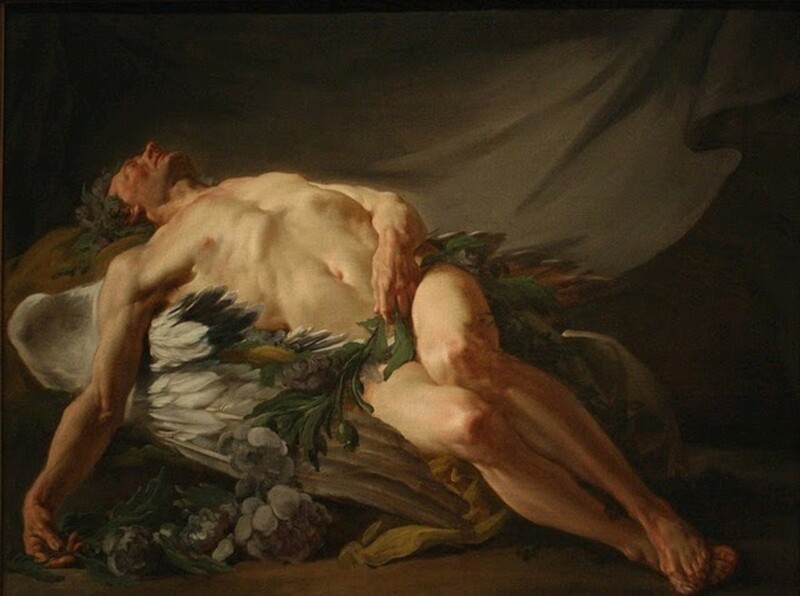 Ganymede was a mortal prince in Greek mythology. 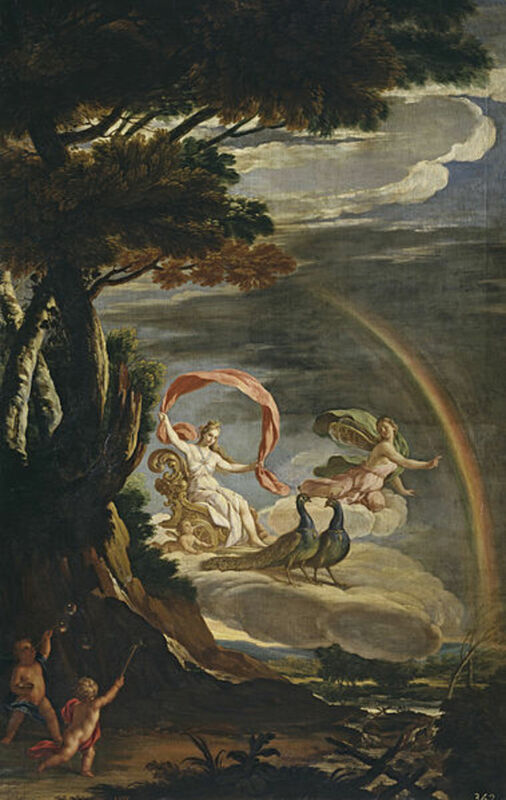 Catching the eye of Zeus though, Ganymede would be transported to Mount Olympus and would become immortal. 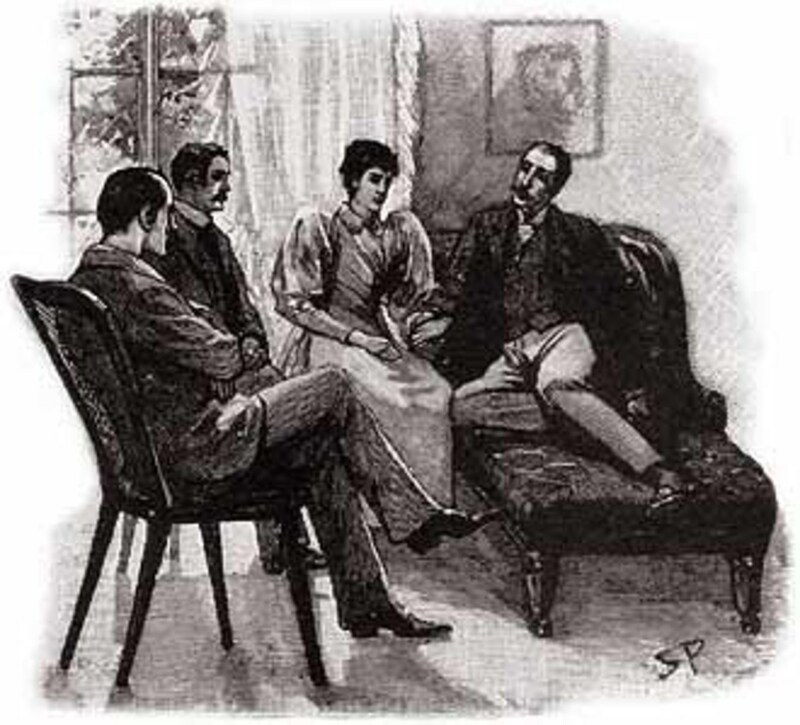 The Adventure of the Speckled Band is a Sherlock Holmes short story written by Sir Arthur Conan Doyle. The Speckled Band tells of murder most foul, undertaken by an evil villain. Asclepius is perhaps not the most famous individual from Greek mythology, but he was the most famous healer of the day; and a link to modern day medicine still exists. 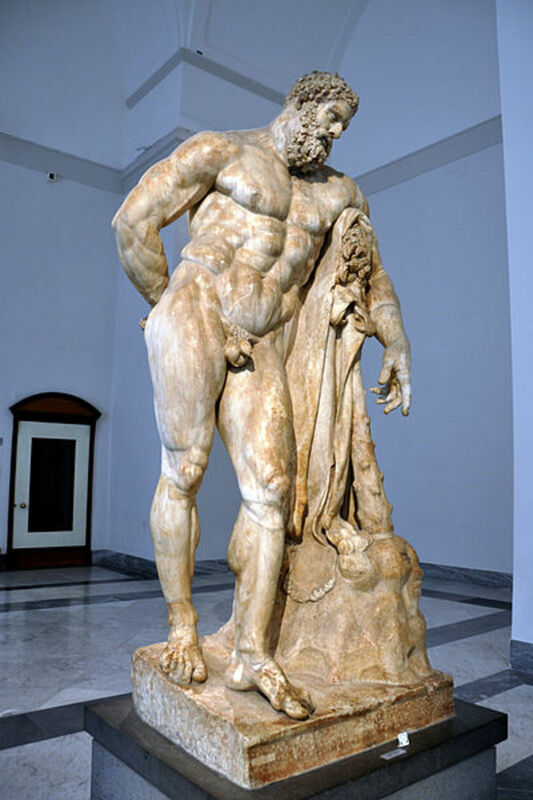 Heracles, or Hercules as he is also known, was the greatest of all Greek heroes, and today is the most famous. 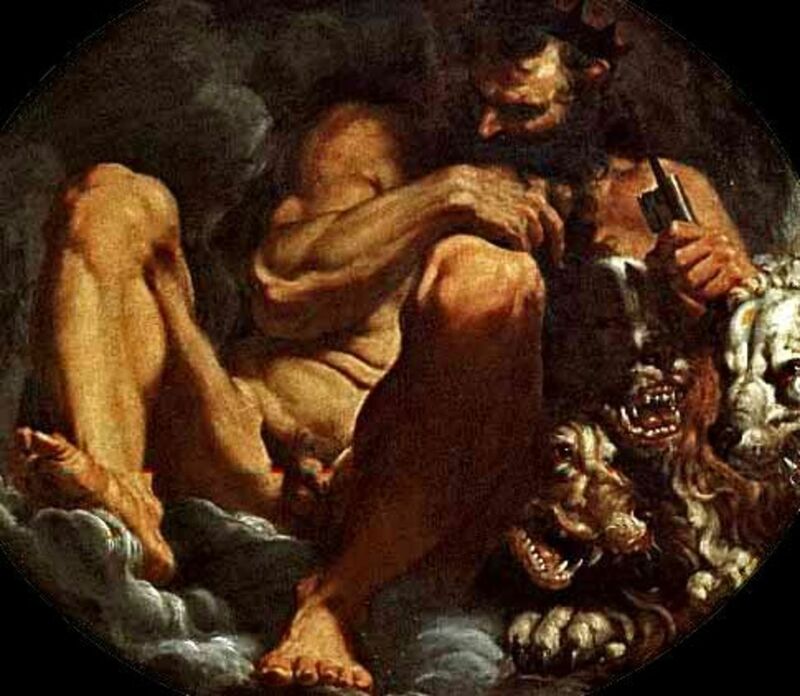 A demi-god, a son of Zeus, Heracles life was full of adventures including the 12 Labours. 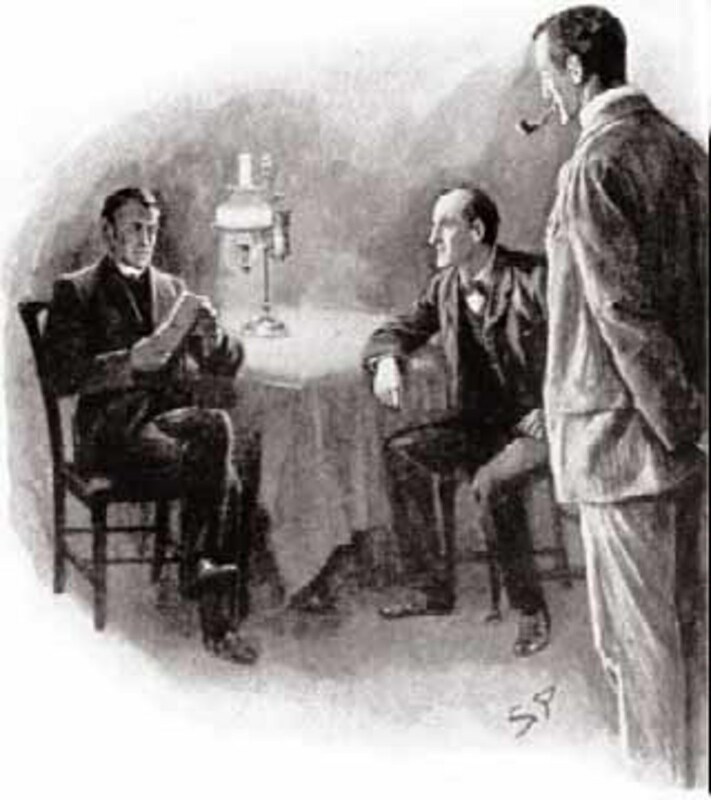 The Blue Carbuncle is a short story from Sir Arthur Conan Doyle featuring Sherlock Holmes and Dr Watson. 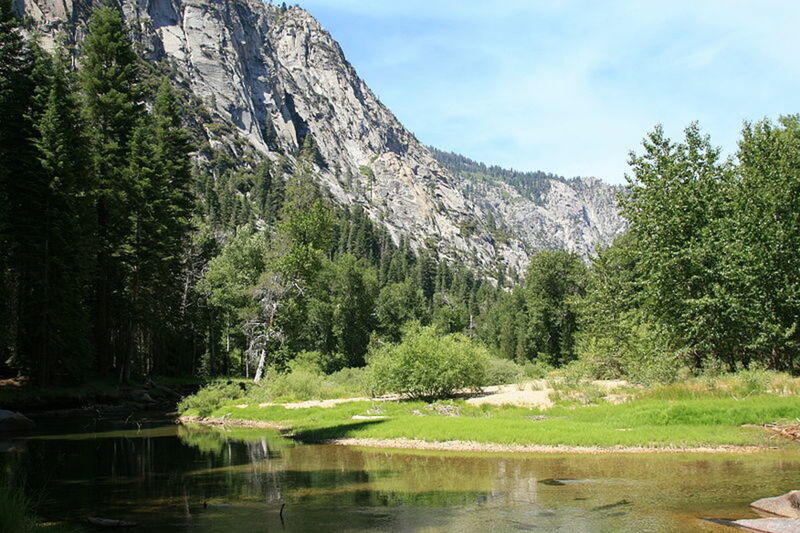 Dealing initially with a lost goose and hat, the case evolves into a more serious adventure. 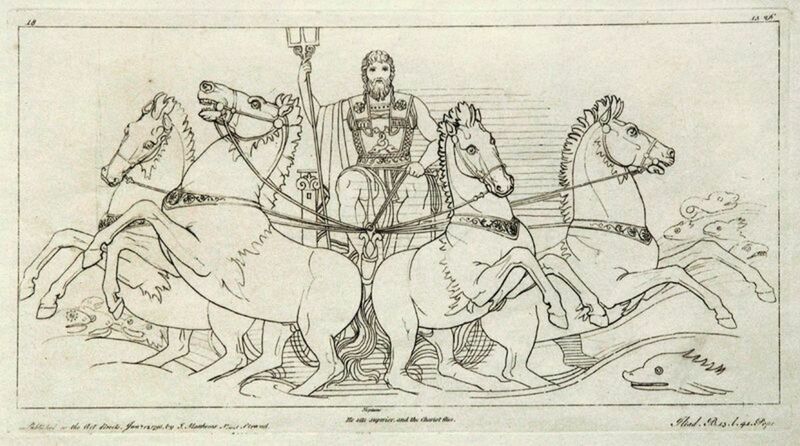 When people think of Chaos they might not immediately think of a Greek deity, but in Greek mythology, Chaos was the first god in the Greek pantheon. 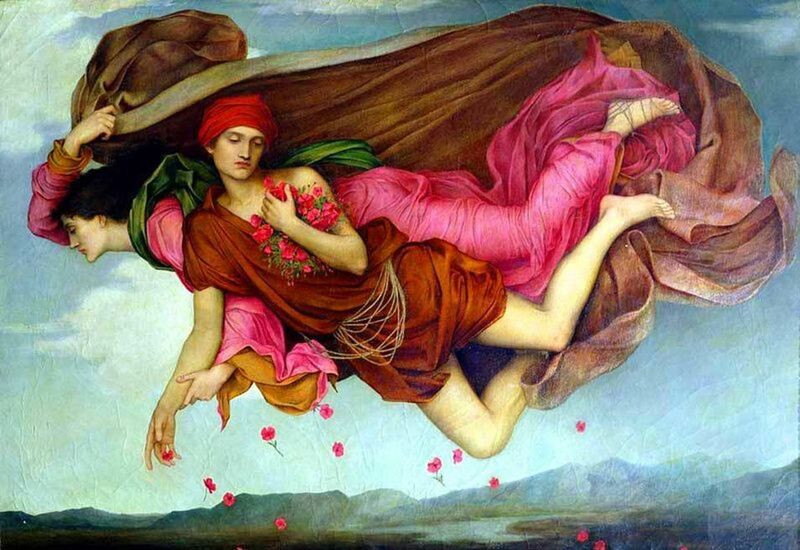 In Ancient Rome, Morpheus was a god of dreams. 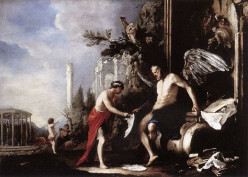 Morpheus was the son of Sumnus, the god of sleep, and would come to prominence in Metamorphoses, the epic work from Ovid. 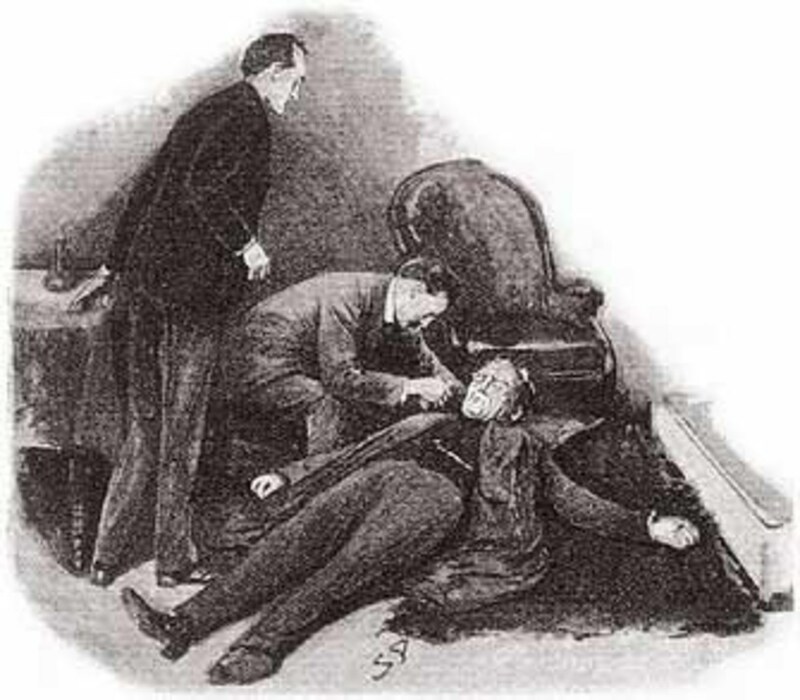 The Man with the Twisted Lip is a short story from Sir Arthur Conan Doyle that sees another case taken on by Sherlock Holmes. The case deals with something that on the surface looks like murder. The fauns are some of the most identifiable figures from ancient mythology. 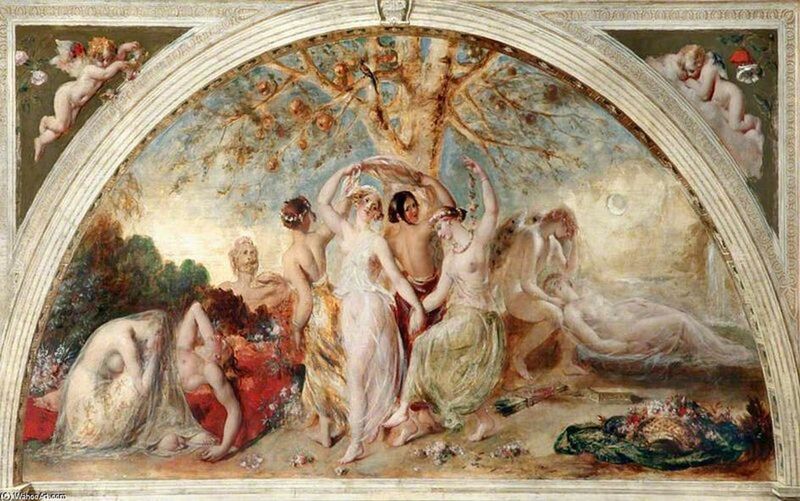 Fauns were originally part of Roman mythology, but have been part of art and literature ever since. 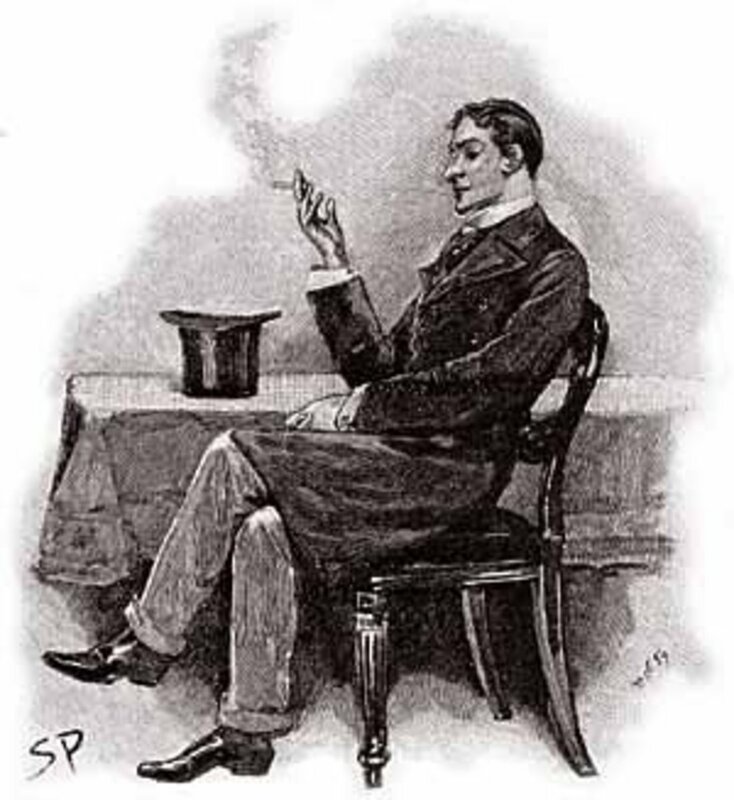 Sherlock Holmes is the most portrayed literary character on the big and small screen. 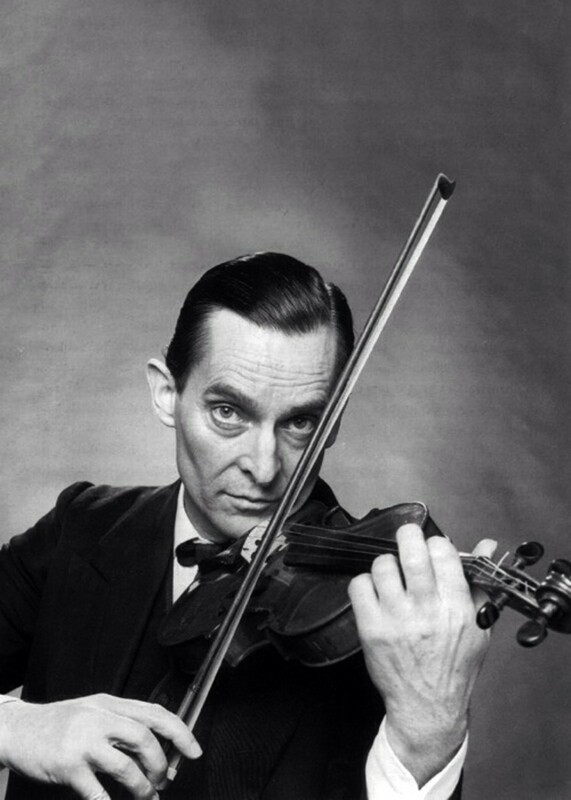 Seventy or more actors have played Sherlock Holmes, some with famous and distinguished performances. Iris is the Goddess of the Rainbow in Greek mythology, and acted as a messenger deity for the gods and goddesses of Mount Olympus. 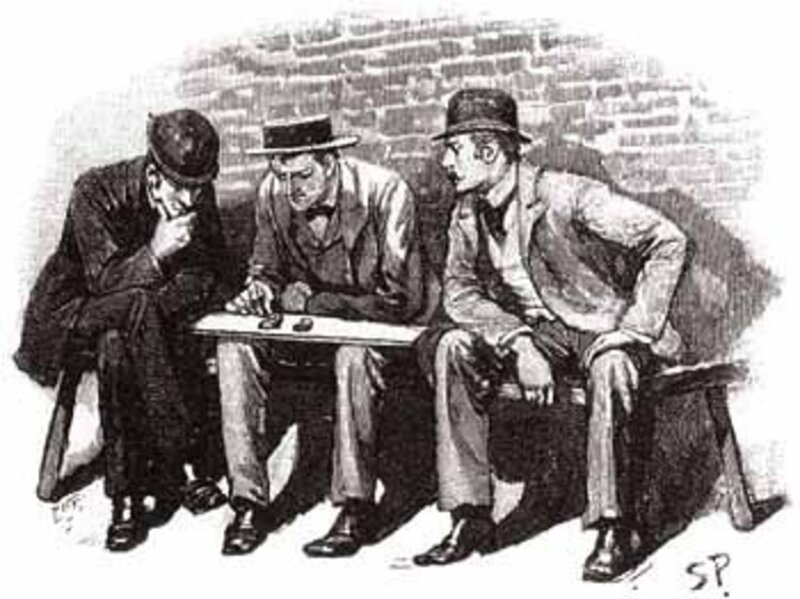 The Five Orange Pips is a Sherlock Holmes case that sees the consulting detective dealing with the seemingly innocuous problem of orange pips being delivered in the mail. 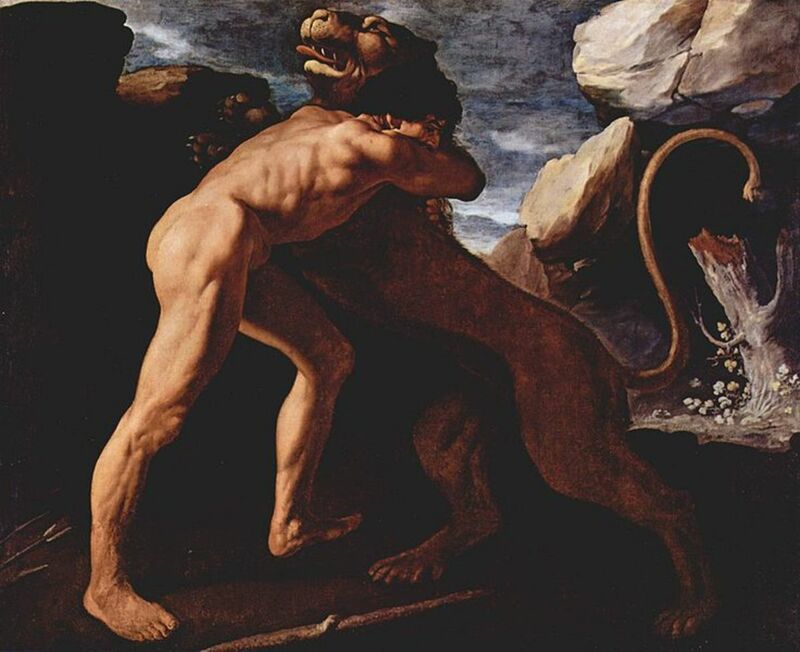 The Chimera was one of the monsters that were believed to exist in Ancient Greece. 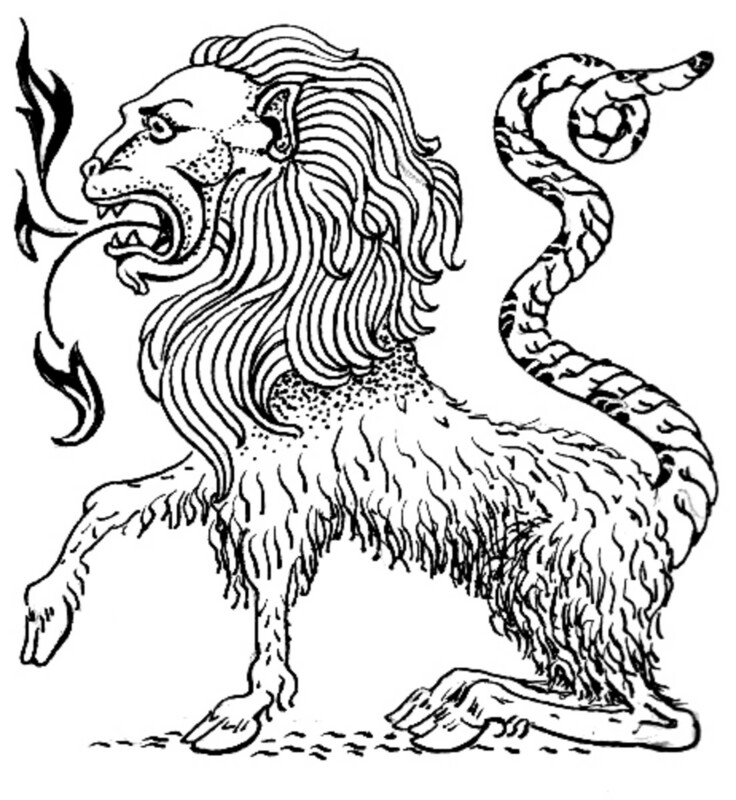 A hybrid monster made up of a lion, a goat and snake, the Chimera was a deadly beast. 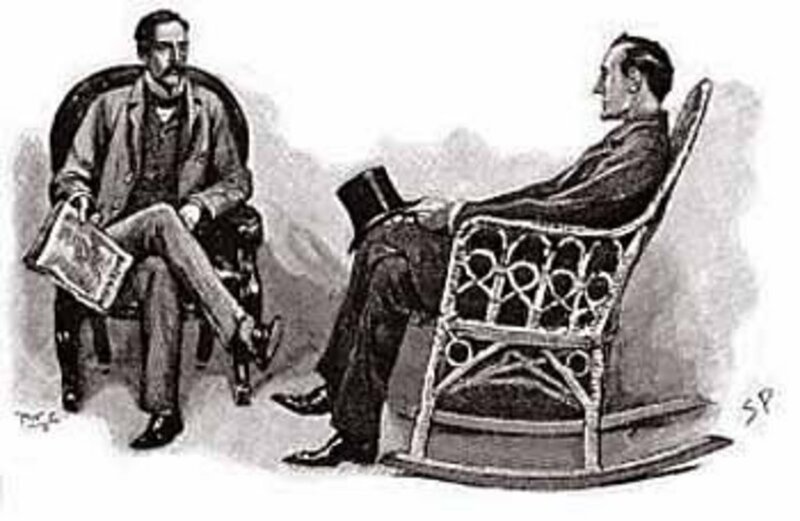 The Boscombe Valley Mystery is one of the early stories about Sherlock Holmes written by Sir Arthur Conan Doyle. It is a tale of murder where the police arrest the wrong person. 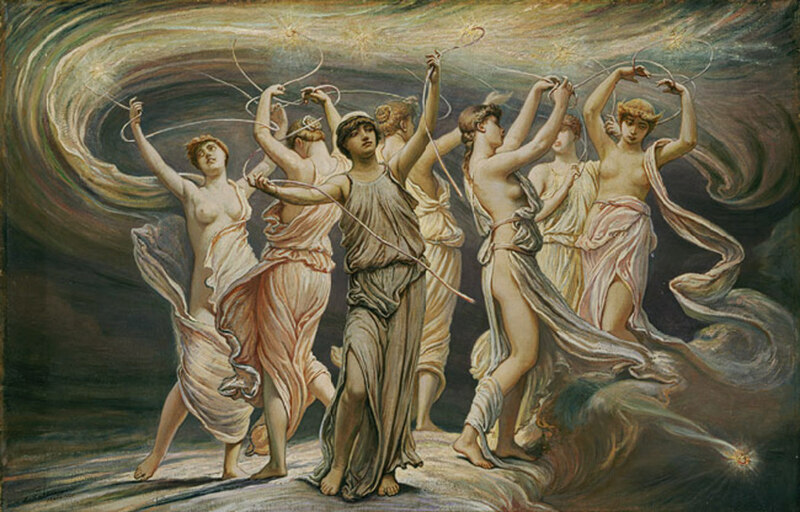 The muses were minor goddesses in Greek mythology, with a role to inspire poets, artists, sculptors and inventors; and the concept of the muse lives on into the modern day. 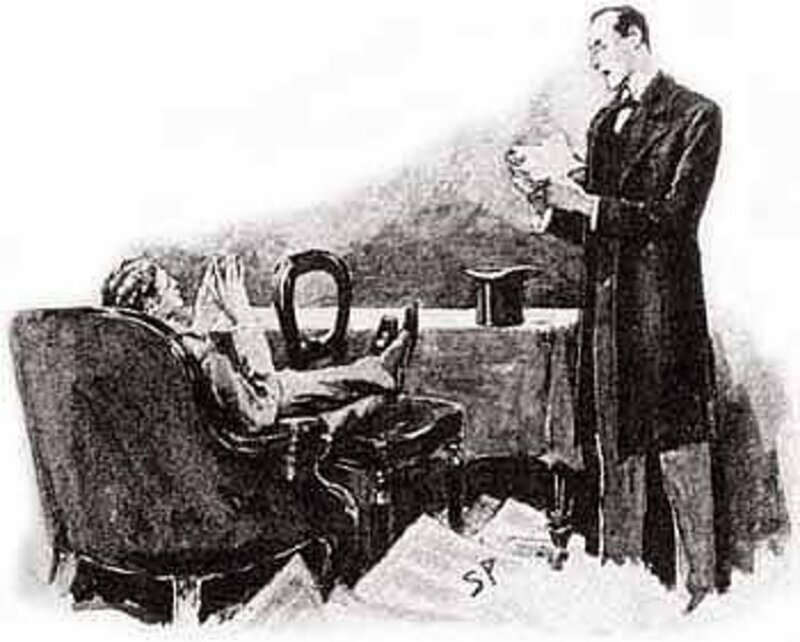 A Case of Identity is one of the least known Sherlock Holmes stories, and is often overlooked in the original Sir Arthur Conan Doyle canon. Ultimately the case is one of a missing fiance. 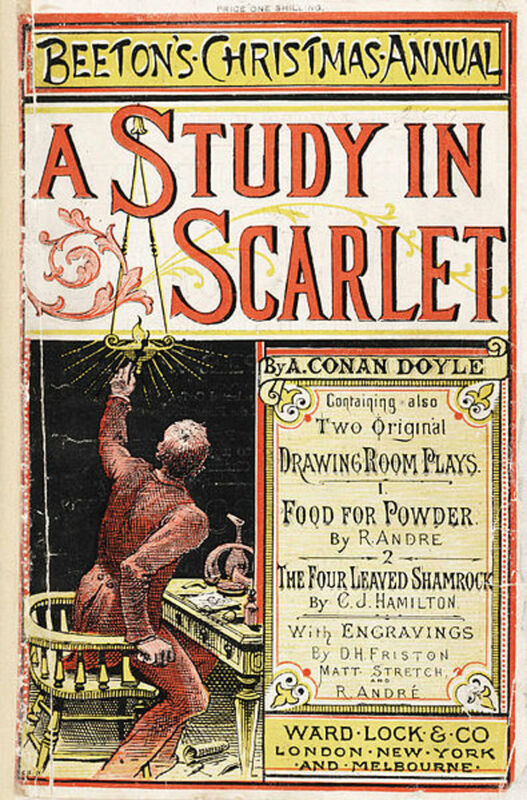 The case of the Red Headed League is the second short story to feature Sherlock Holmes. In this case Holmes investigates when Jebez Wilson loses his part-time job. Medusa is one of the most famous monsters from Greek mythology. With hair of snakes, and gaze that could transform man into stone, Medusa would eventually meet her downfall at the hands of Perseus. 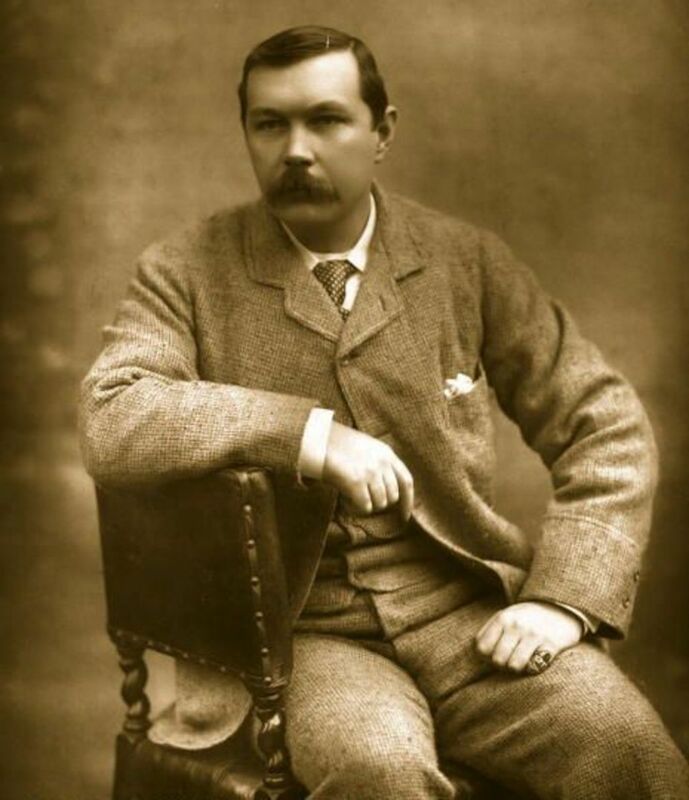 One hundred years ago Sir Arthur Conan Doyle was the best paid author of his day, he was though more than just the creator of Sherlock Holmes, and there are many strange facts associated with him. 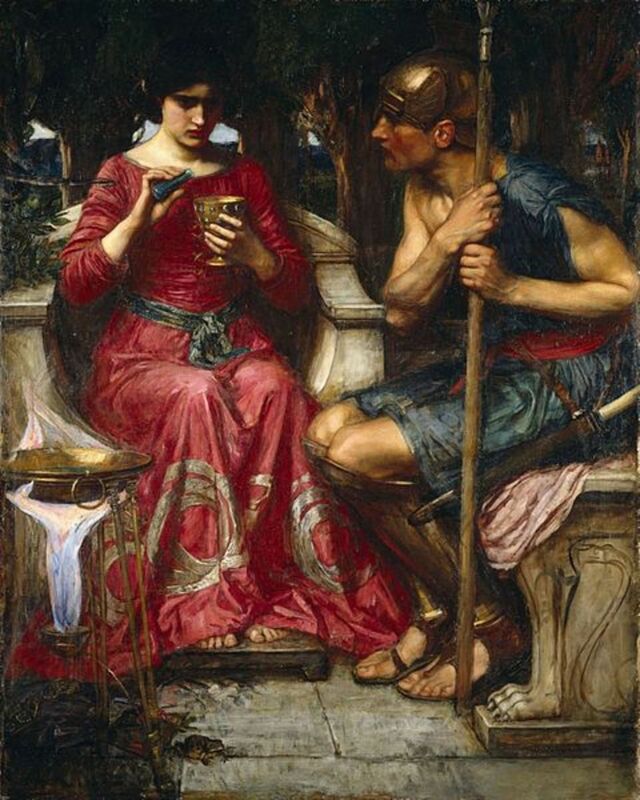 Circe was one of the sorceresses who appeared in stories from Greek mythology; of these sorceresses, Circe and Medea are arguably the best known. 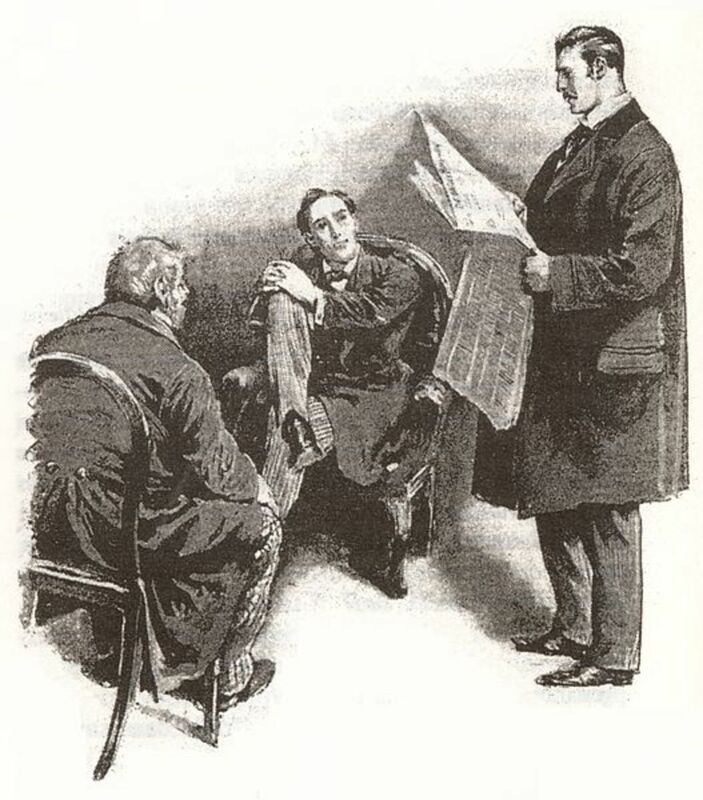 Sherlock Holmes is one of English literature's most famous and enduring characters; a Scandal in Bohemia was the first of the short stories to feature the consulting detective. 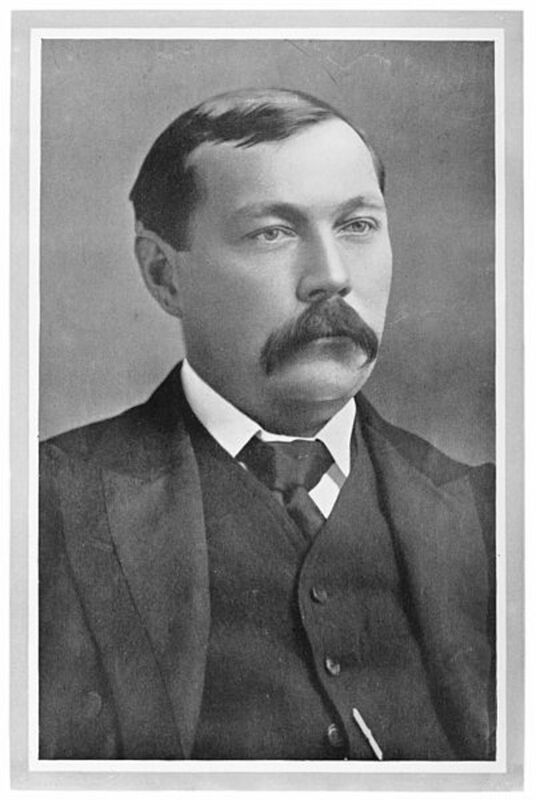 Plot Summary: "The Lost World"
Famous for his Sherlock Holmes stories, Sir Arthur Conan Doyle was far from enamored with his most famous creation, and so wrote many fantastical stories. The most famous of these was The Lost World. Thetis is a minor sea goddess from Greek mythology. 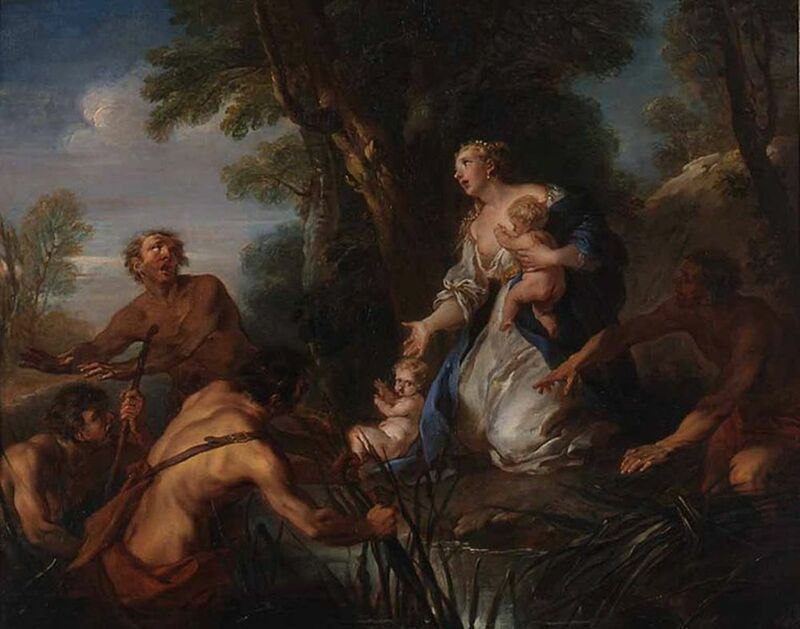 Whilst Thetis appears in several stories from Ancient Greece, she is more famous as the mother of the Greek hero Achilles. 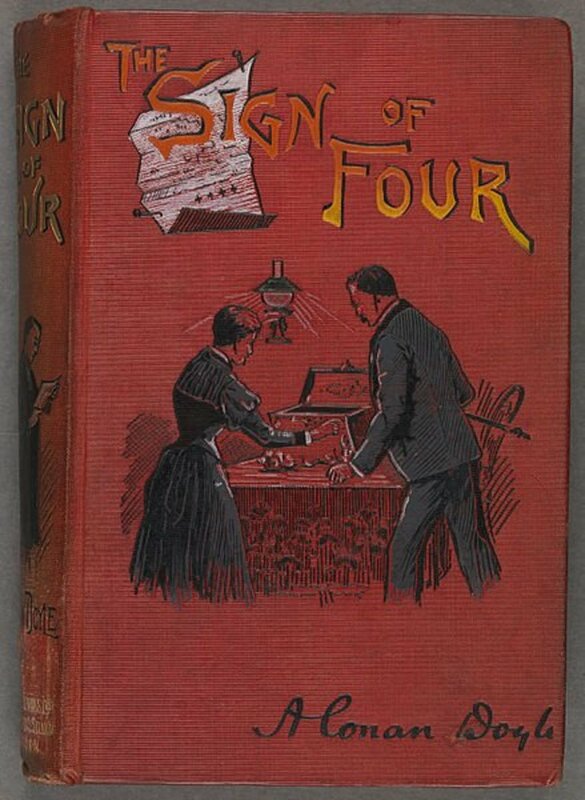 The world was introduced to Sherlock Holmes in "A Study in Scarlet", three years later Sir Arthur Conan Doyle would reprise the character with "The Sign of Four". Jack Frost is the most famous personification of winter, and the impish, mischievous Jack uses ice to create and to have fun. 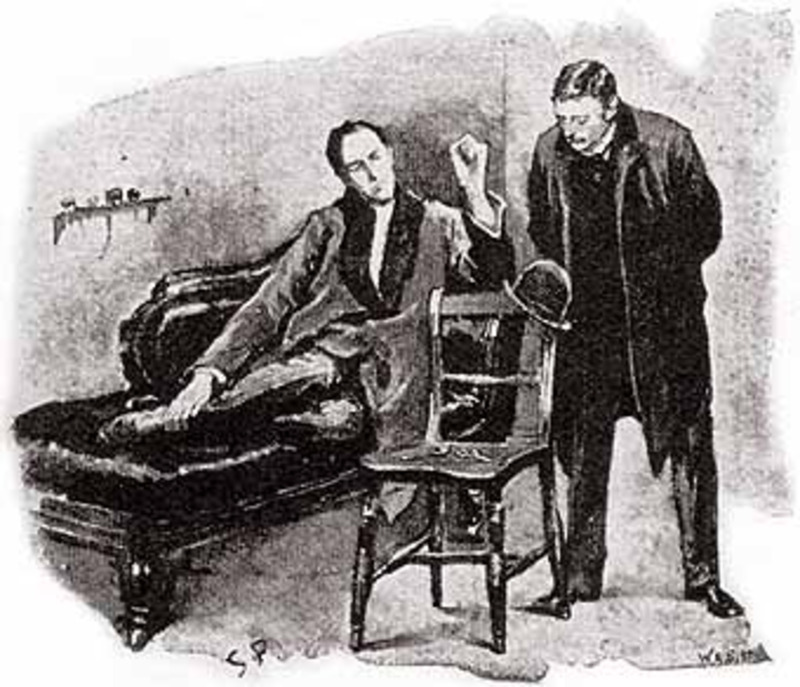 Sherlock Holmes and Dr John Watson are two of the most famous characters from English Literature. 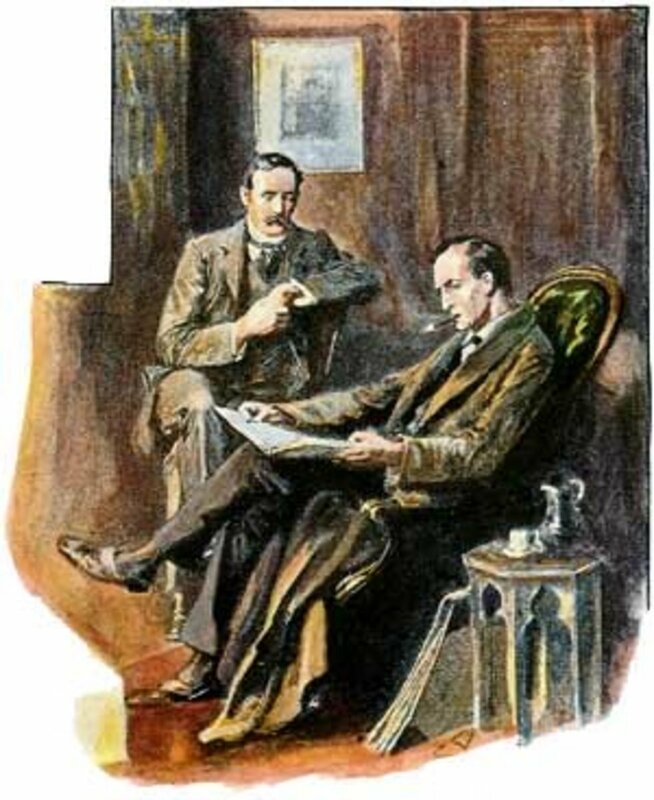 The detective and his companion would feature is 60 stories written by Sir Arthur Conan Doyle. 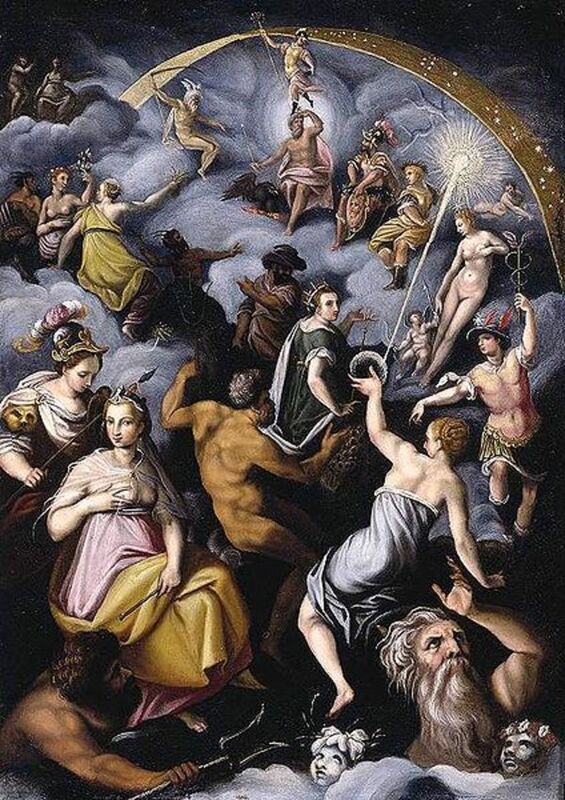 The story of creation is an area that all religions deal with; the story of Deucalion and Pyrrha are one part of that story in Ancient Greece. The pair though are also connected with a flood myth. 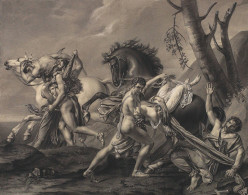 The goddess Eris is not the most famous deity in Greek mythology, but she was pivotal in bringing about the Trojan War. Eris is the goddess of Discord, and she could drive a wedge between anyone. 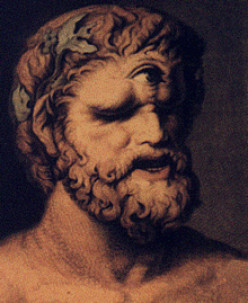 The single-eyed giants that were the Cyclopes are some of the most recognisable figures from Greek mythology. In Ancient Greece there were two distinct generations of Cyclopes. 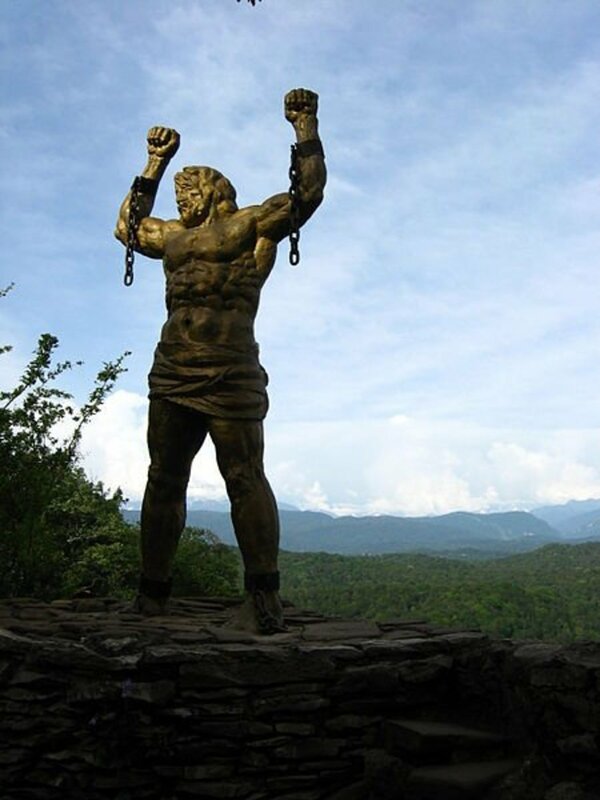 Philoctetes was a Greek hero who fought for the Achaean forces at Troy, though not as famous as the likes of Achilles or Odysseus, his role was vital to the victory of the Greeks. 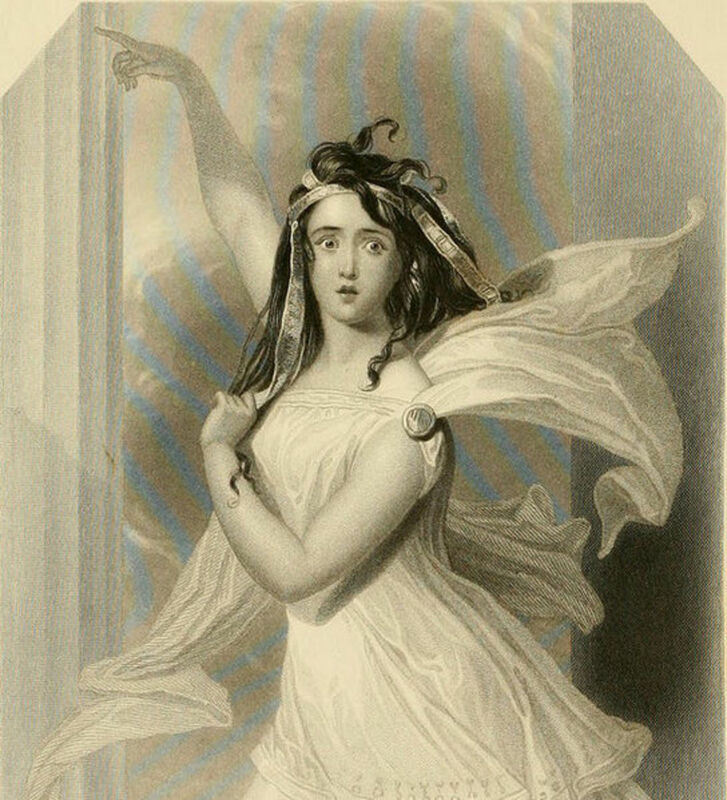 Cassandra was one of the seers of Greek mythology, featuring alongside the likes of Calchas and Helenus. Cassandra though was cursed by Apollo, and so her predictions were never believed. The story of Zeus and Europa in Greek mythology is a well known love story, with the supreme deity abducting Europa before seducing her. 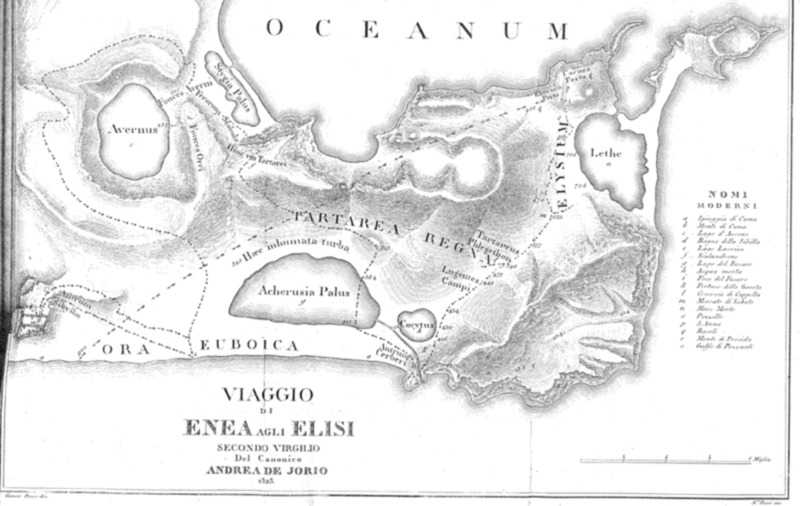 The Golden Fleece was the treasure that Jason and the other Argonauts went to Colchis to recover on a seemingly impossible quest. The Golden Fleece though was more than a simple treasure. Pegasus is one of the mythical creatures of Ancient Greece, who is still famous and recognisable. The winged horse of Greek mythology would be closely associated with the Greek hero Bellerophon. 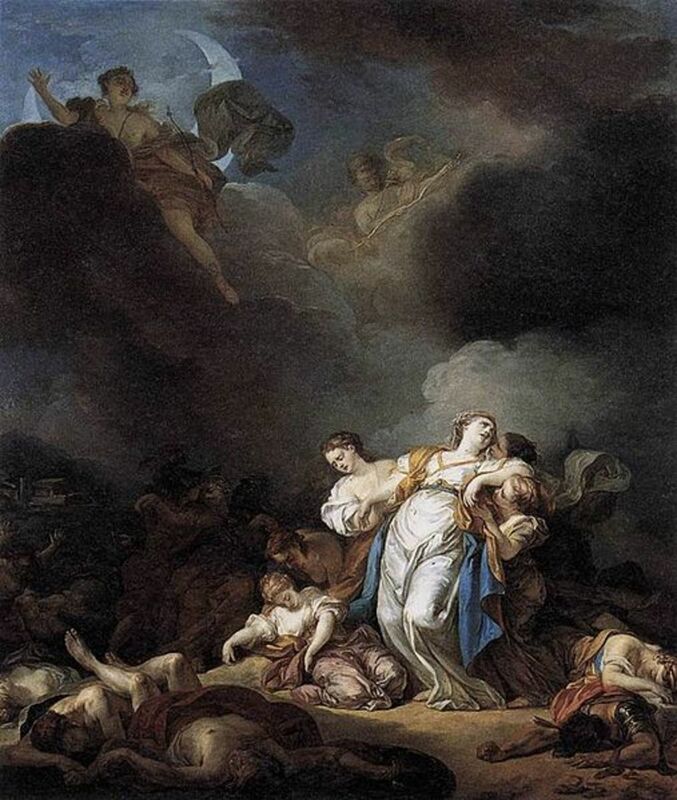 Helen of Troy is famous in Greek mythology for being one of the causes of the Trojan War. Before her abduction by Paris she had been married, and all of the most eligible of men had vied for her hand. 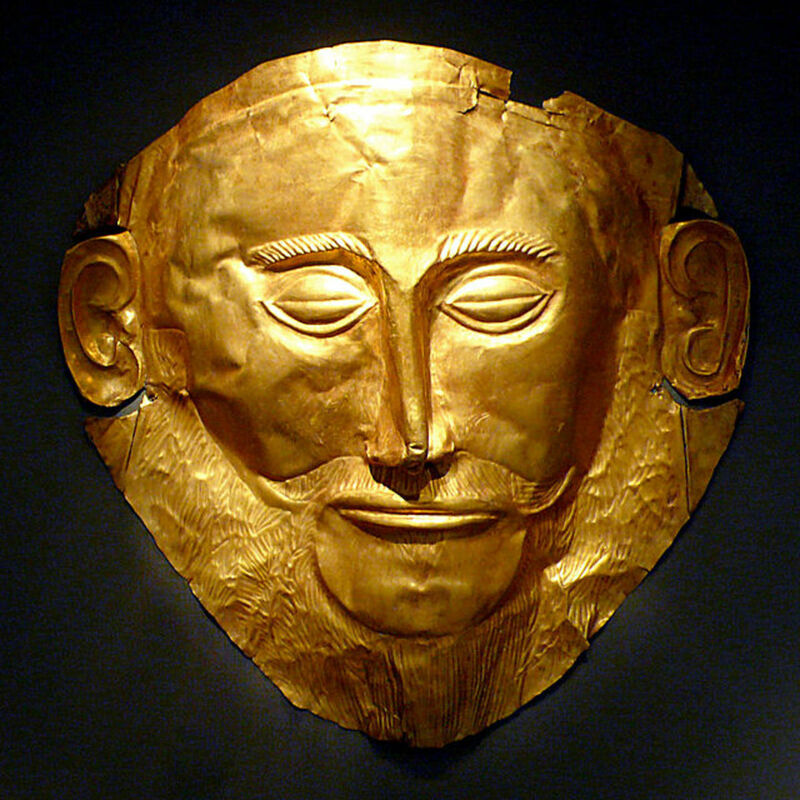 In Greek mythology Agamemnon was one of the kings of Ancient Greece. 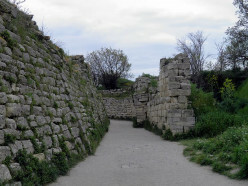 The King of Mycenae, Agamemnon famously lead he Greeks during the Trojan War, but his death subsequently was also notable. 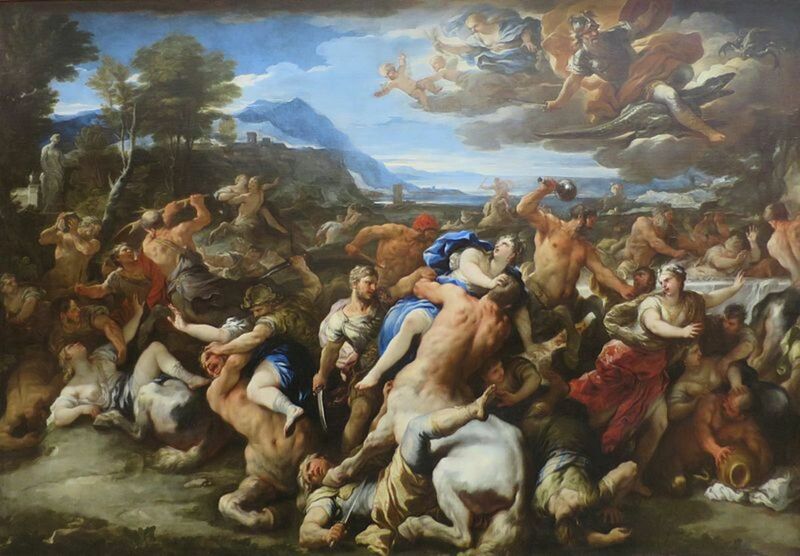 The Gigantomachy was one of the wars that took place in the stories of Ancient Greece. 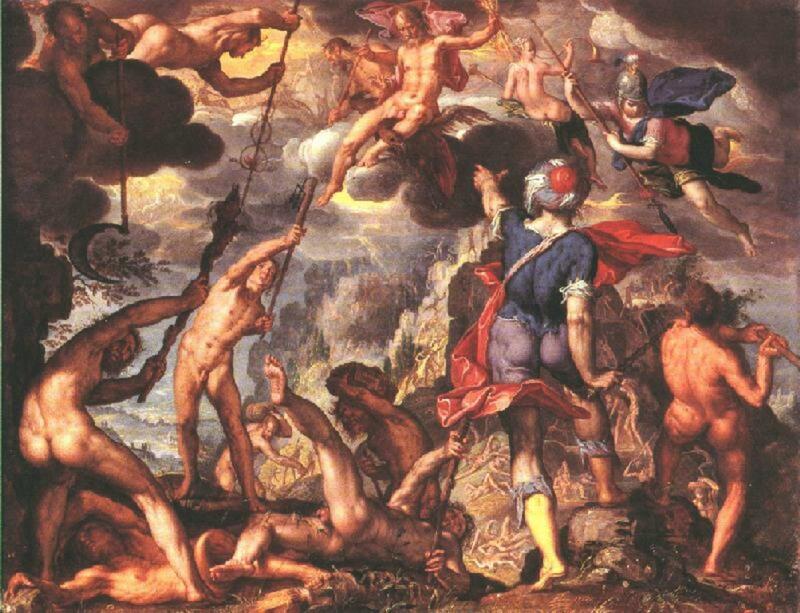 Specifically the Gigantomachy told of the war between the Gigantes, the giants, and the gods of Mount Olympus. 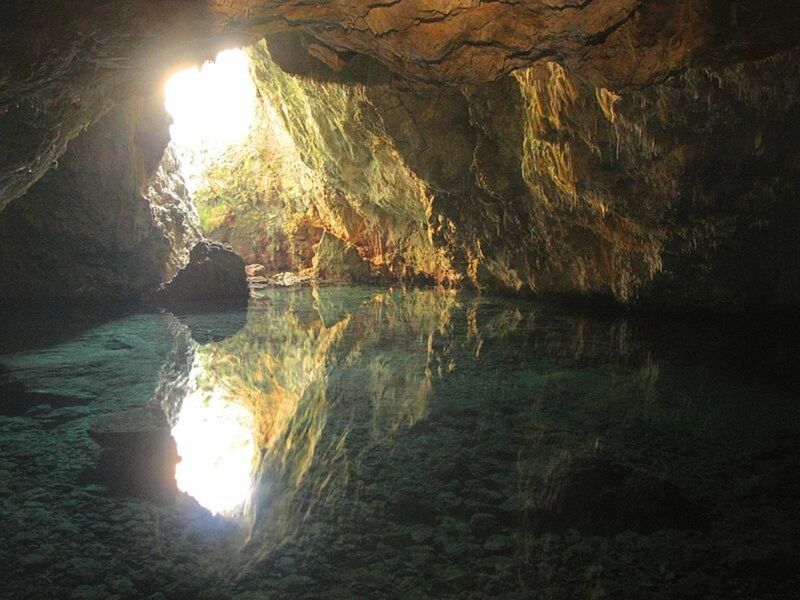 In Greek mythology Tartarus was both a god and also a region deep below the surface of the earth. 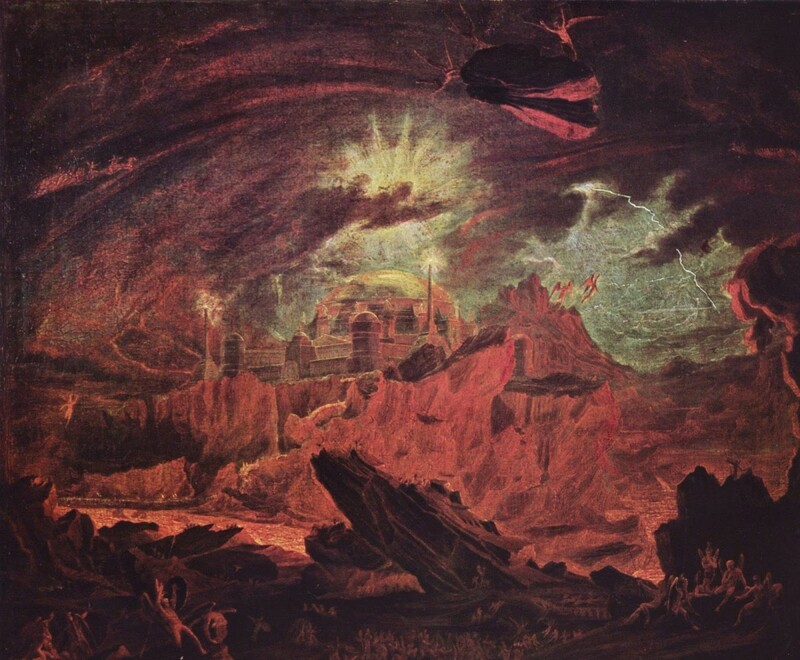 More famous as a prison than a deity, Tartarus was home to many notable prisoners. 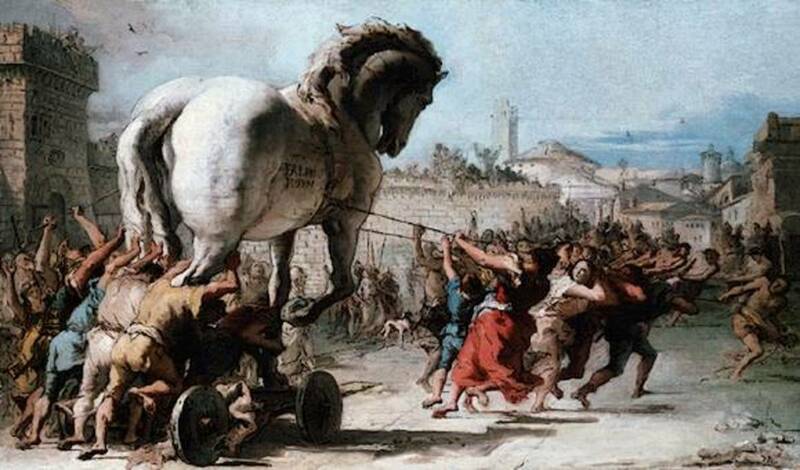 The Wooden Horse was the implement by which the Greek forces emerged in the Trojan War. Heroes hidden within the belly of the Trojan Horse managed to take the city of Troy by surprise. 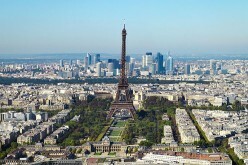 Paris as well as being the capital of France, is one of Europe's most visited cities. Millions of tourists visit every year, but there is often a thought that there are places that should be avoided. 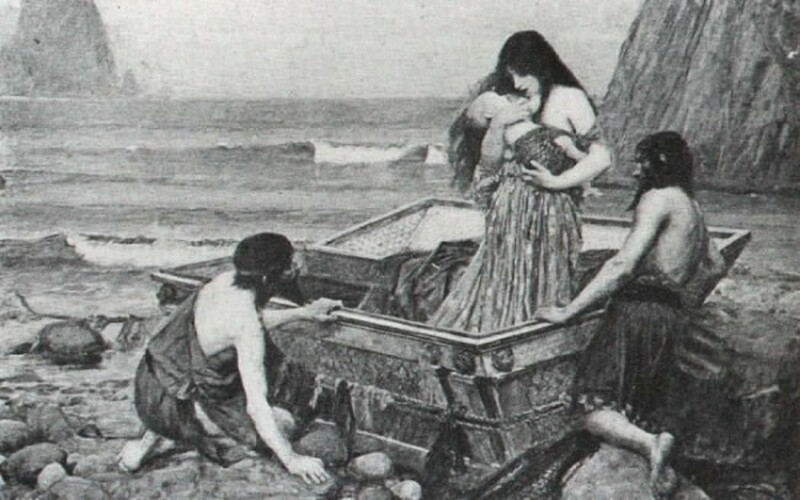 The idea of Pandora's Box is one which has survived into modern day, despite its origin being in Greek mythology from thousands of years ago; and the phrase "Pandora's Box" is one which is used today. In Greek mythology the world was inhabited by many creatures, as well as men and gods. One of the most memorable groups of creatures in Ancient Greece were the Harpies, the winged women. 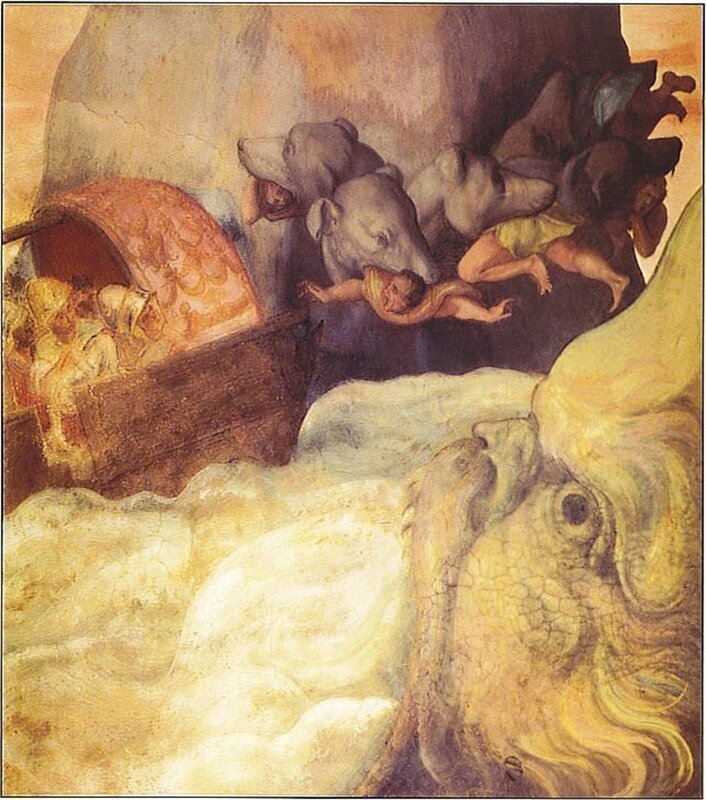 Scylla and Charybdis were two of the monsters that existed in the stories of Greek mythology. 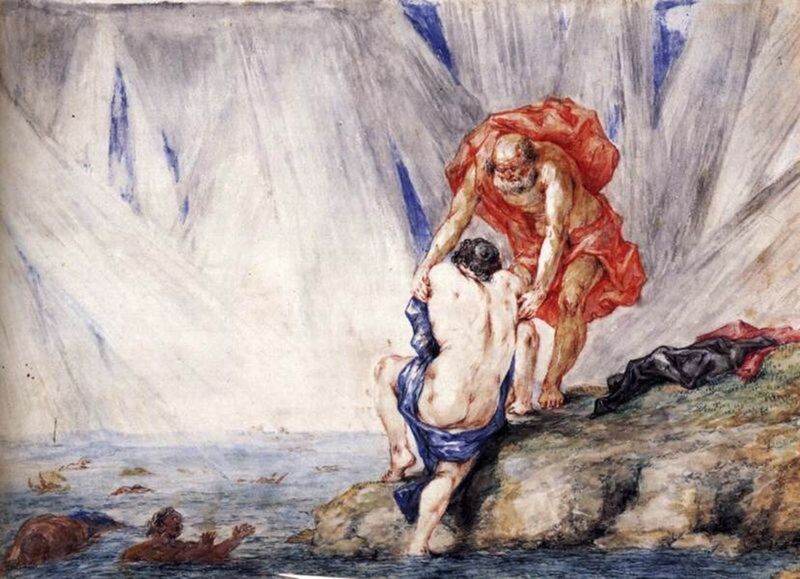 Encountered by Odysseus, the pair would give rise to a saying, "between a rock and a hard place". 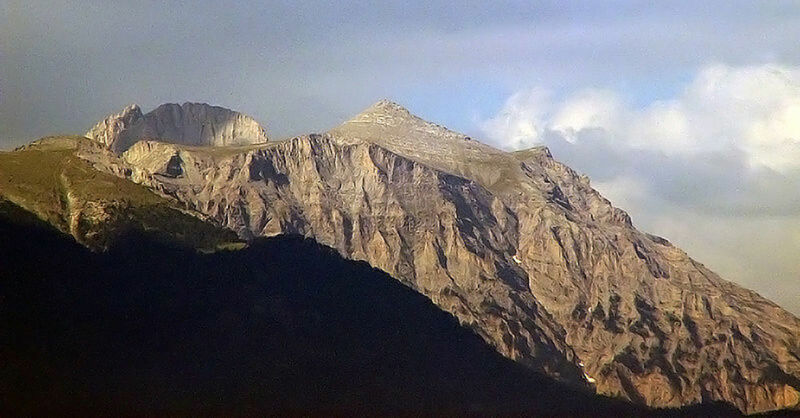 In Greek mythology Mount Olympus was the home to the gods, or at least the Olympian gods. From his palace on Mount Olympus, Zeus would pass observe and judgement on the mortals of earth. 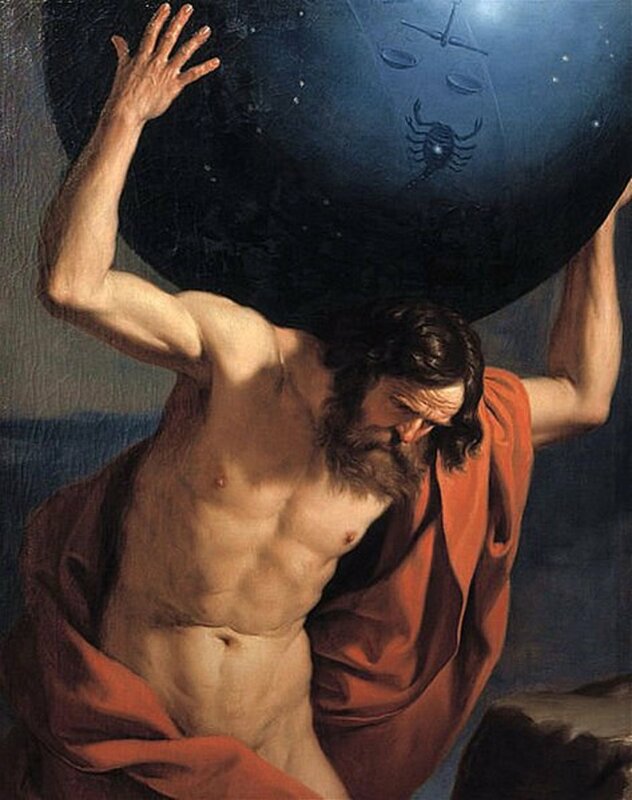 One of the most recognisable of figures of Greek mythology, Atlas was not a god of Mount Olympus, but was from the preceding Titan dynasty. Atlas would be an enemy of Zeus and would be punished. 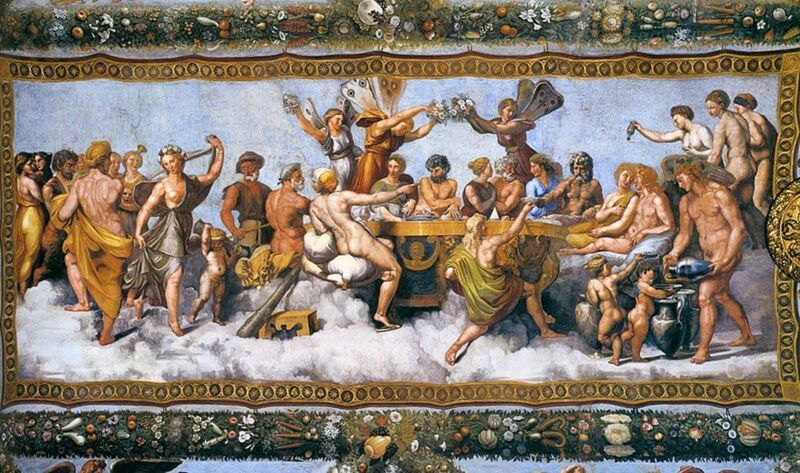 The Olympian gods, the twelve gods of Mount Olympus, are today the most famous gods of the Ancient Greek pantheon, and are central to many of the mythological stories that survive. 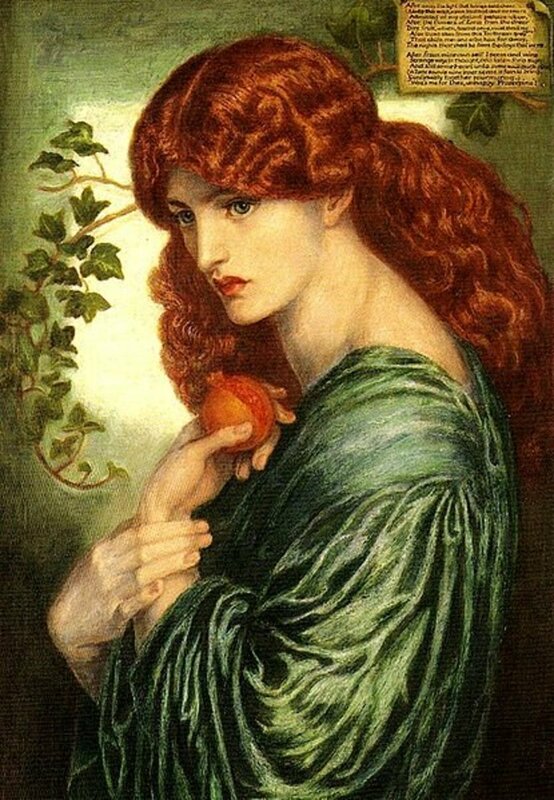 Persephone is one of the deities of the Greek pantheon who is often overlooked, but she was the daughter of Demeter and Zeus, as well as the wife of Hades, so an important goddess in Ancient Greece. 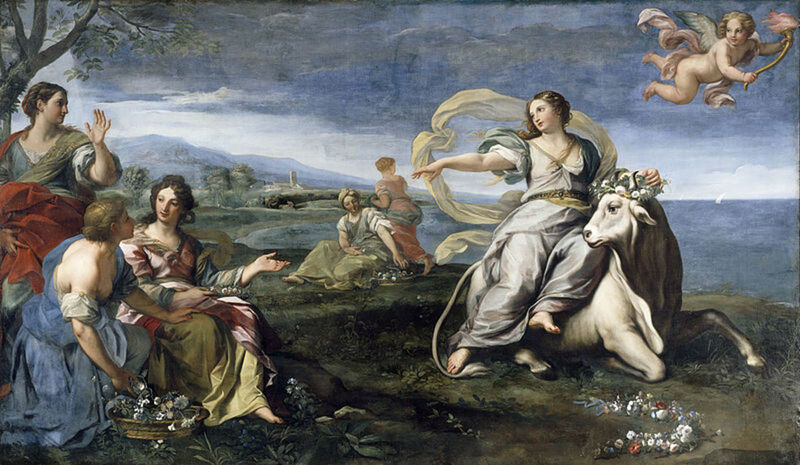 Only a select few Greek deities are well known today, and the name of Phoebe is one most people would not connect with Greek mythology; at one time though she was one of the rulers of the cosmos. Erebus is far from being the most famous of Greek gods, but in his own way he was an important one, as Erebus was the god of Darkness. His presence helped to explain why some places were dark. 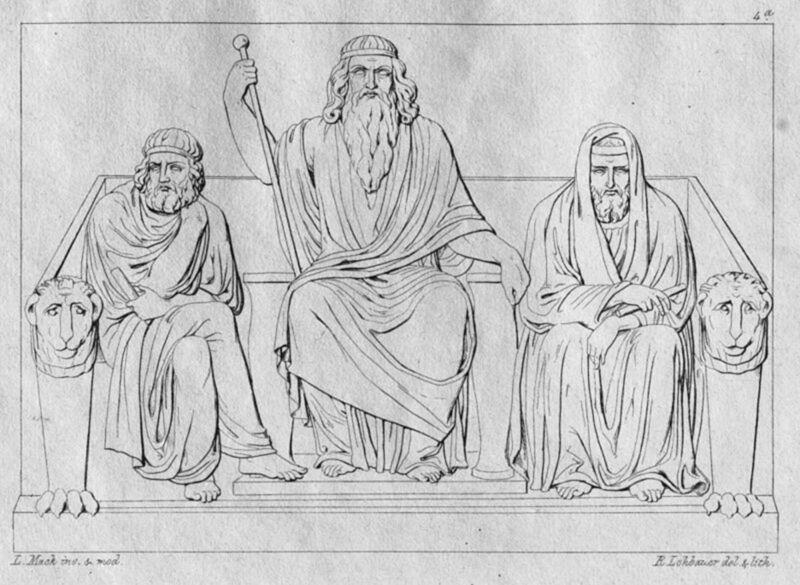 The Titans were the generation of deities that preceded the gods of Mount Olympus before Zeus. Their leader was Kronos who was at the time the supreme ruler of the universe, and indeed father of Zeus.